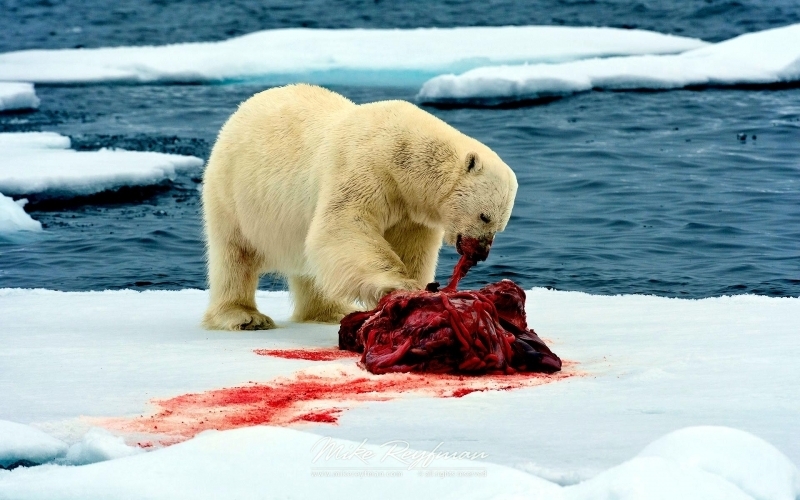 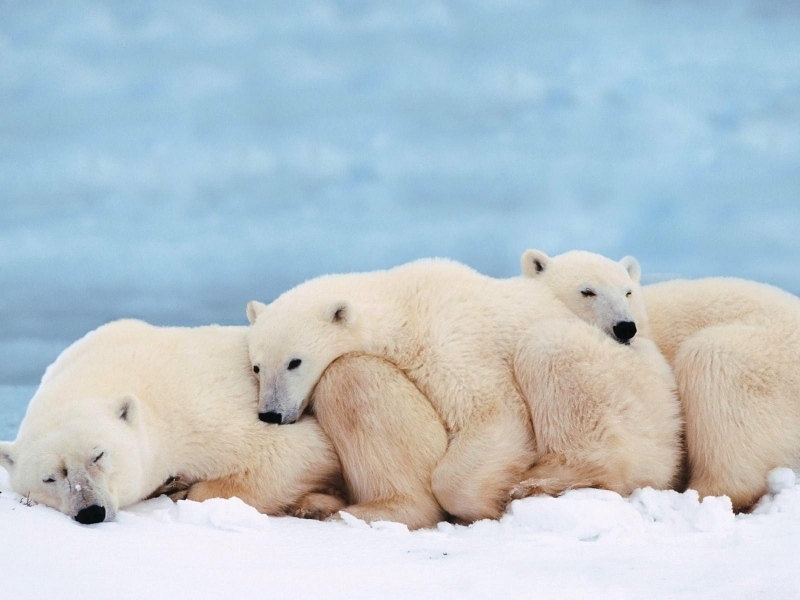 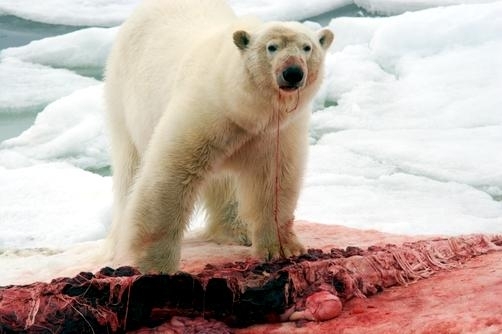 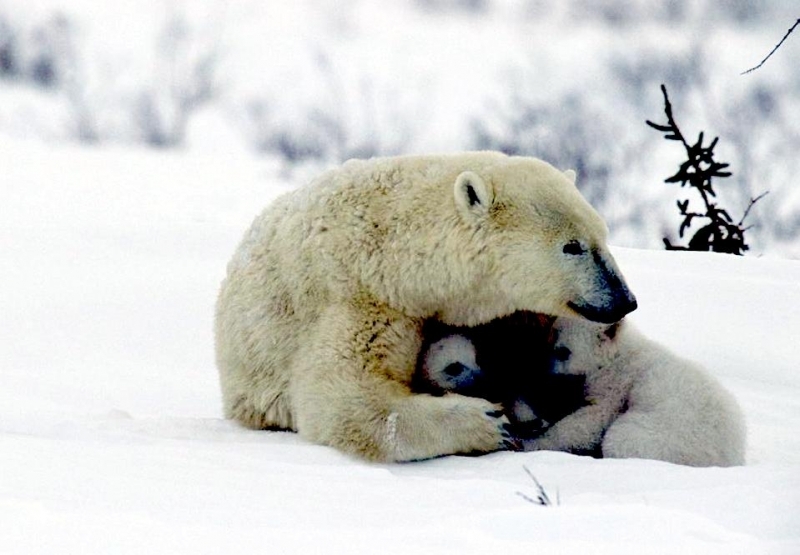 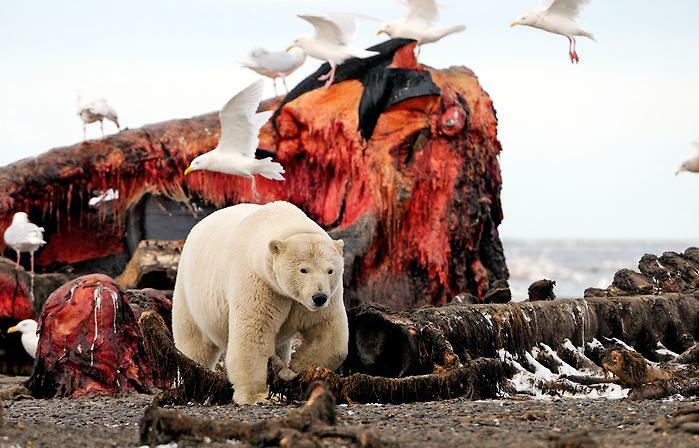 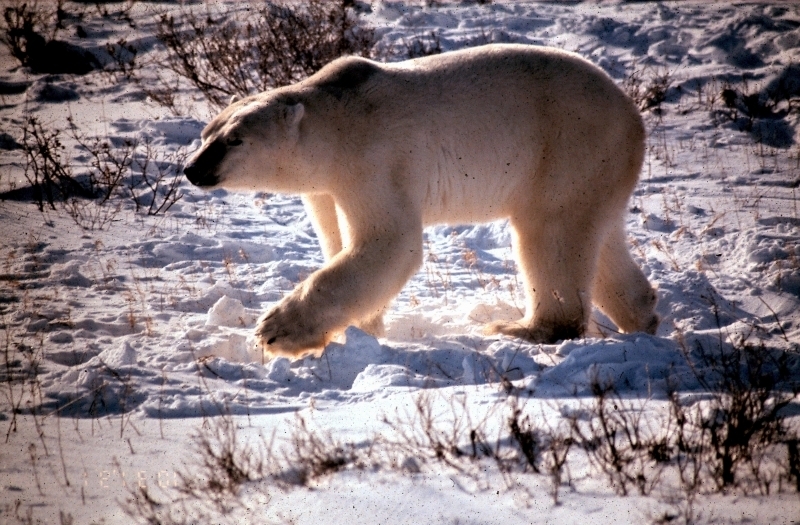 The Polar Bear is the largest species of 8 species of bears that exist on the planet today. 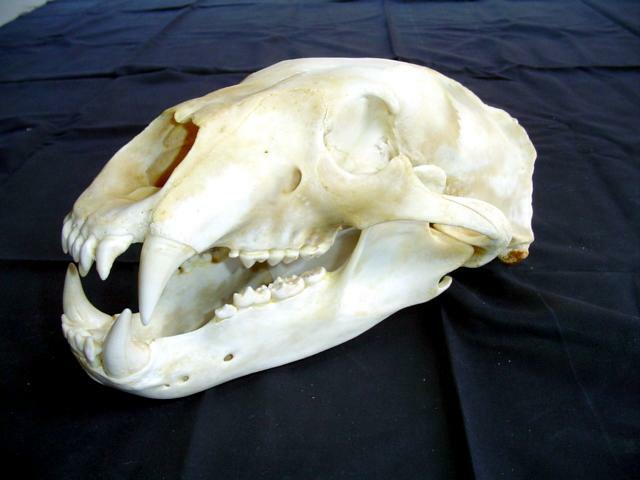 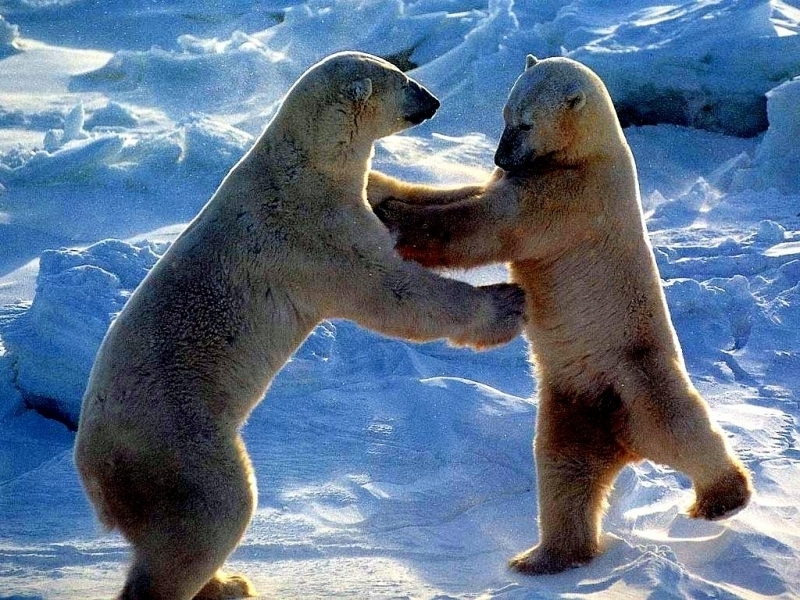 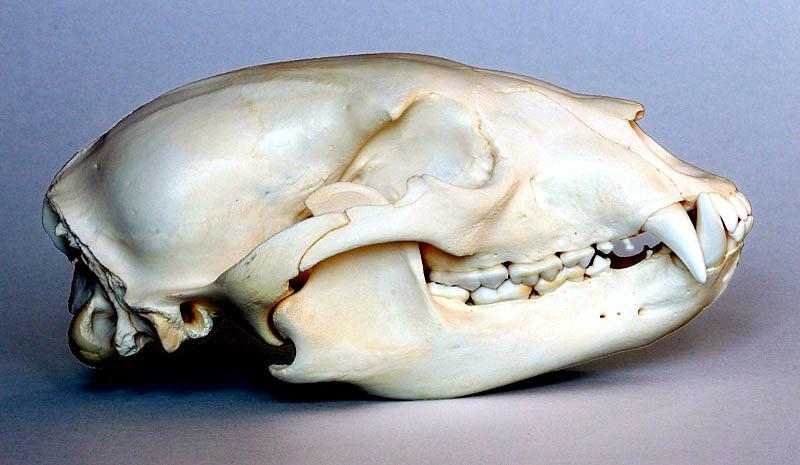 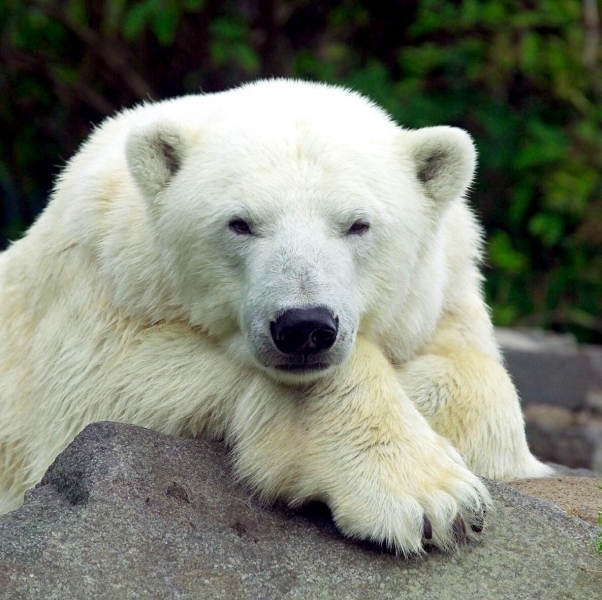 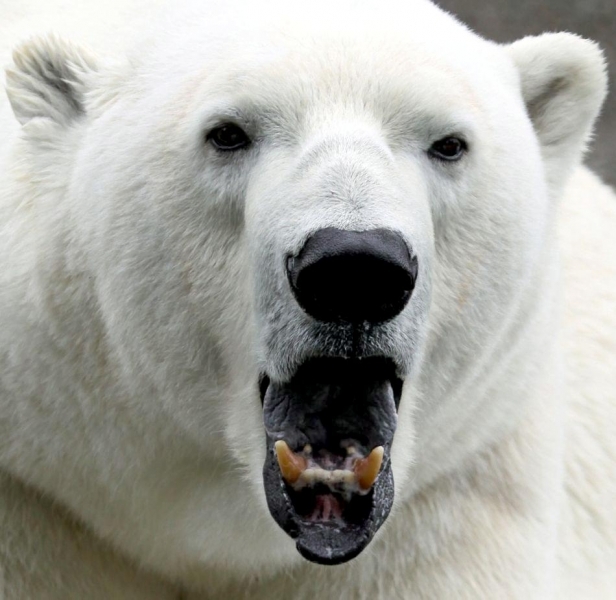 The Polar Bear’s closest relative is the Brown Bear. 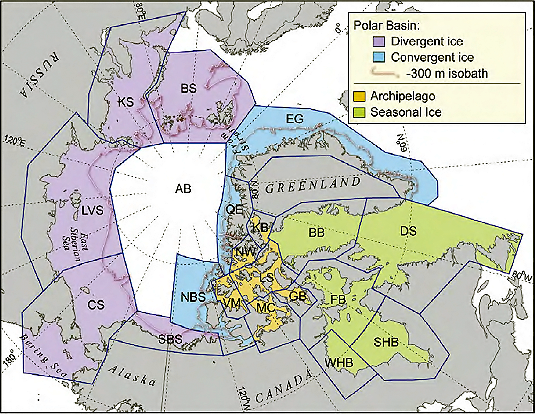 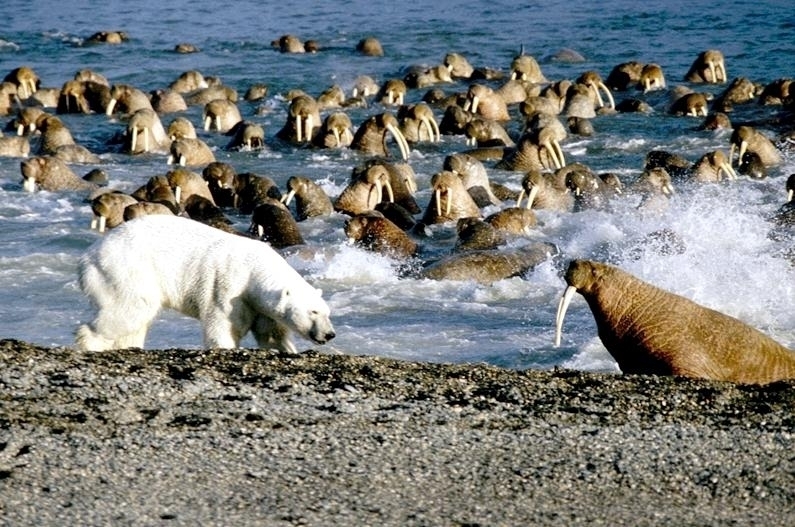 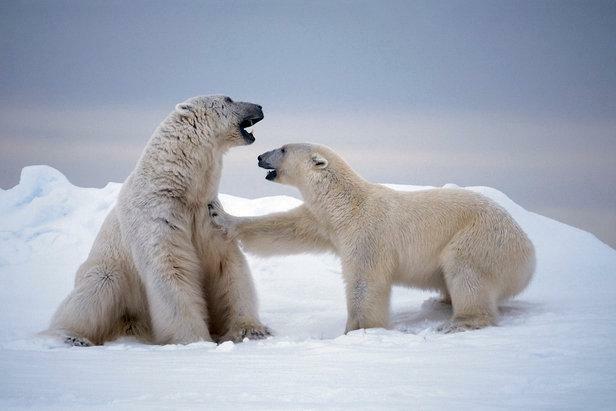 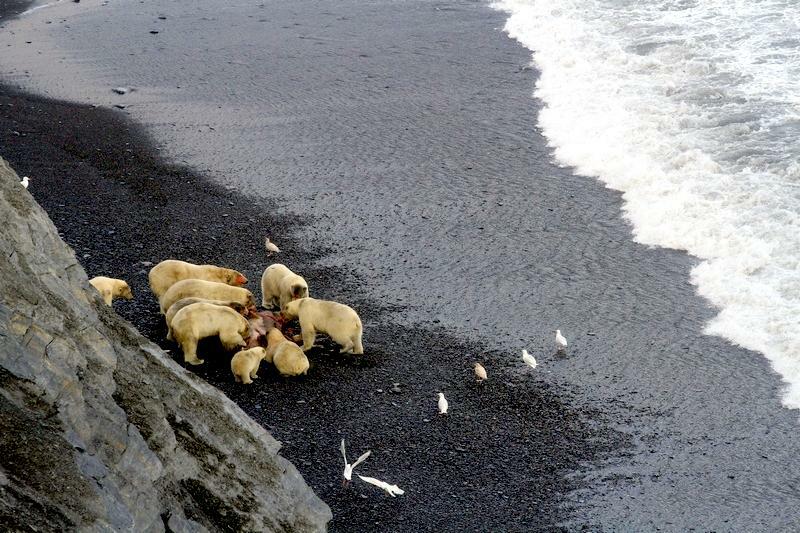 While there are no recognized subspecies of Polar Bears, there are 19 sub-populations. 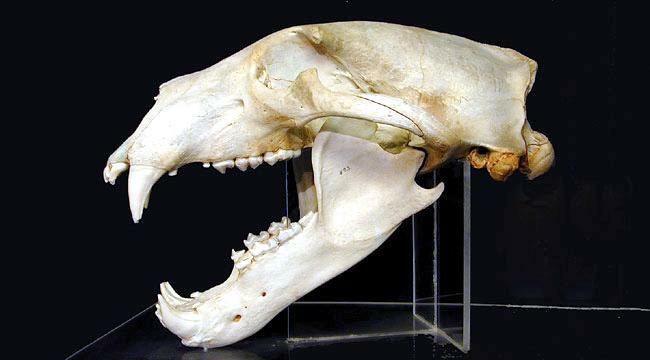 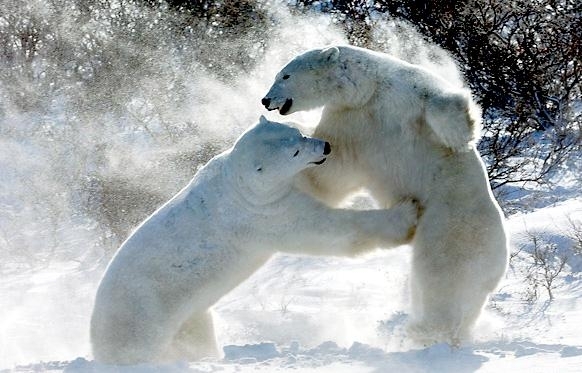 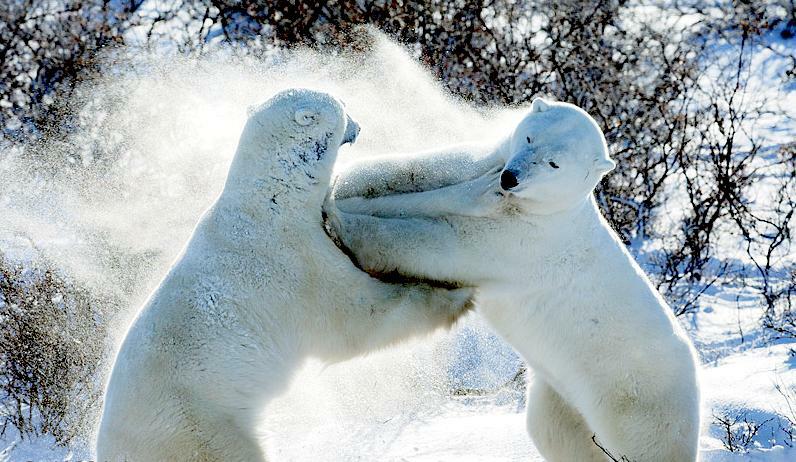 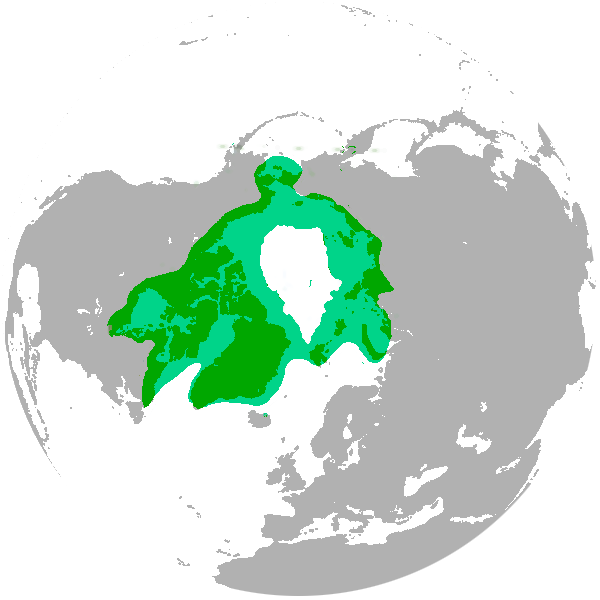 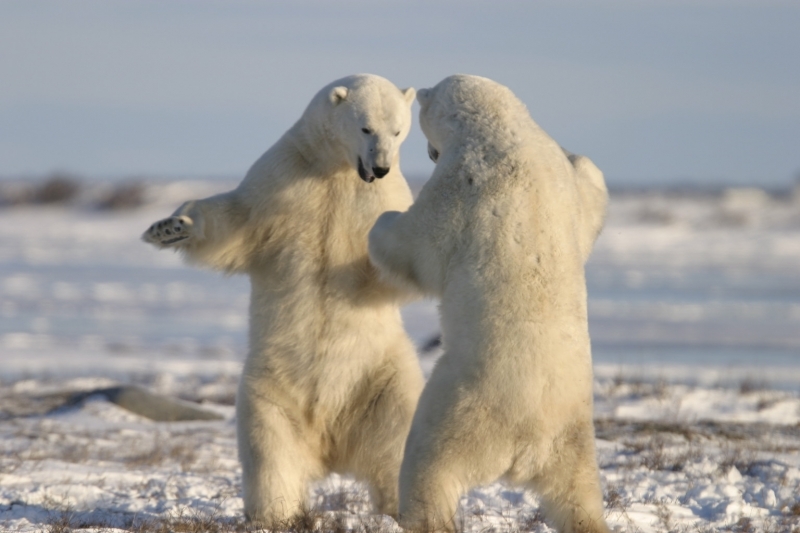 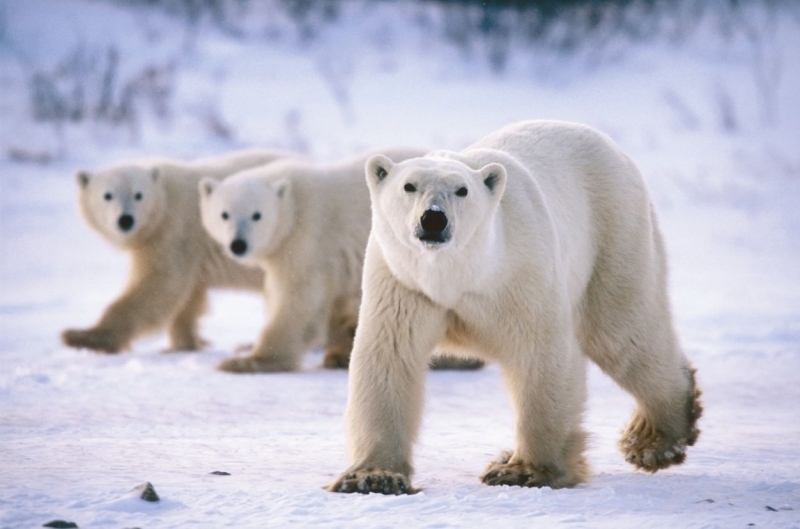 Polar Bears evolved from eastern Russian Grizzly Bears or Alaskan Grizzly Bears some 200,000 to 500,000 years ago. 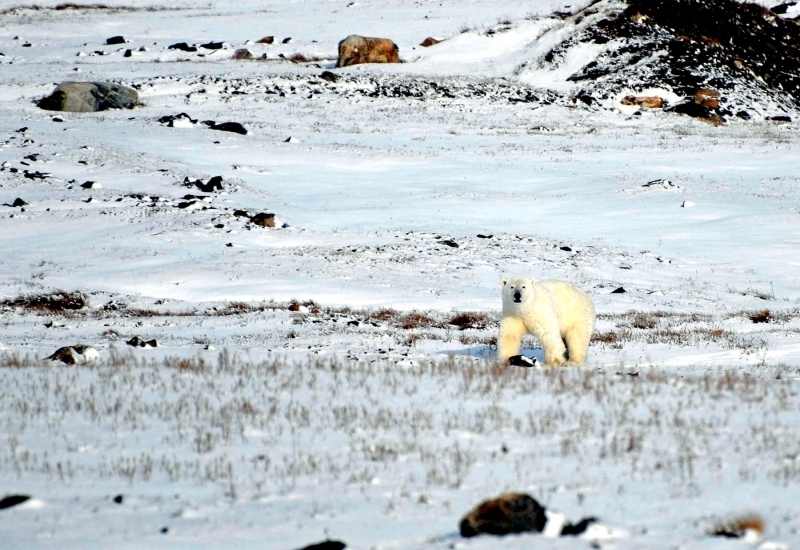 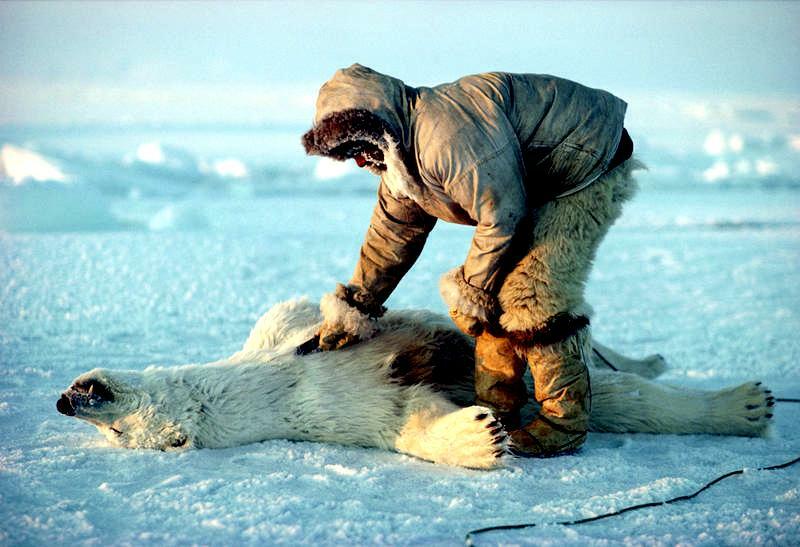 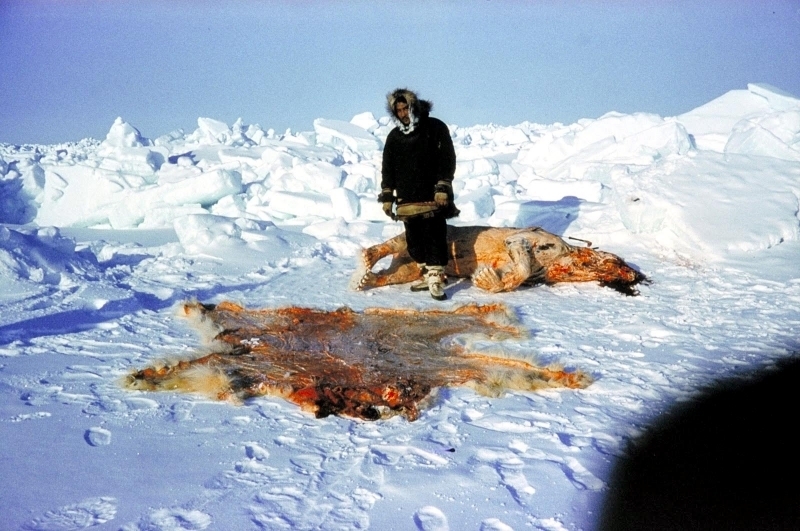 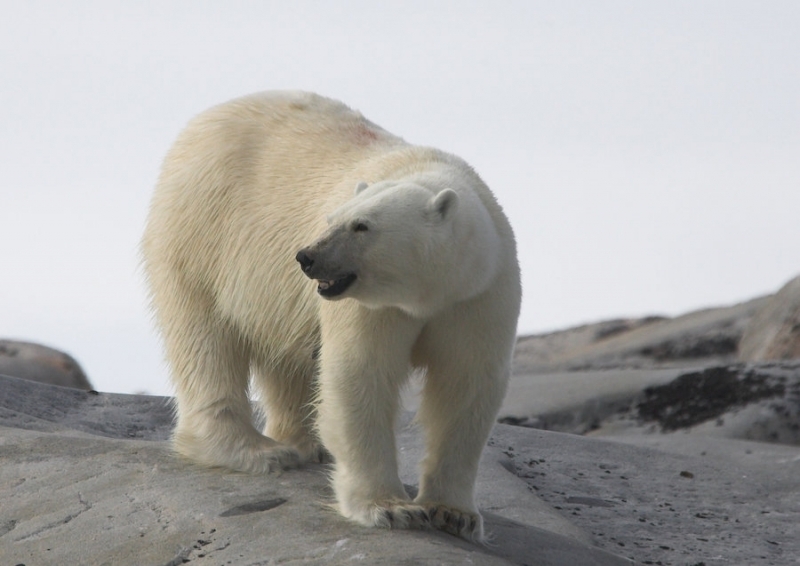 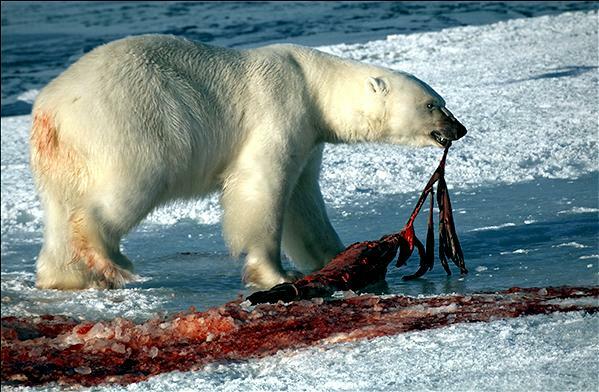 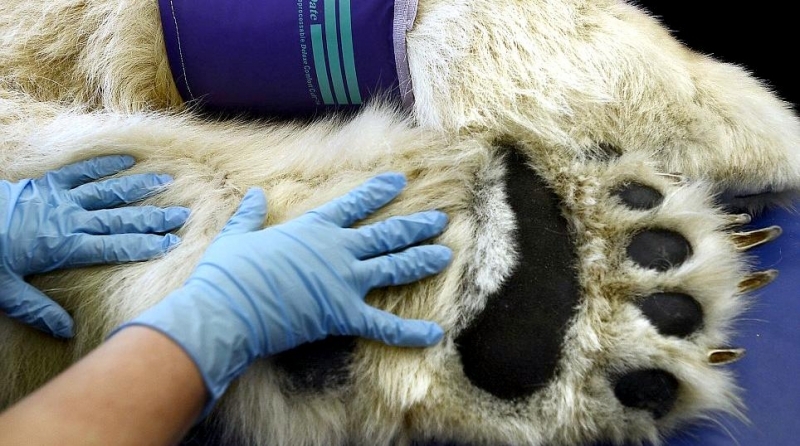 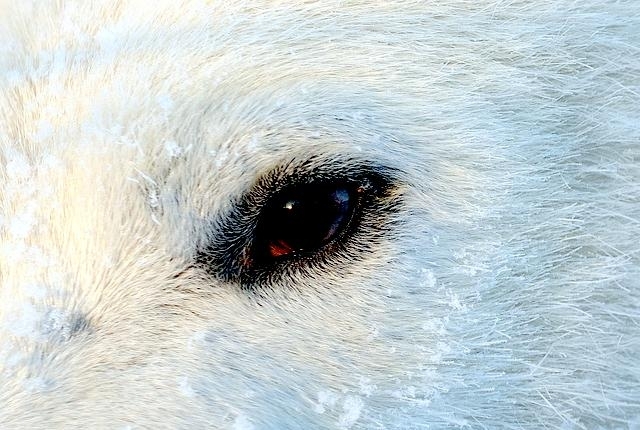 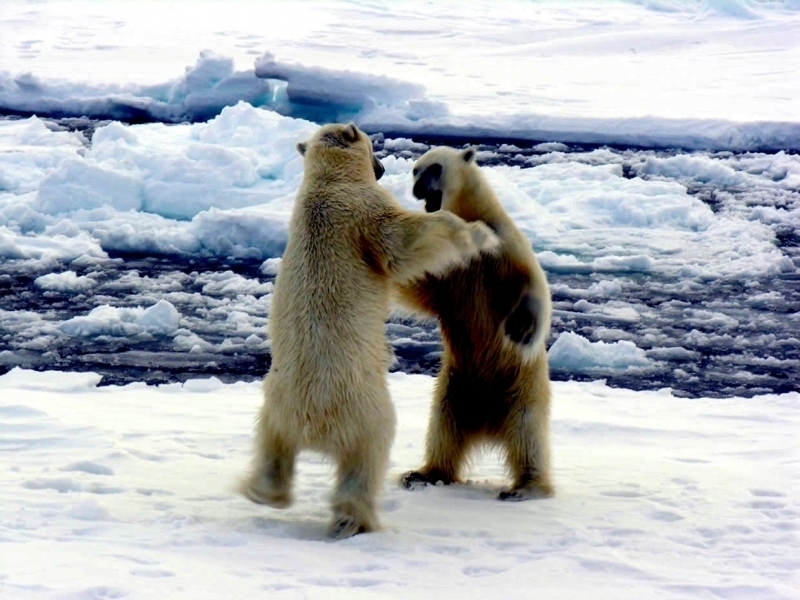 The Inuit people call a Polar Bear “Nanuk” and believe it is worthy of the highest respect. 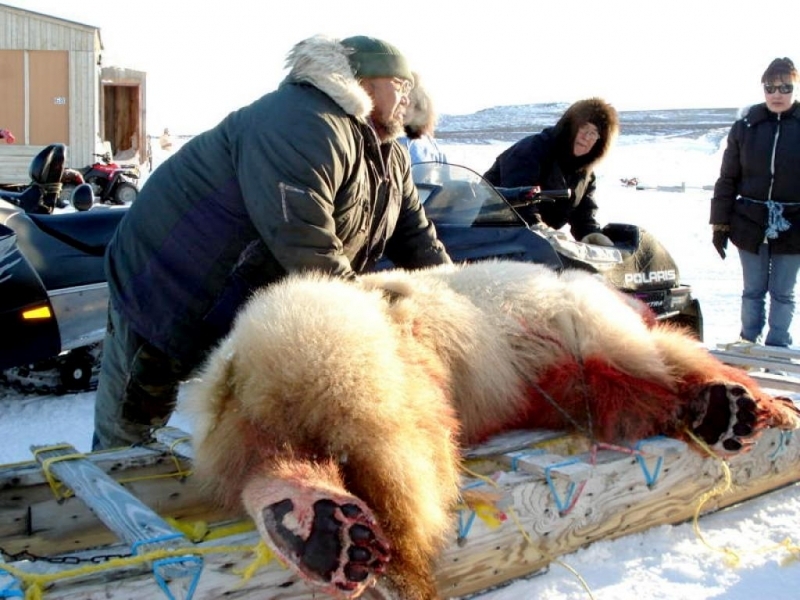 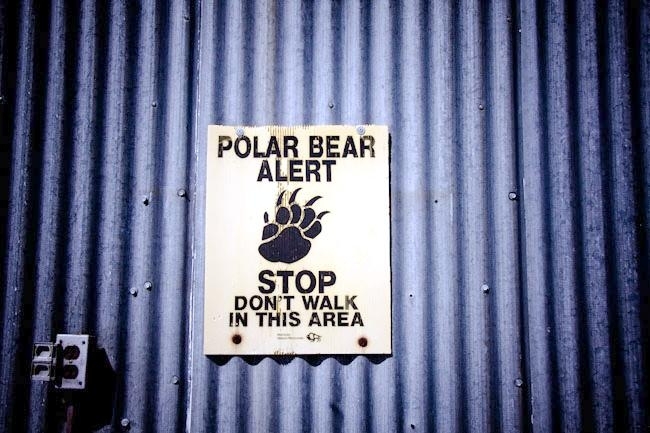 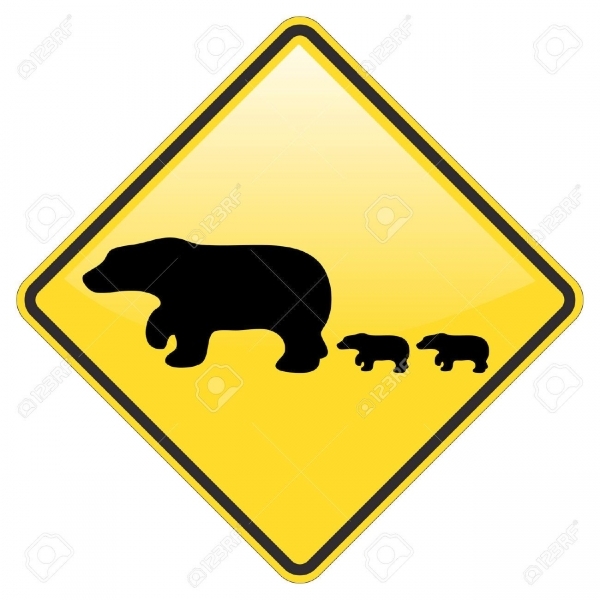 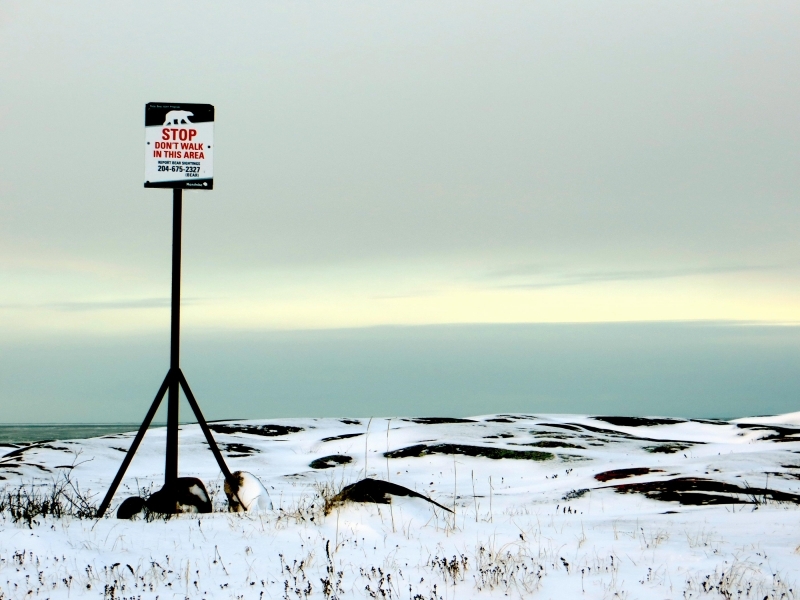 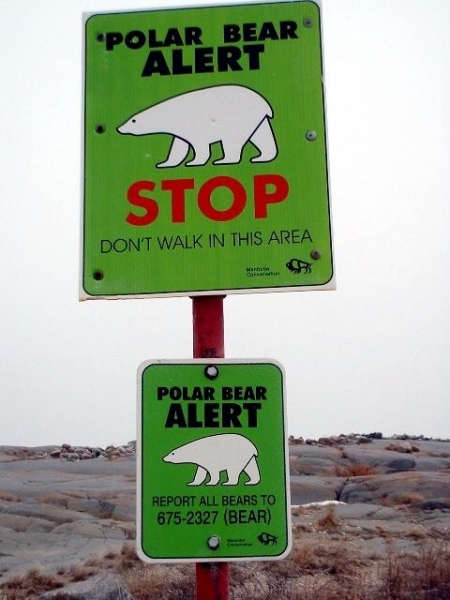 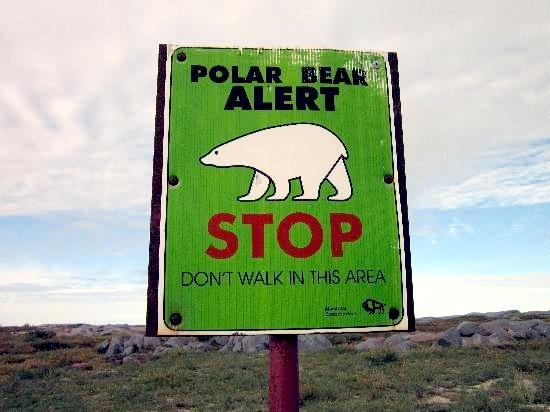 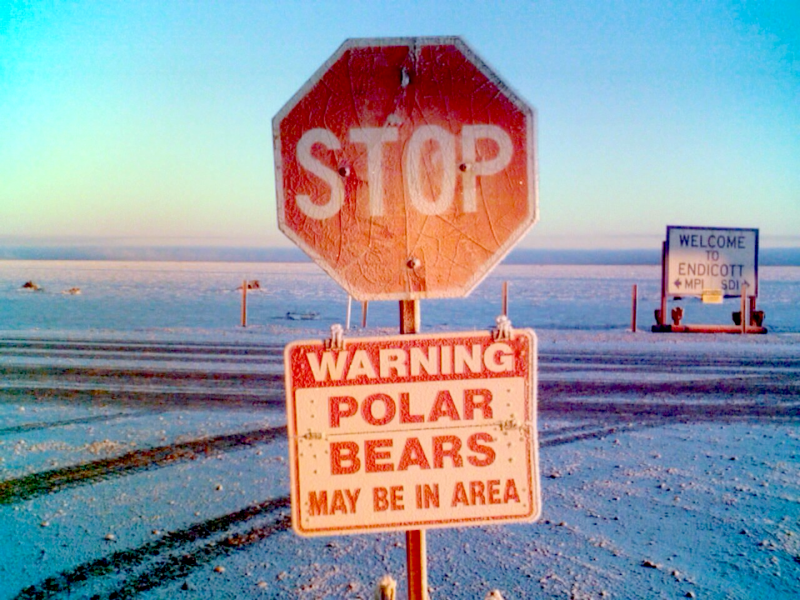 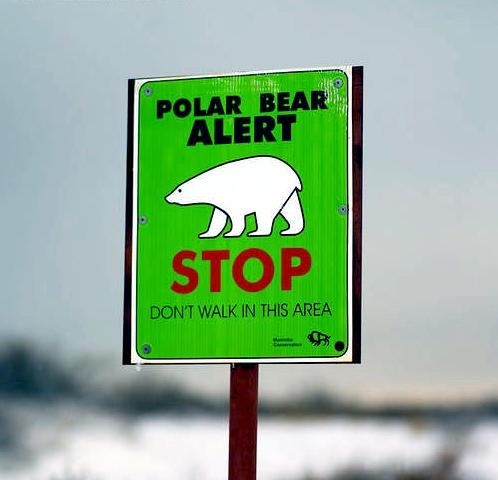 The Sami or Lapp communities refuse to say the bear’s name for fear of offending it. 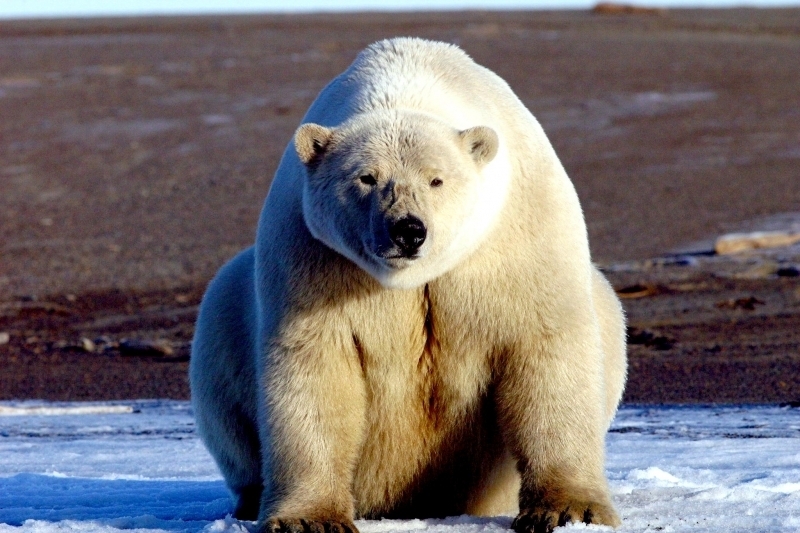 An adult male grows usually weighs between 775 to 1,200 pounds and will reach its full adult size between the ages of 8 to 14 years. 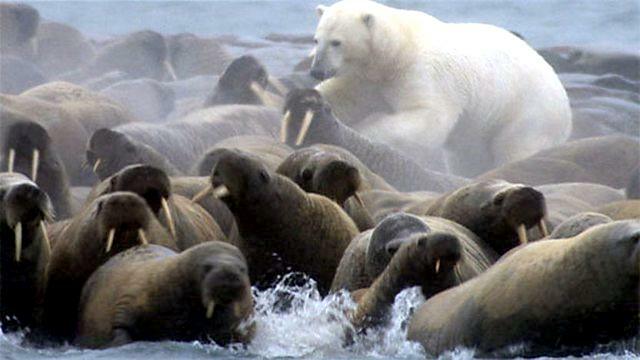 Adult females are half the size of their male counterparts (330 to 650 pounds) and reach full size at around age 5 to 6 years. 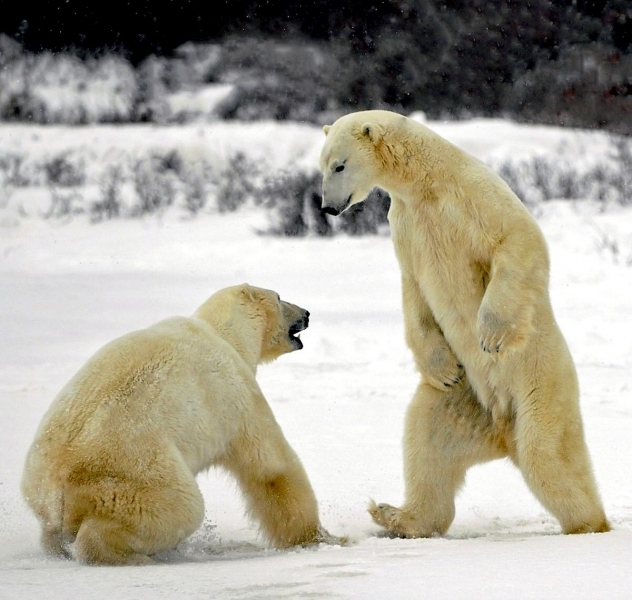 The height at their shoulders when they are on all fours is usually between 3.5 to 5 feet for males and females. 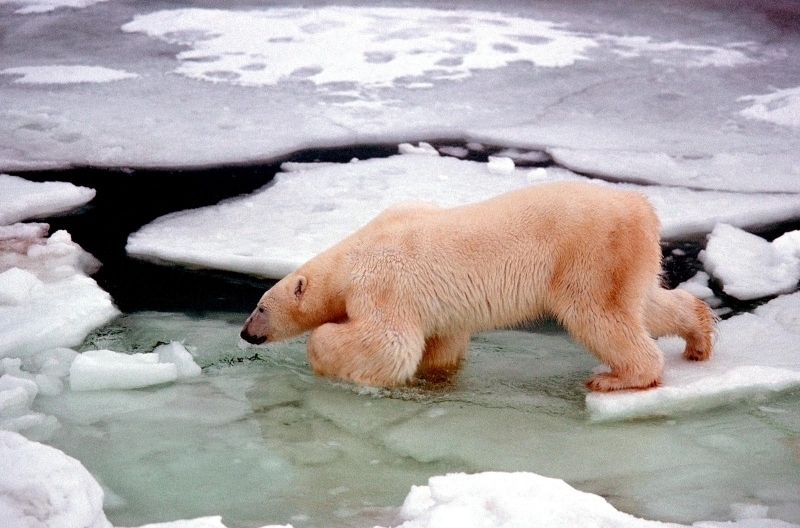 The life expectancy of a Polar Bear in the wild is typically between 15 to 18 years, but can go up to age 30. 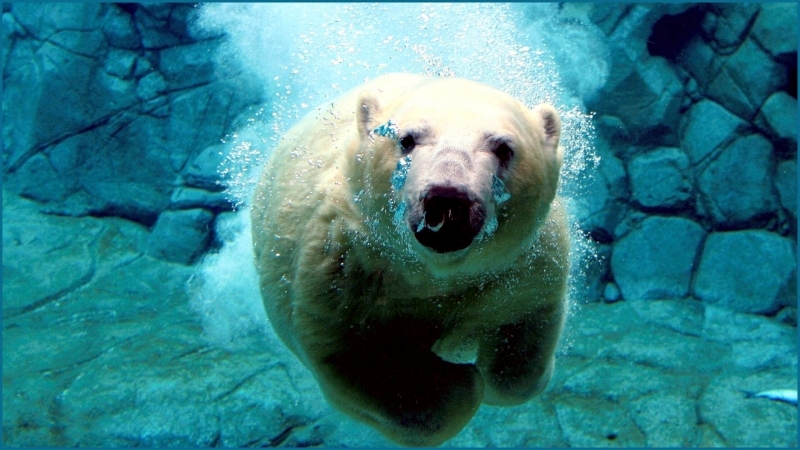 In captivity, they typically live into their 30’s. 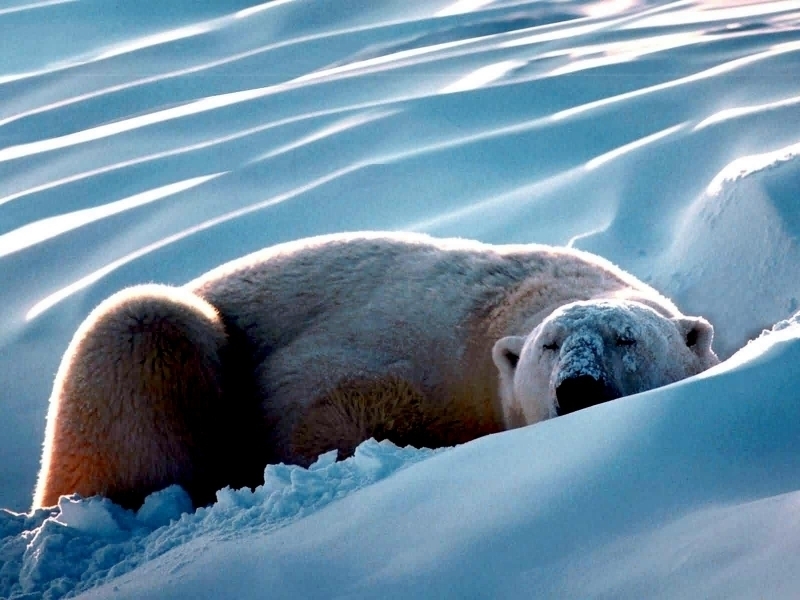 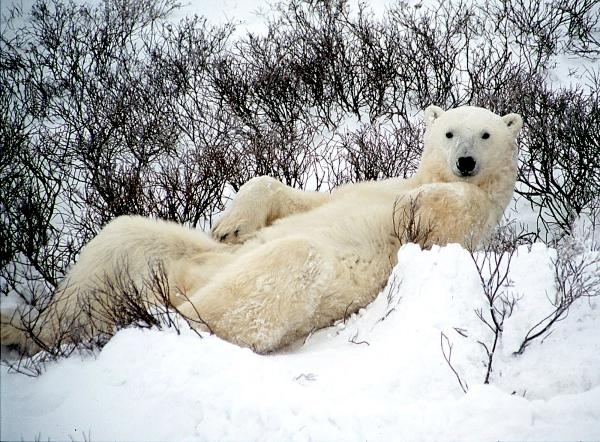 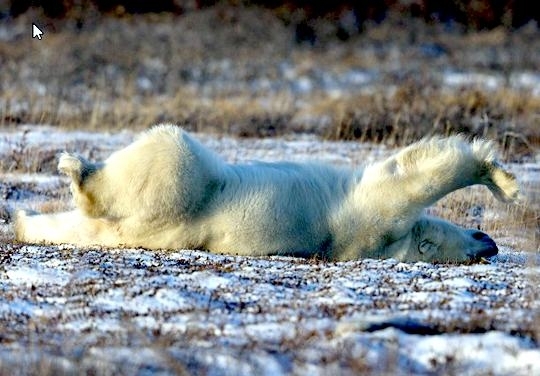 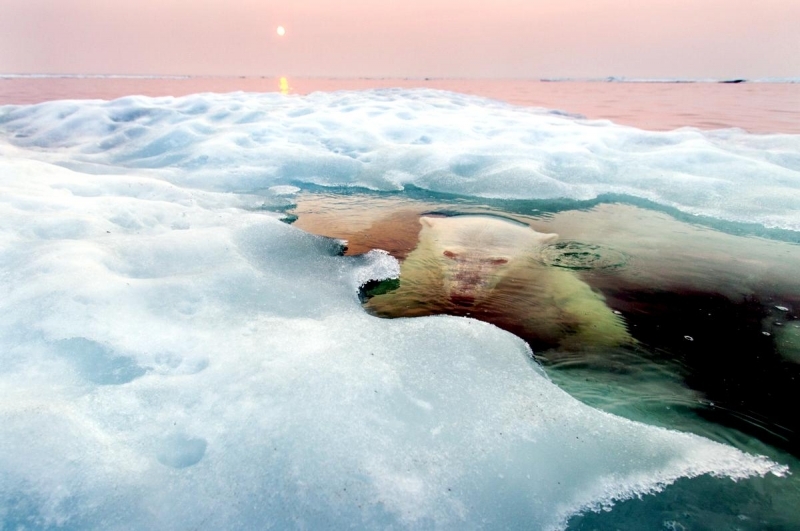 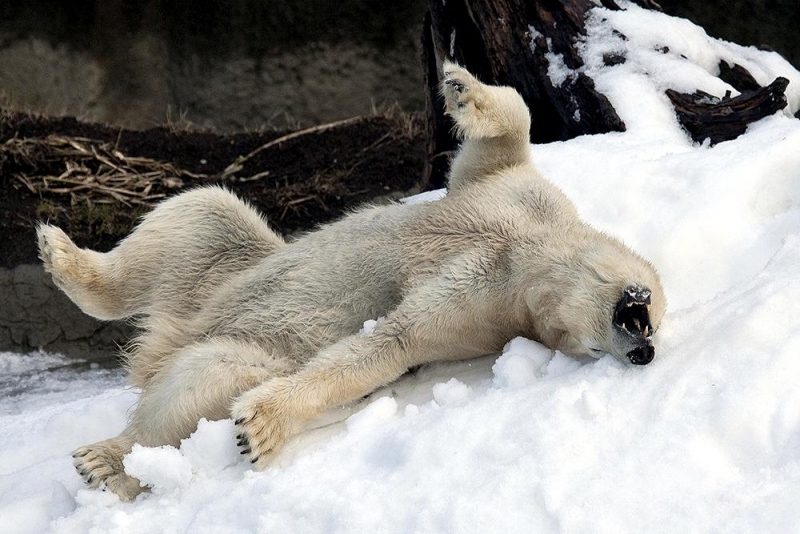 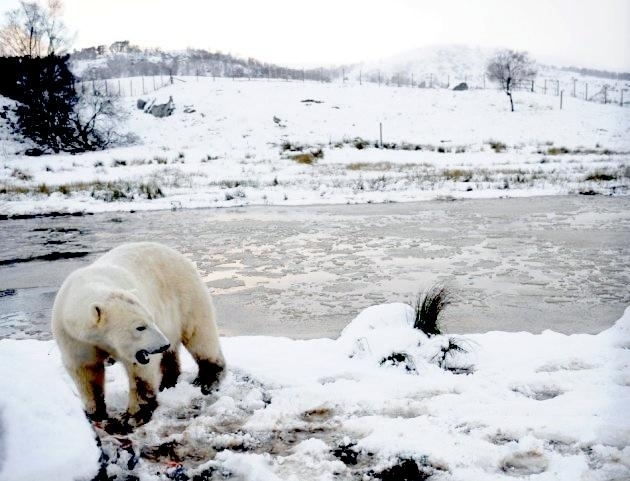 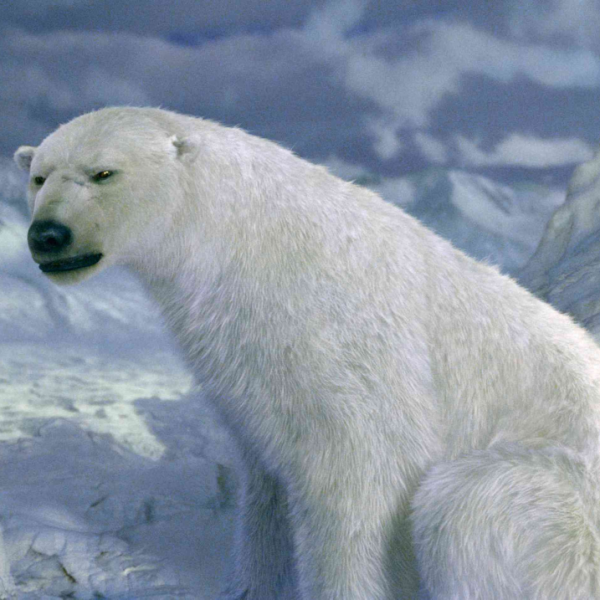 The Polar Bear is perfectly suited to its frigid, icy habitat. 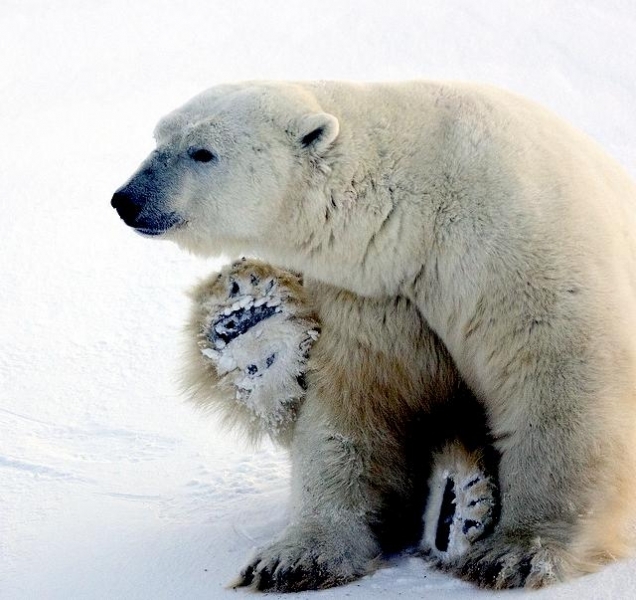 They have 2 layers of fur, glossy, waterproof ‘guard’ hairs & dense under-fur and a thick layer of fat (2 to 4 inches) beneath their skin that helps keep them warm. 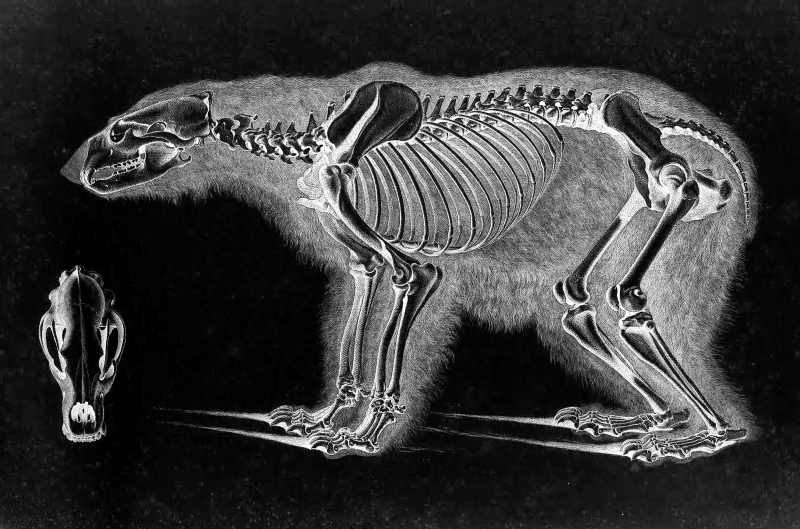 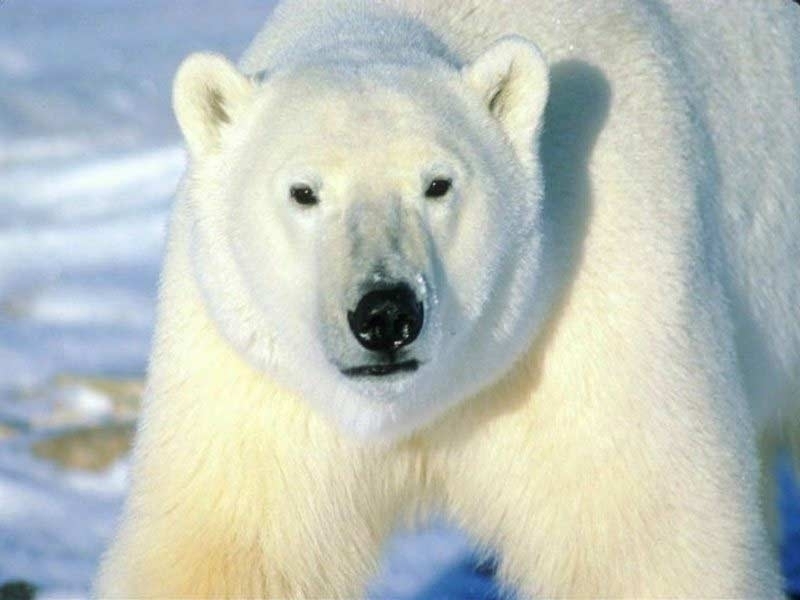 Though it has white fur, the skin of a Polar Bear is black. 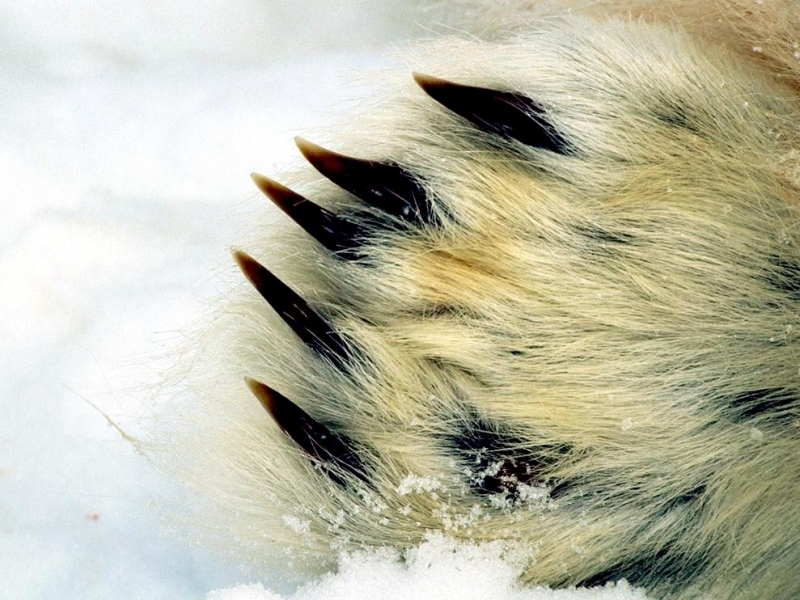 They also have small a small tail & ears, which help prevent heat loss. 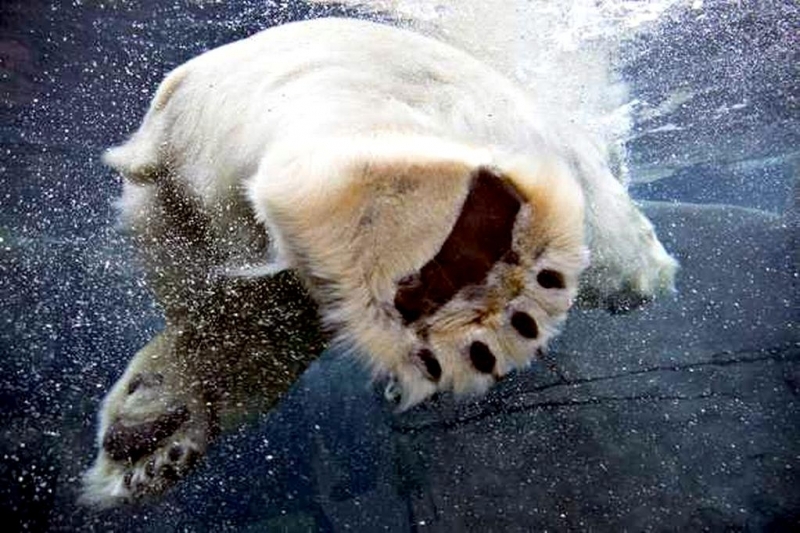 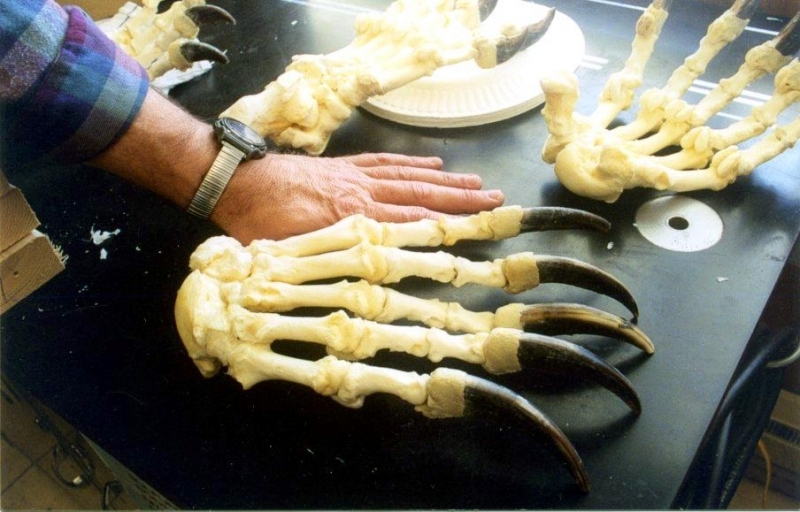 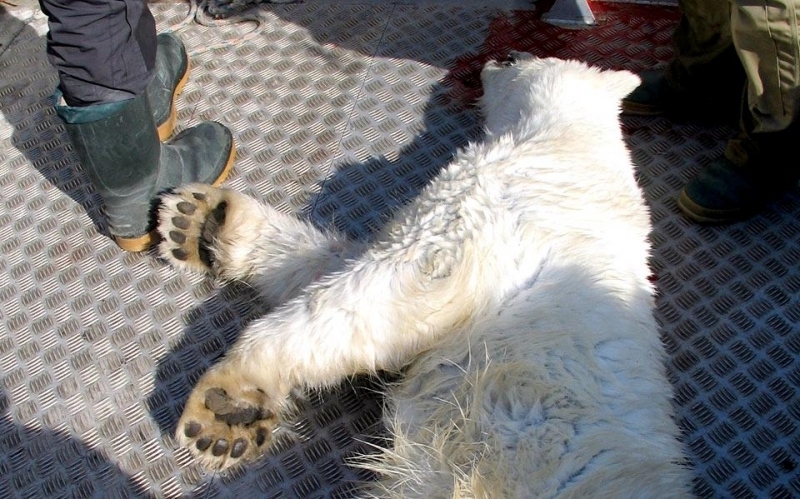 Their feet are furry and their soles are covered called papillae that give them traction against the ice. 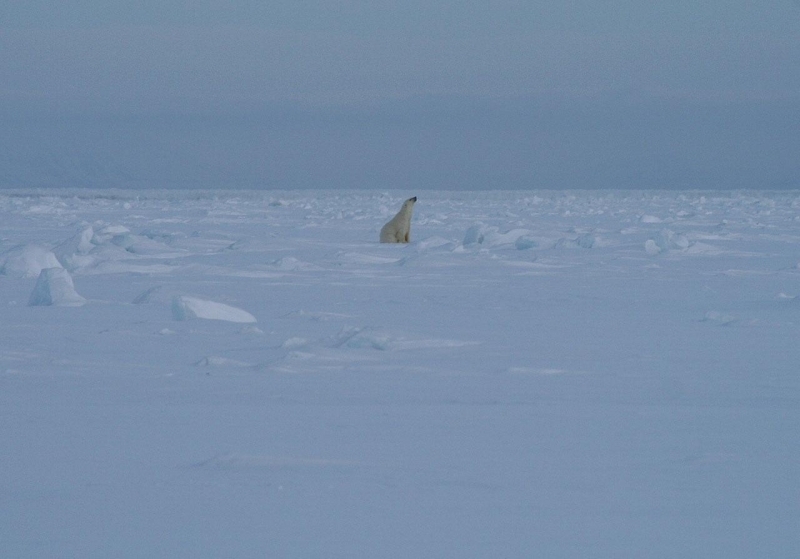 Their white color acts as the ideal camouflage and protects them from hunters, while helping to conceal them from the prey they hunt. 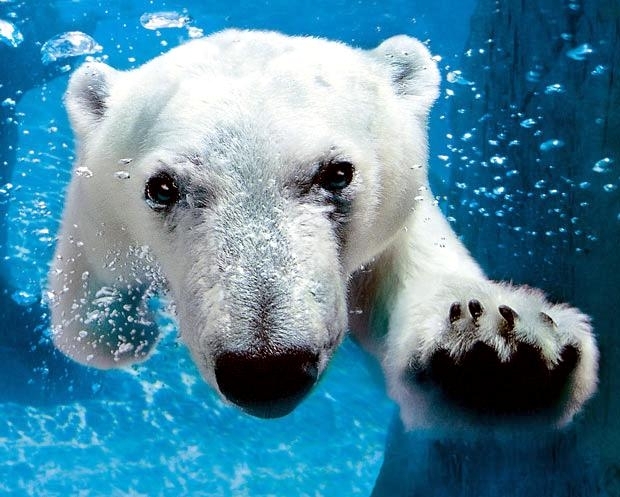 Polar Bears are efficient swimmers thanks to their webbed feet and can swim for hours and many dozens of miles without a break as they search for food. 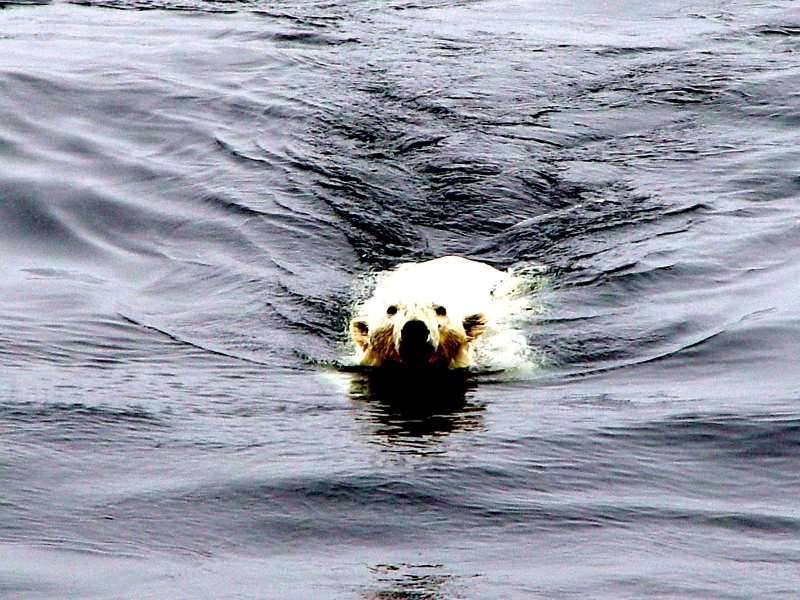 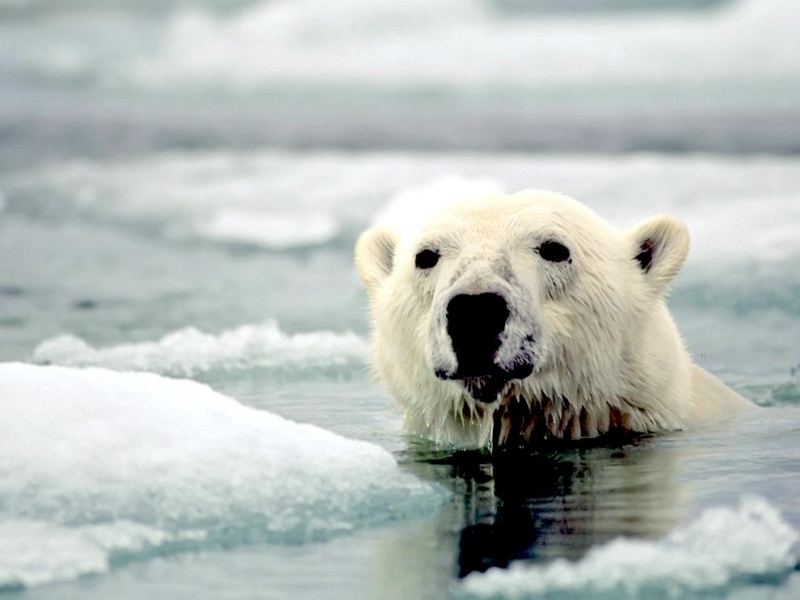 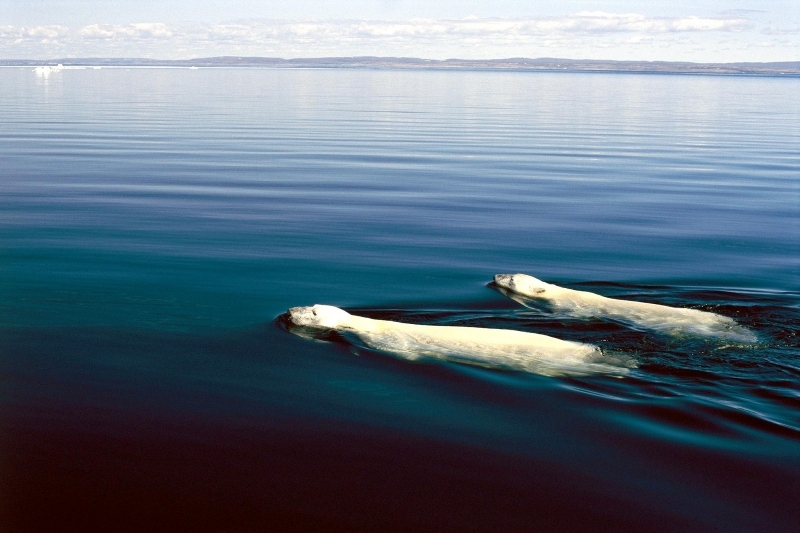 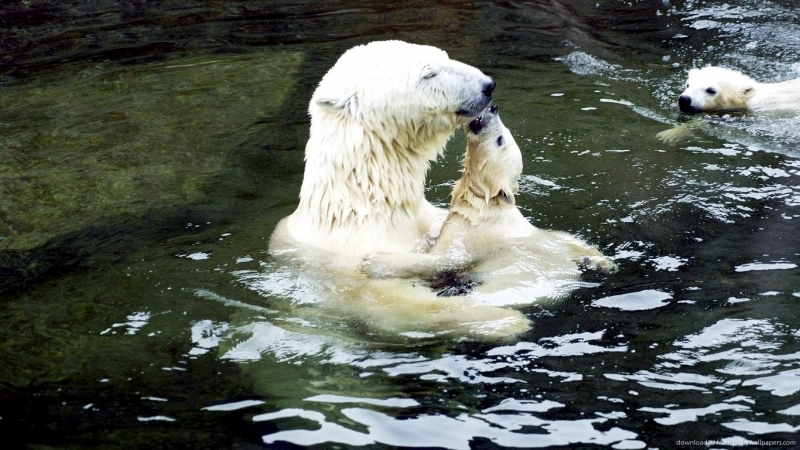 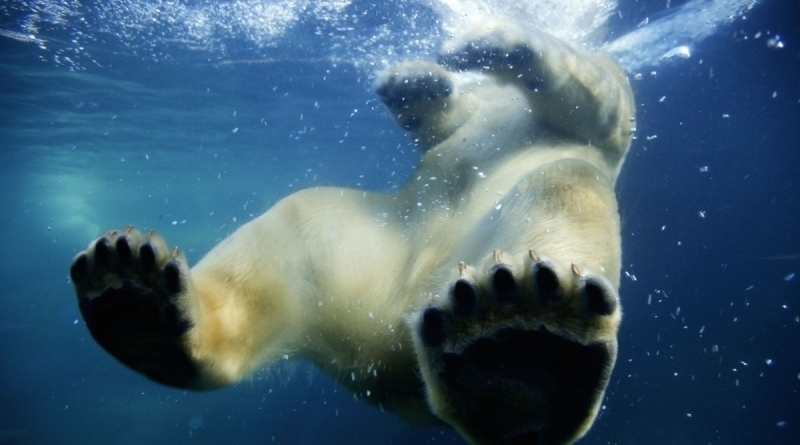 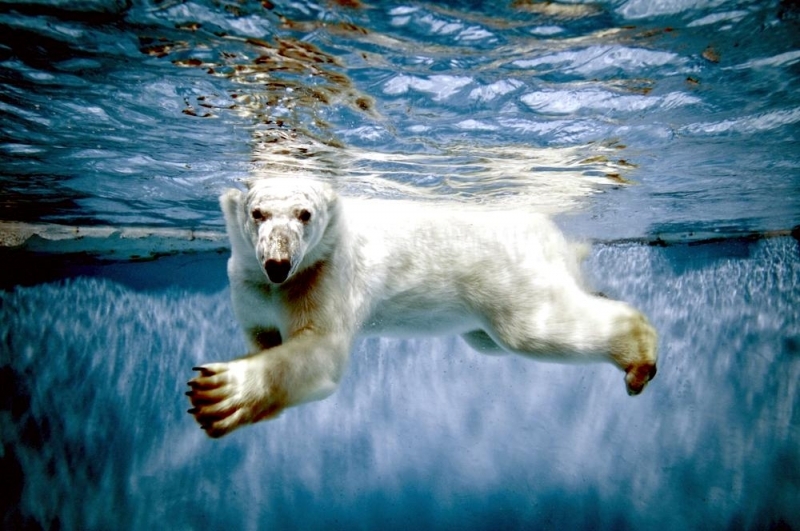 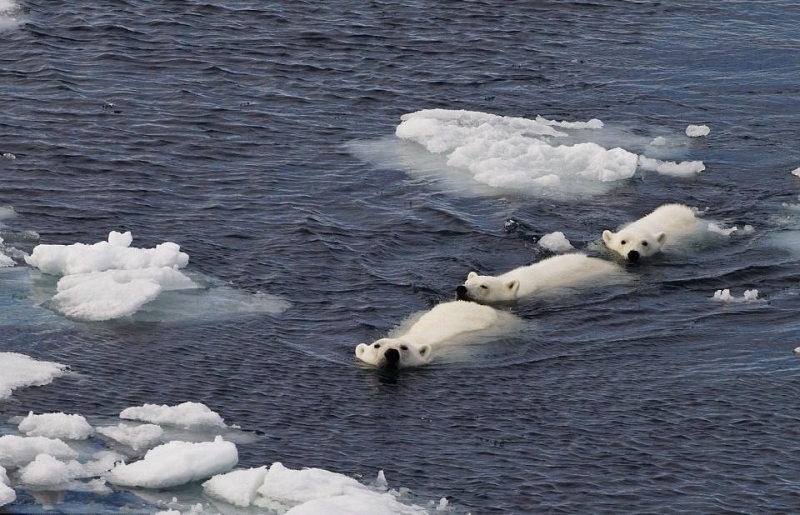 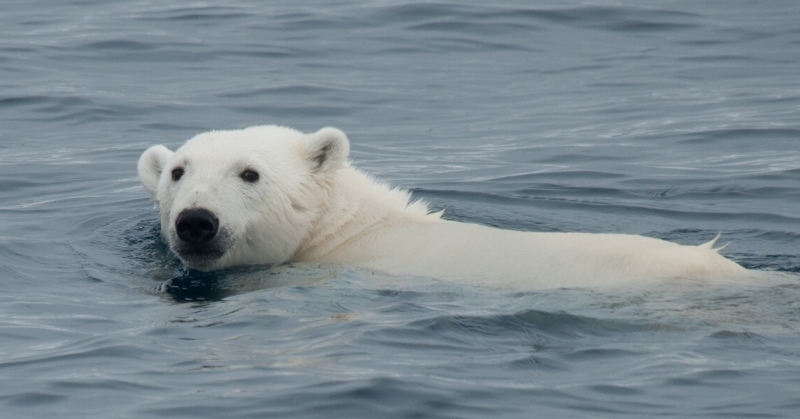 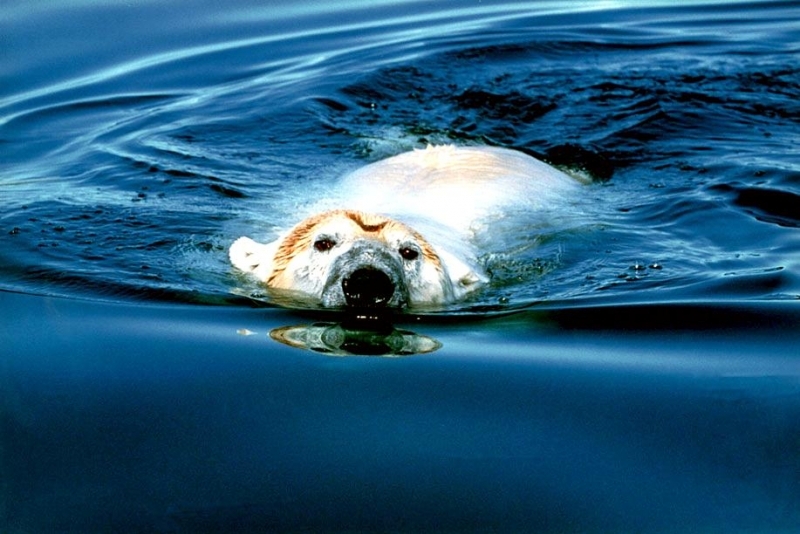 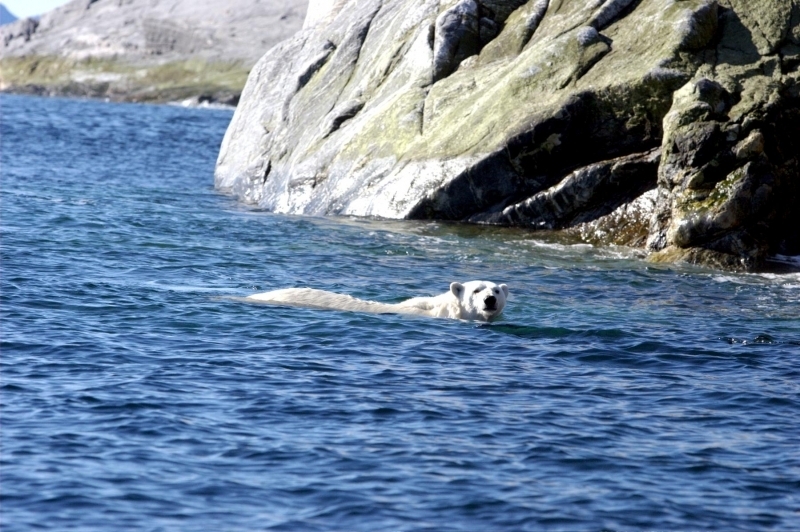 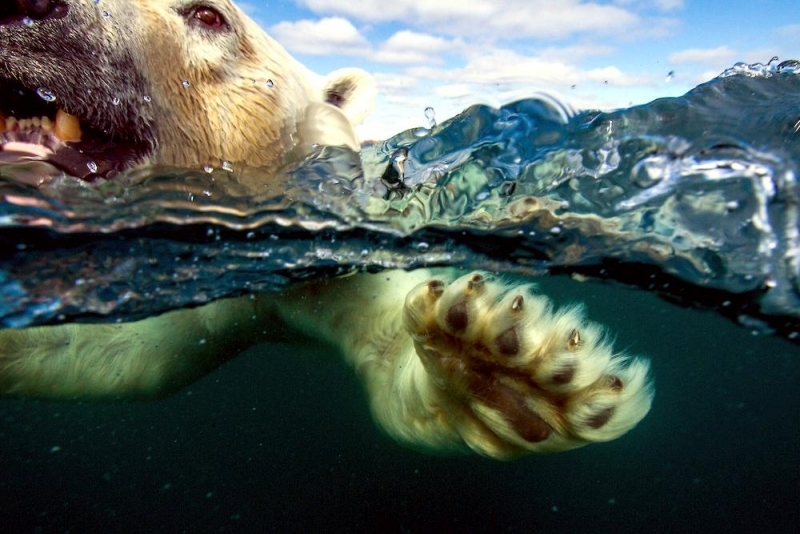 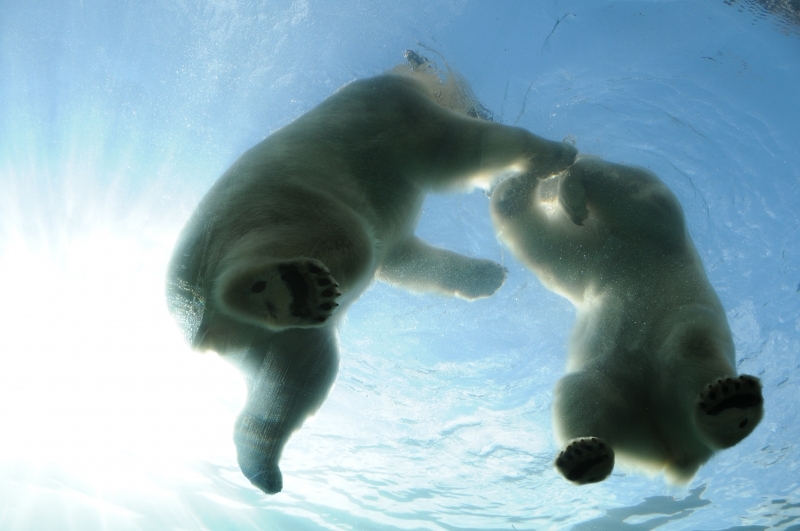 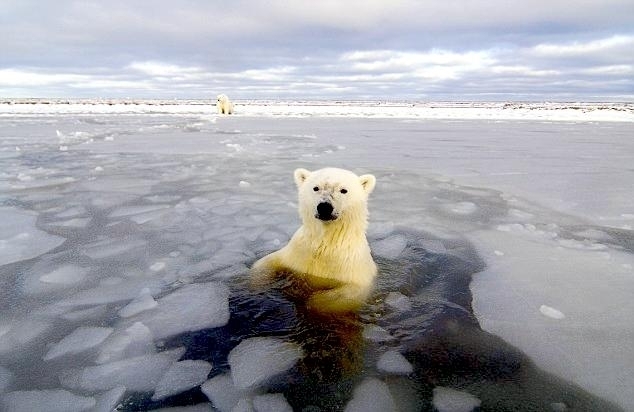 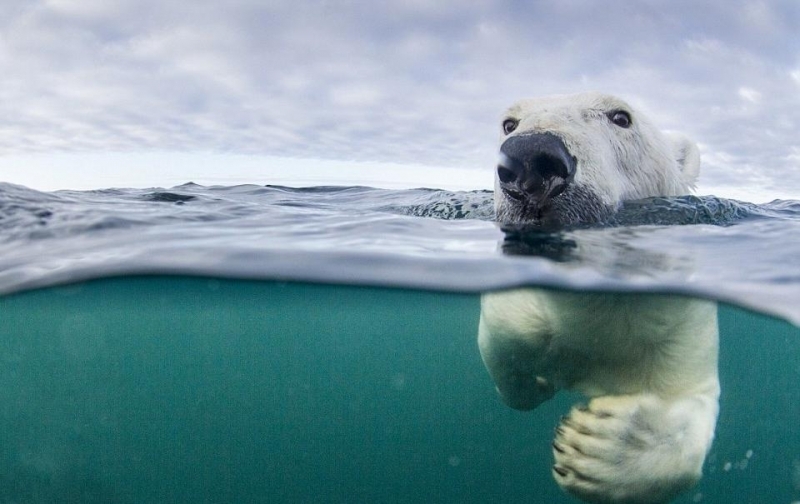 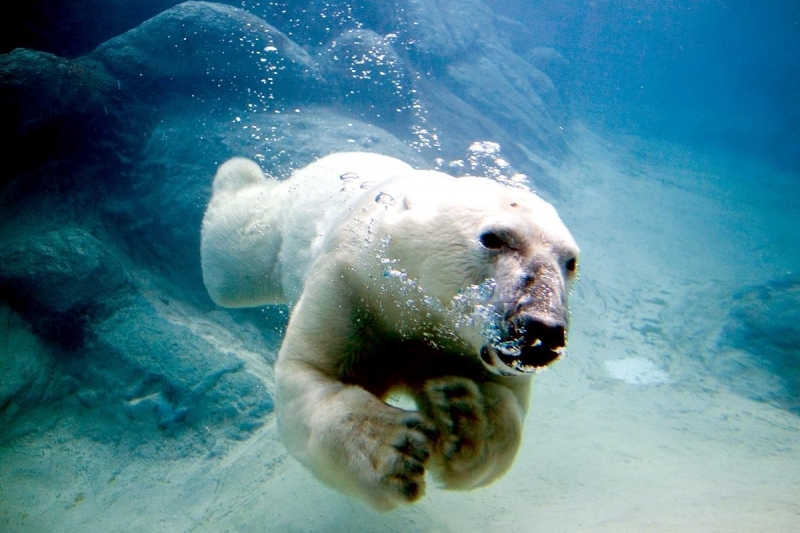 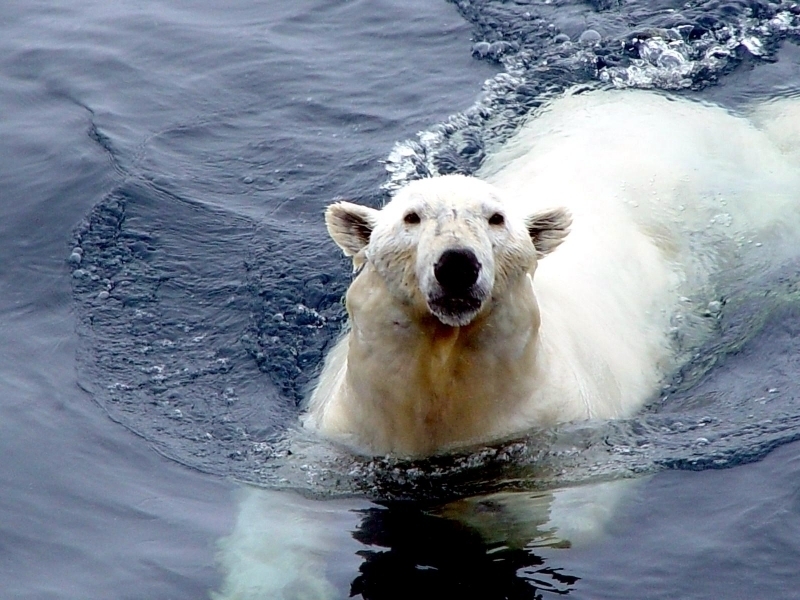 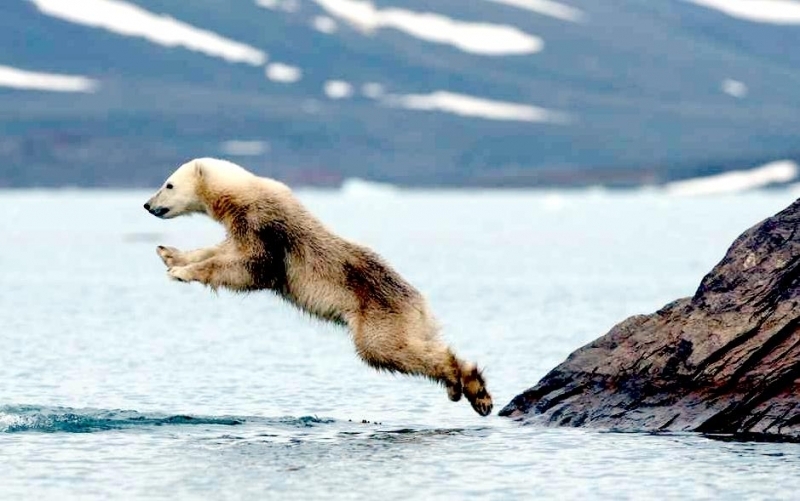 A Polar Bear’s fat also helps them float in water. 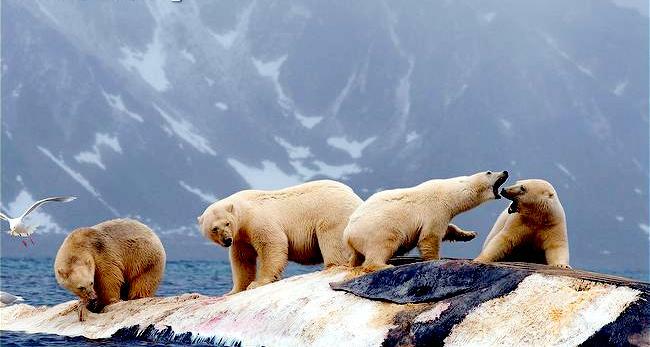 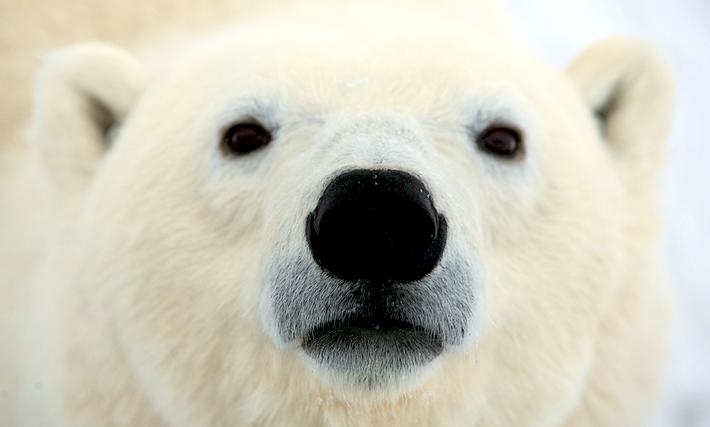 Polar Bears use their keen sense of smell to sniff out their prey. 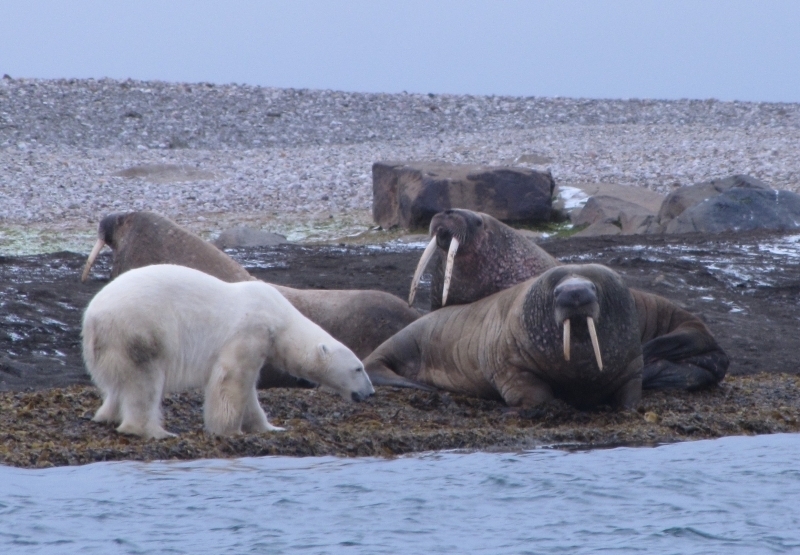 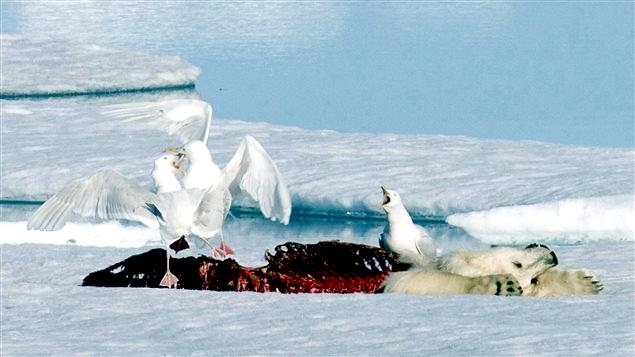 They eat mostly Ringed Seals and Bearded Seals specifically their fat, which is a high calorie source of food and helps them build up fat reserves to tide them over between meals. 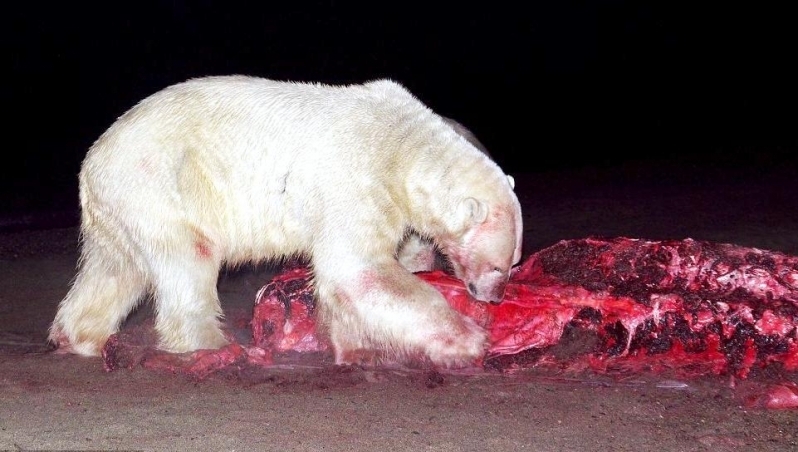 If a Polar Bear has not fed over a period of 7 to 10 days, it has the ability to slow its metabolism until it is able to feed again. 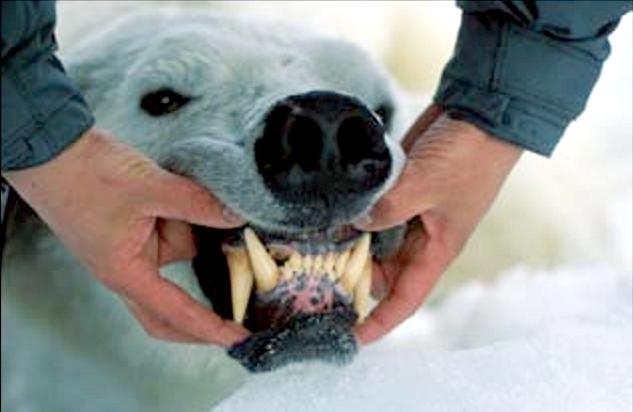 This helps it to adapt for the inconsistency of food supplies. 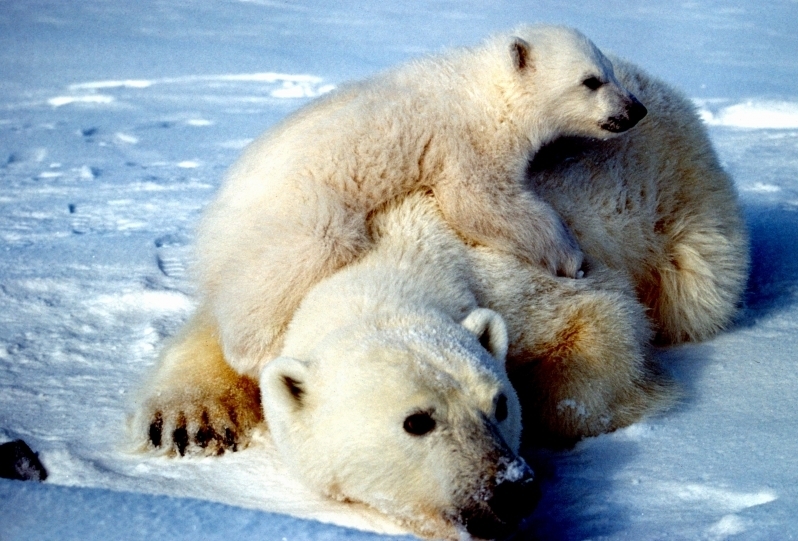 Females reproduce between the ages of 4 to 8 and have slow reproductive rates, typically only producing about 5 litters in their lifetime. 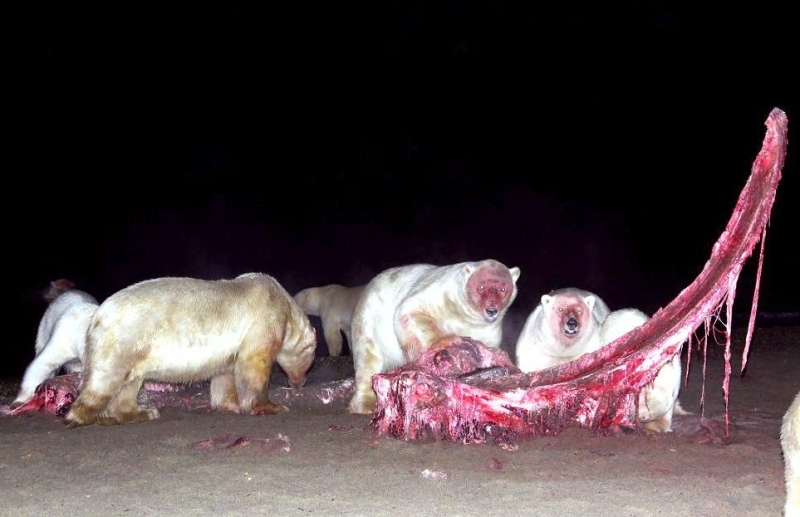 The total gestation period is 8 months in length and the female will usually produce between 1 to 3 cubs in a den, sometime between November & January. 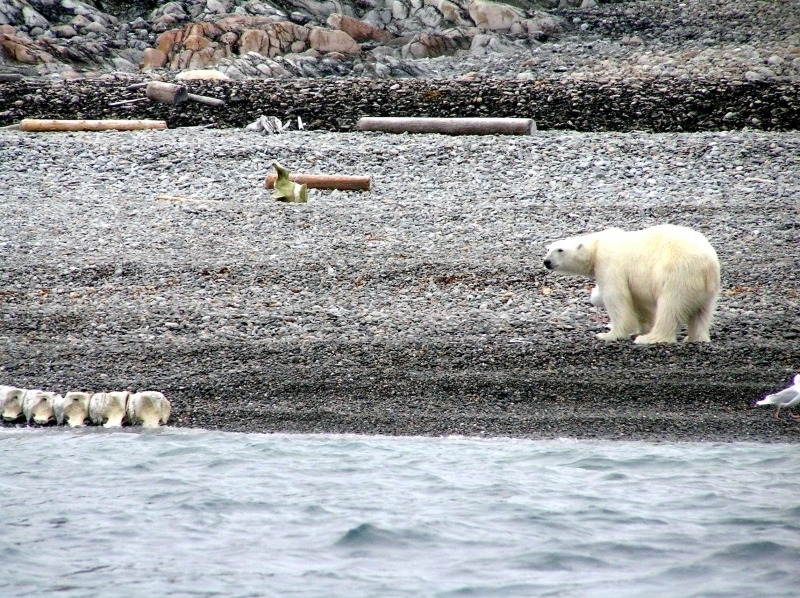 The female and her cubs will emerge from their den in late March or April. 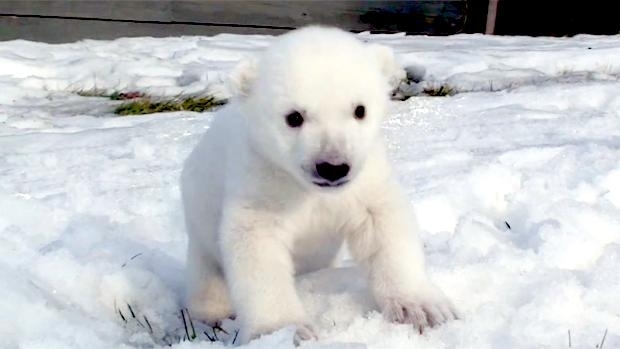 Cubs are very small when born, measuring about 12 to 14 inches in length and weight about 1 pound. 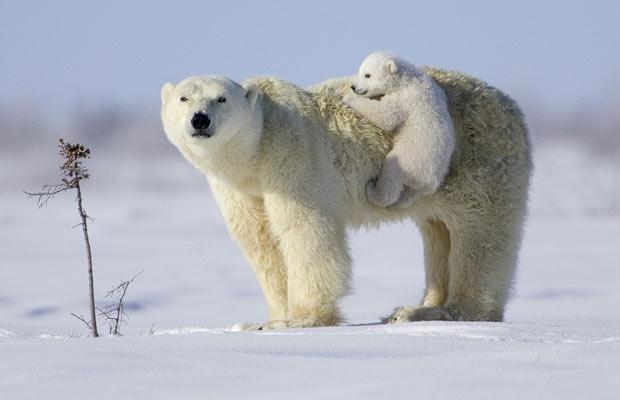 Cubs grow rapidly and stay with their mother until they are about 2.5 years old. 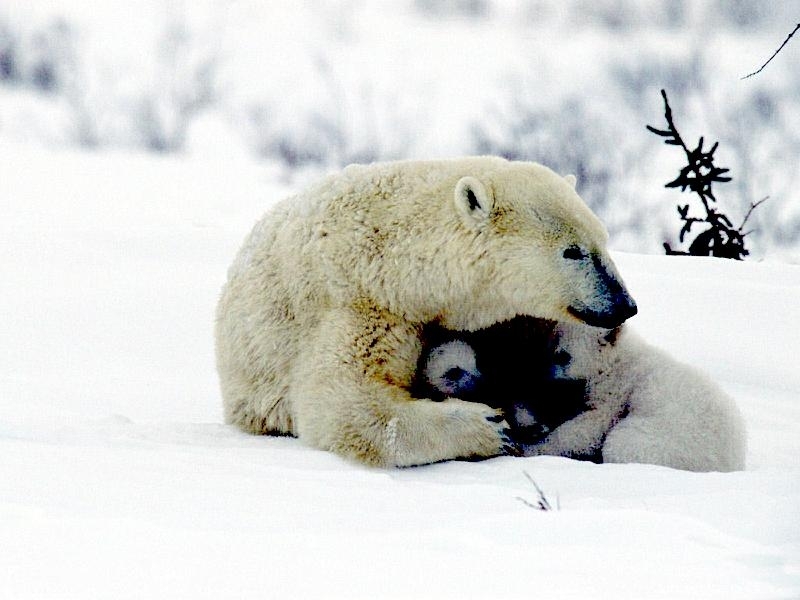 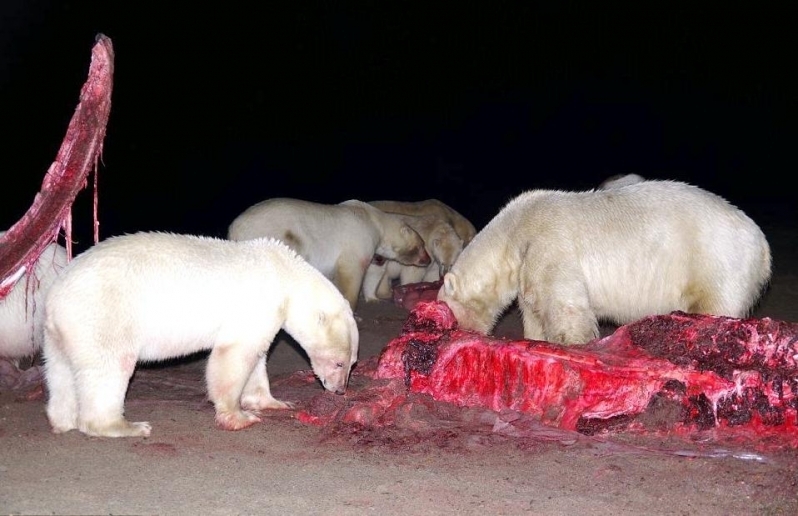 Only female Polar Bears giving birth have dens, as they do not hibernate like other bear species instead their metabolism simply slows. 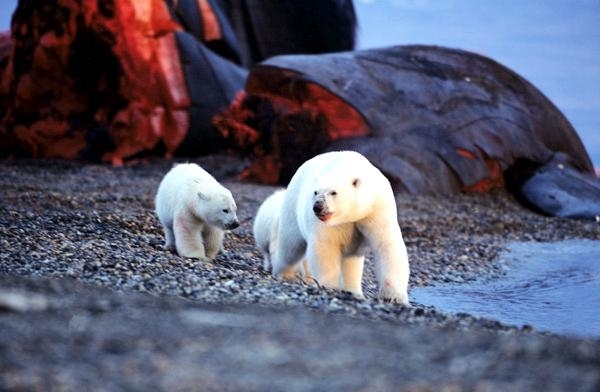 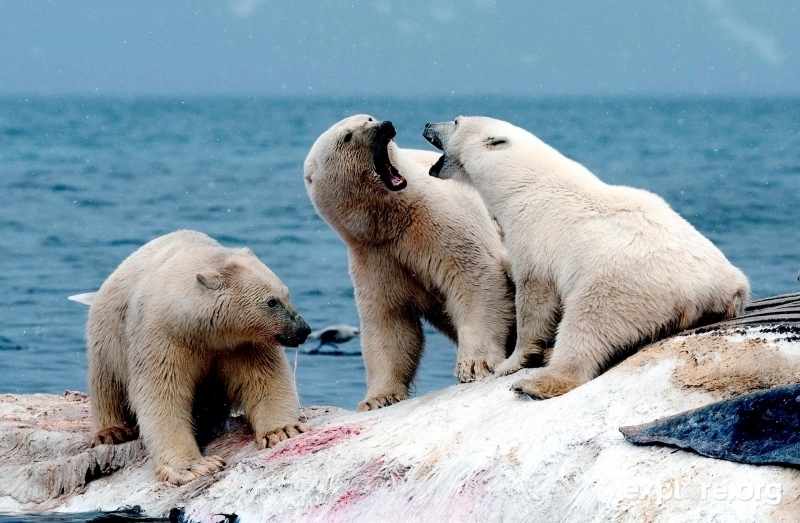 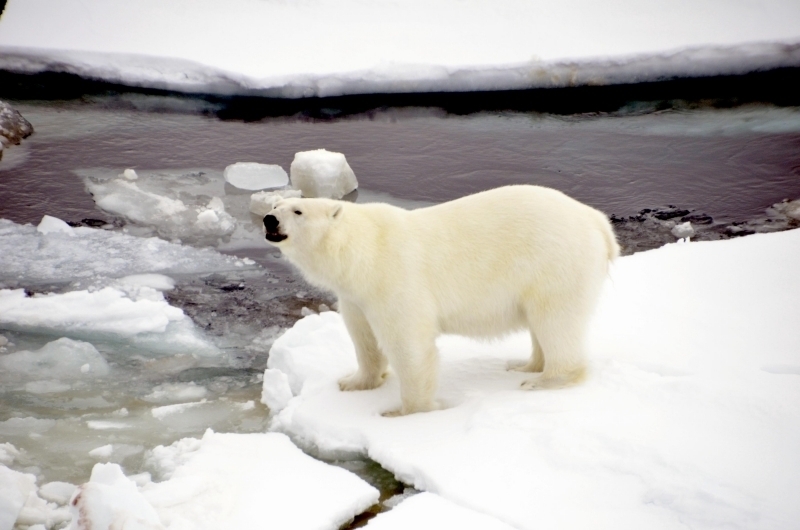 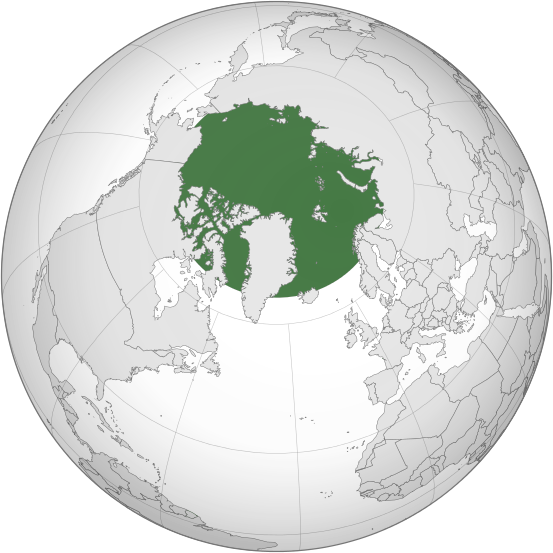 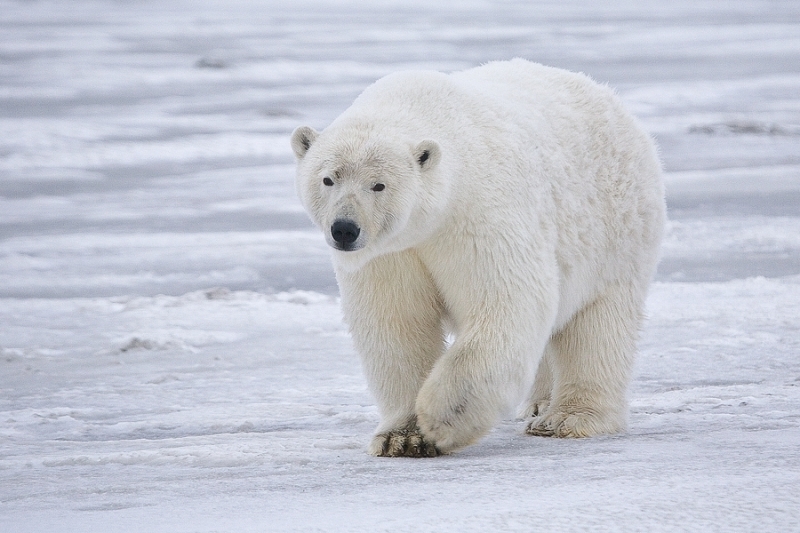 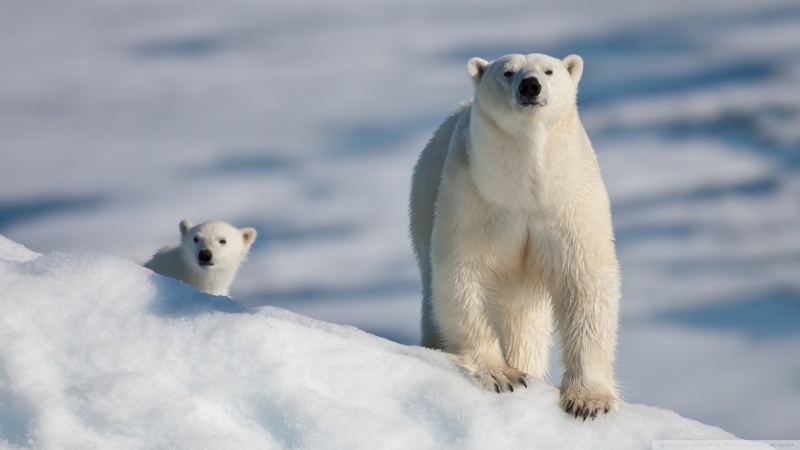 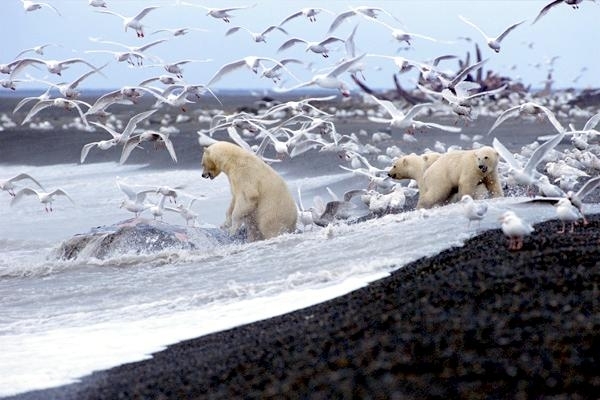 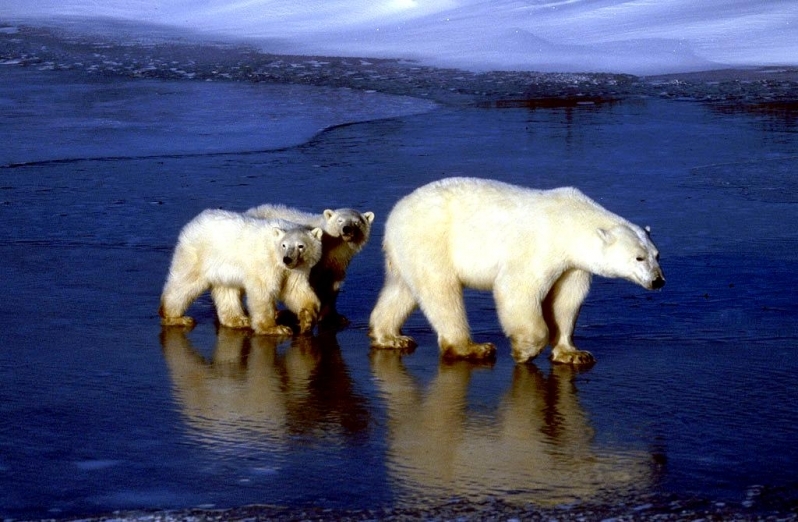 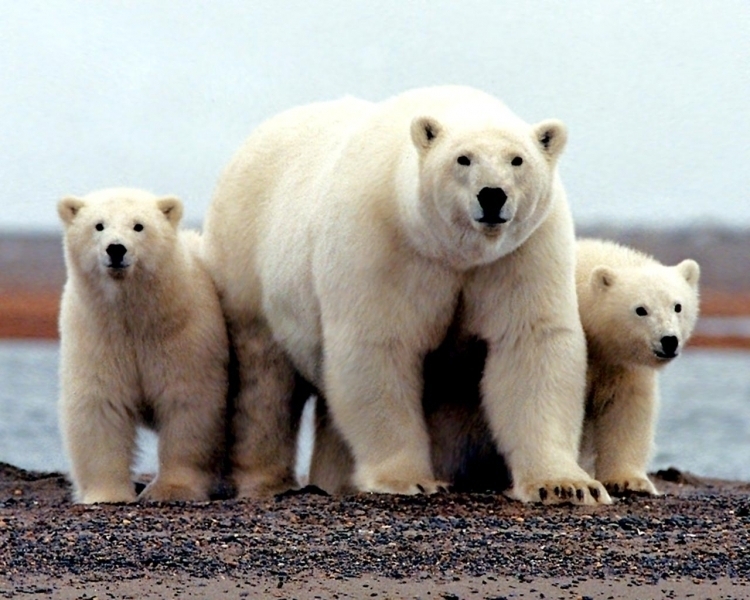 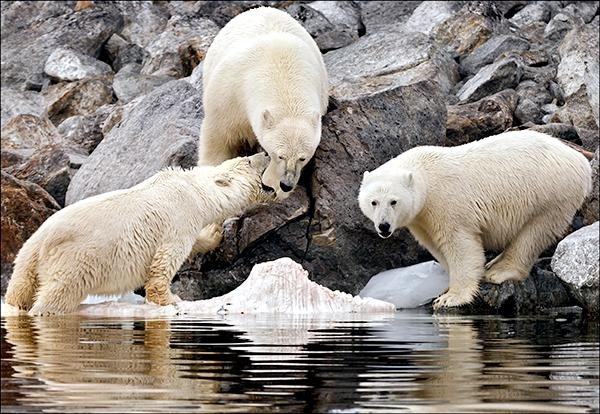 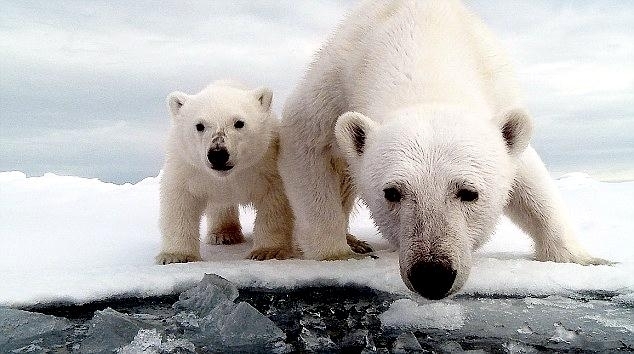 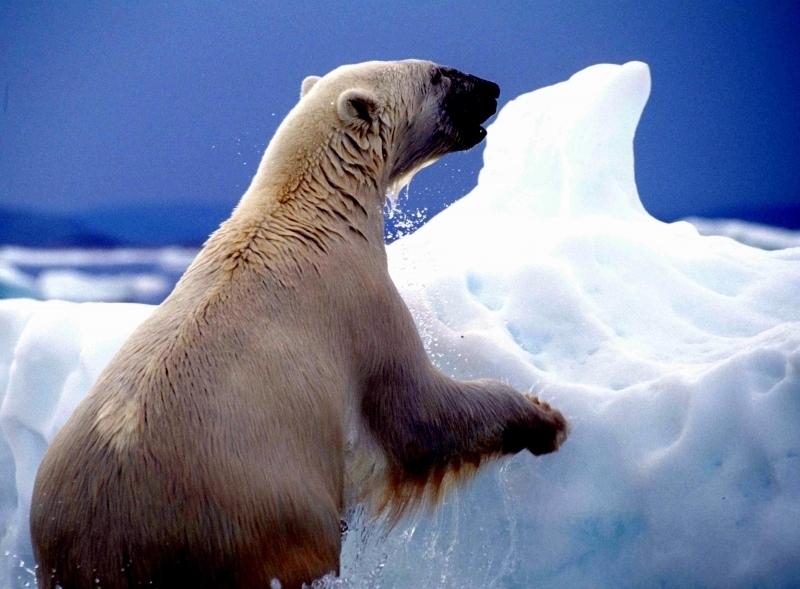 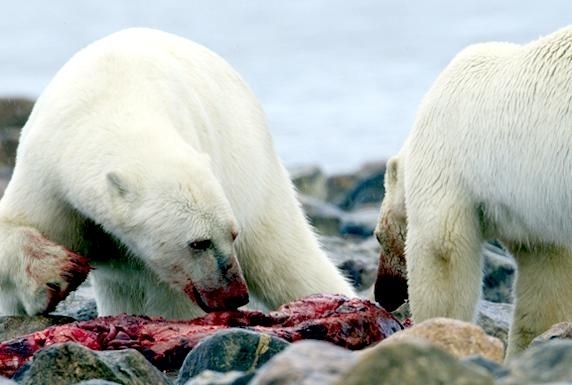 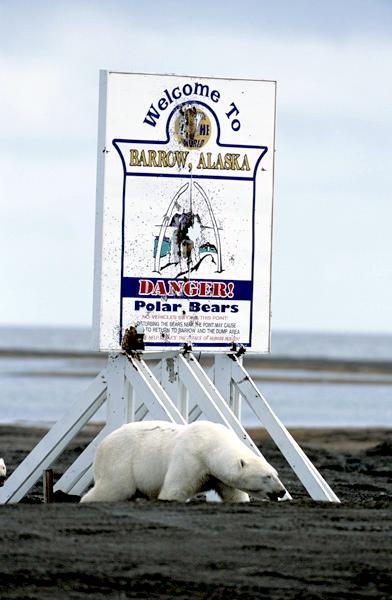 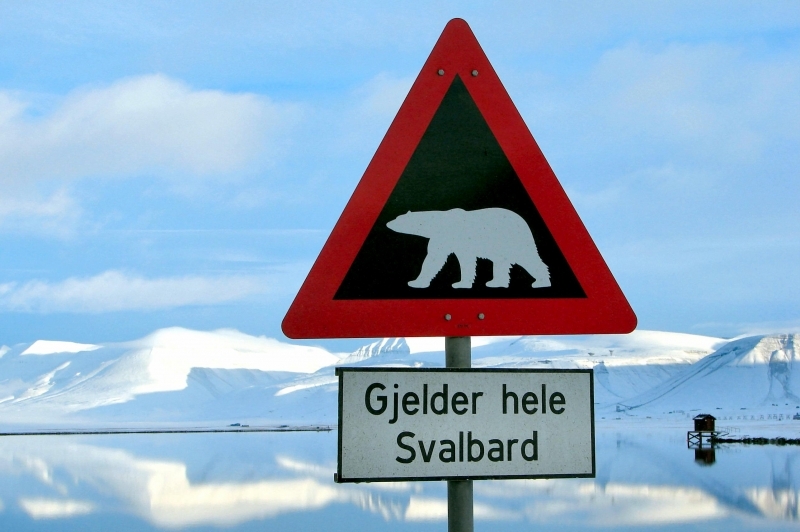 Polar Bears are found in Russia, Alaska, Canada, Greenland & Norway’s Svalbard archipelago. 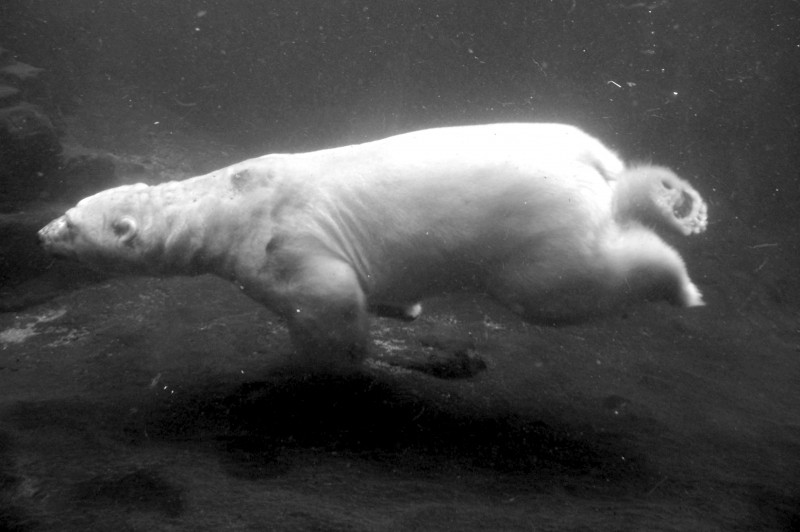 They live on sea ice where it meets open water, for access to their seal prey. 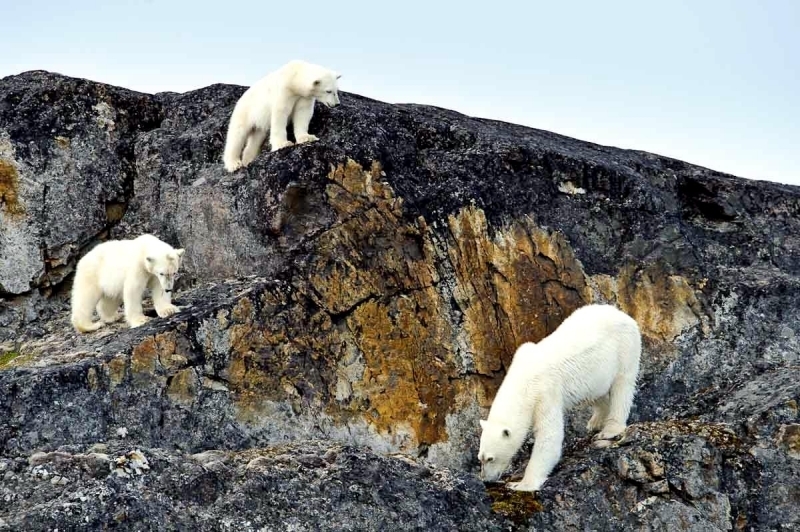 During part of the year, they live on solid land. 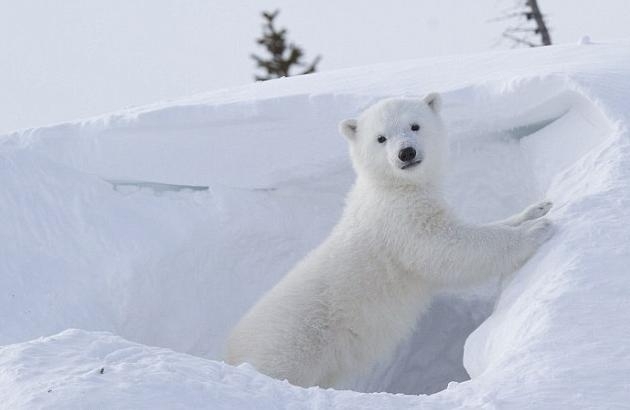 Biologists estimate there are 20,000 to 25,000 Polar Bears left in the wild, according to the conservation group Polar Bears International. 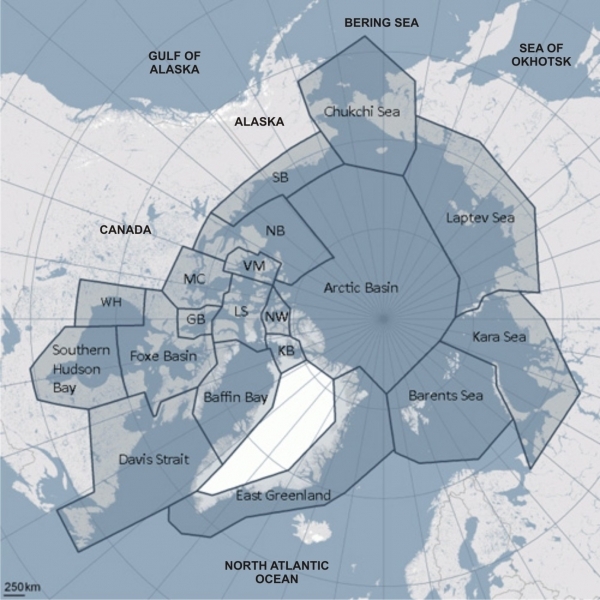 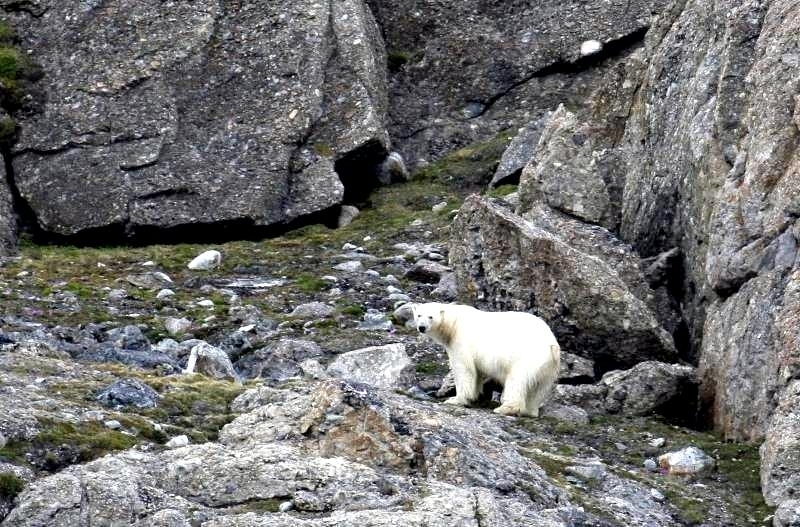 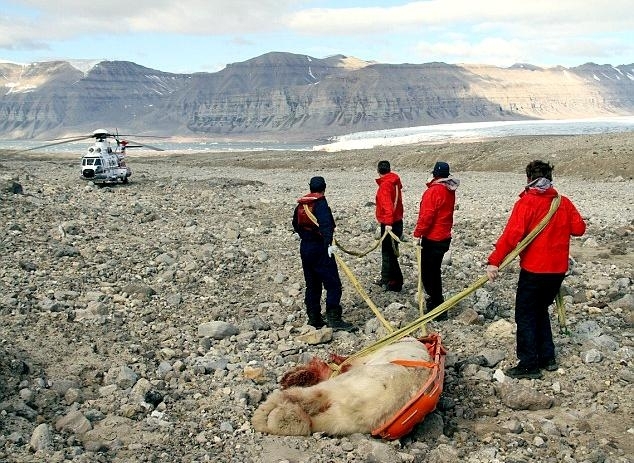 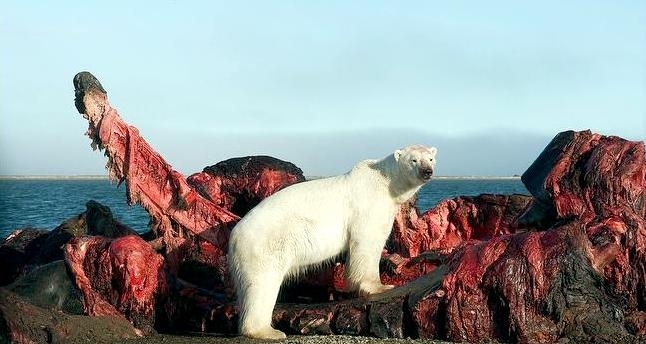 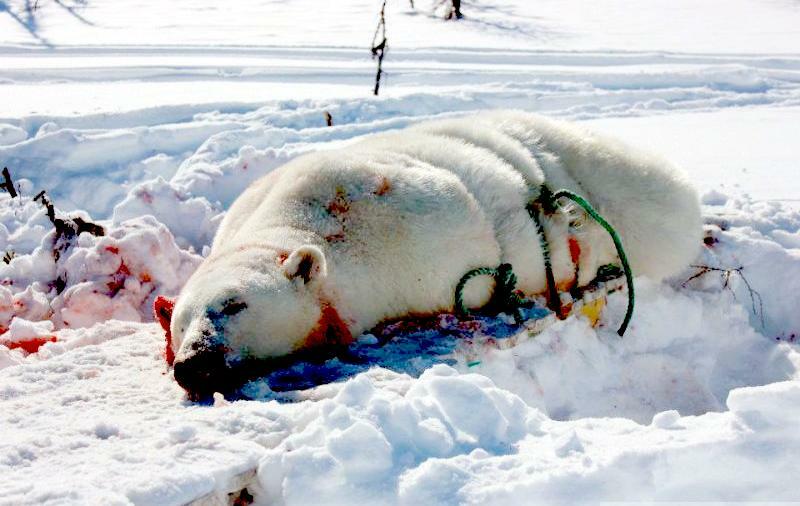 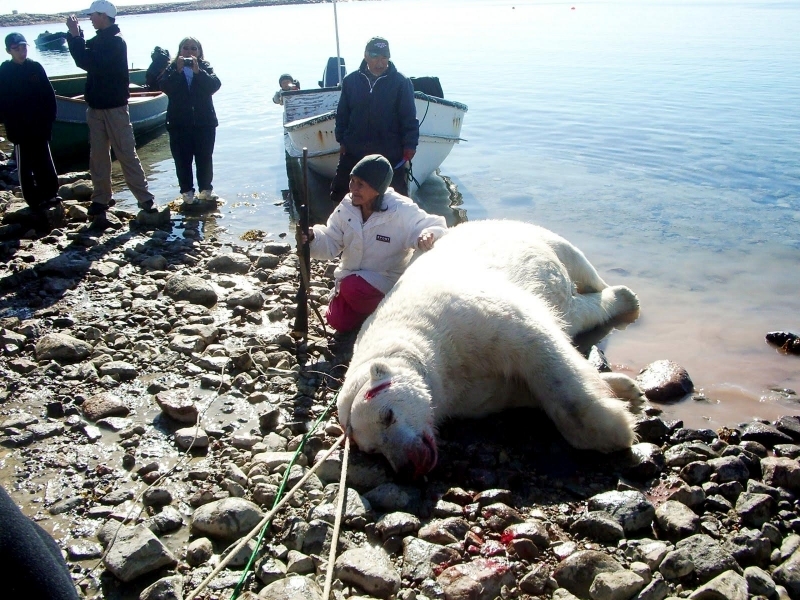 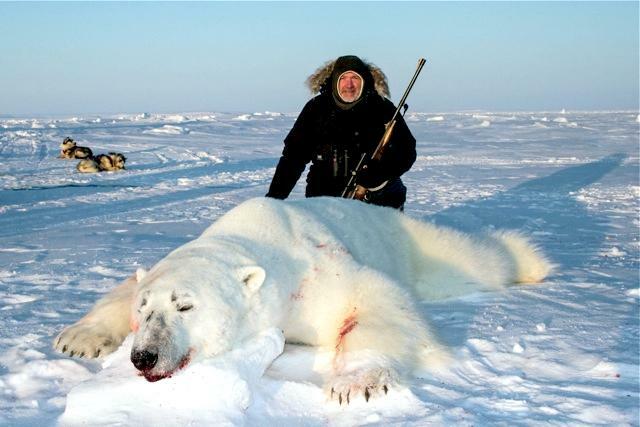 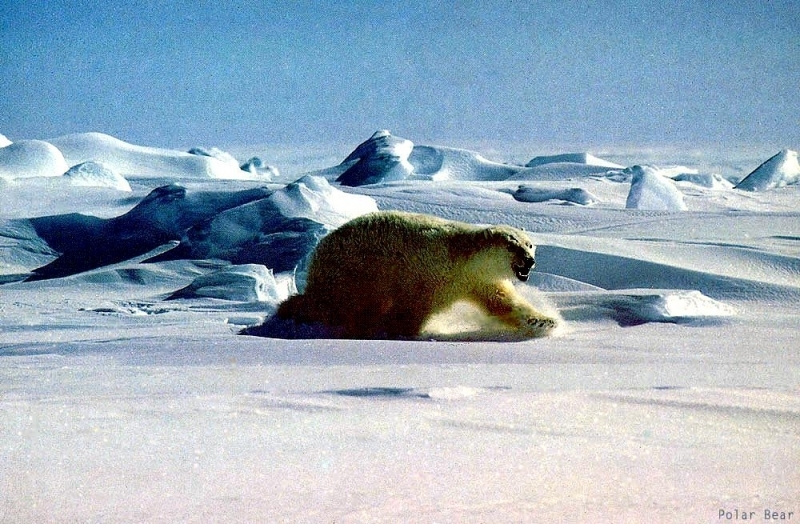 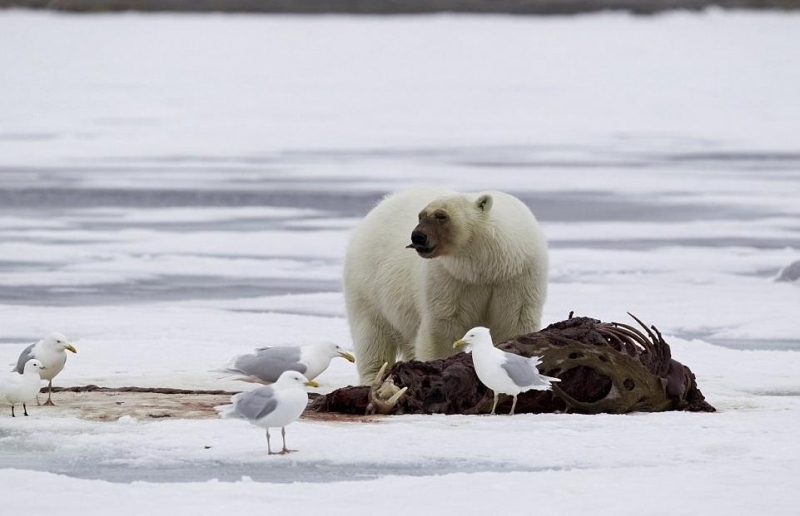 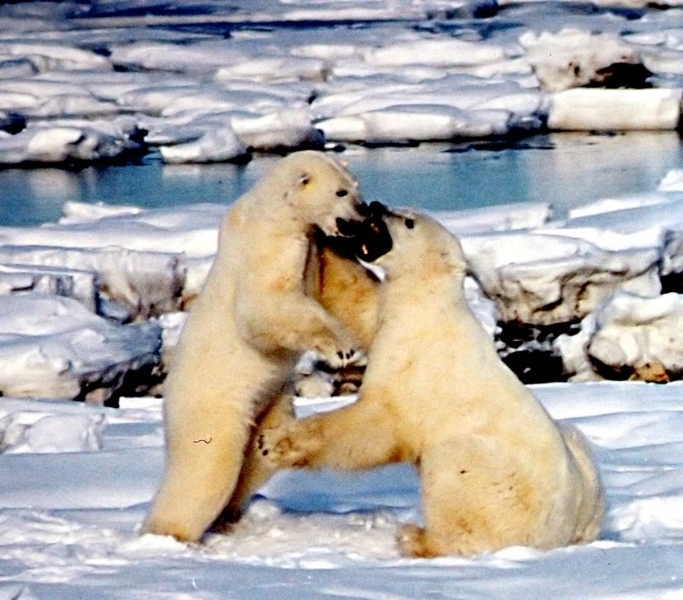 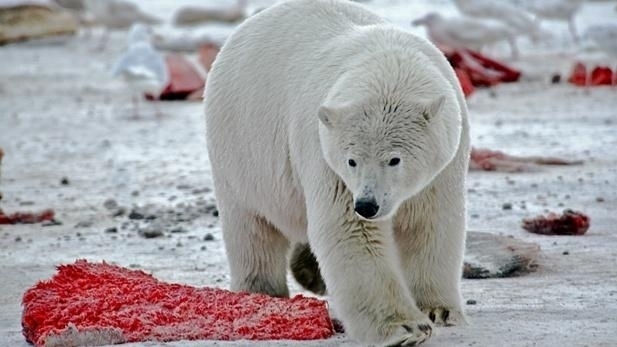 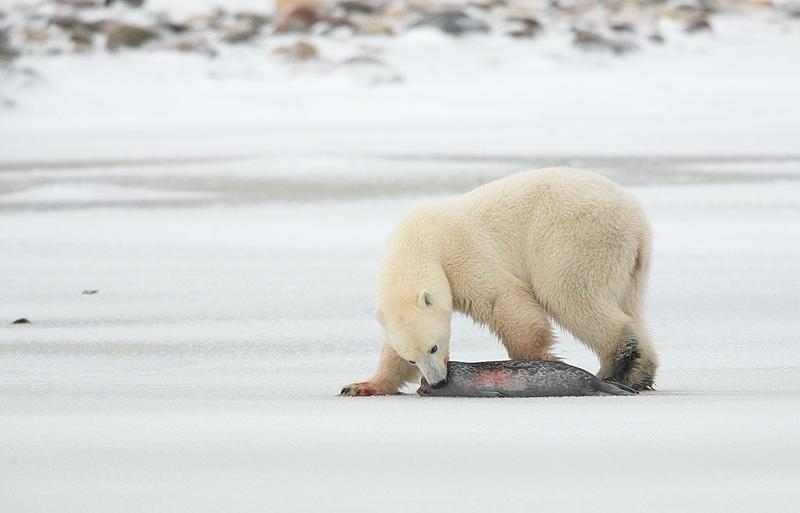 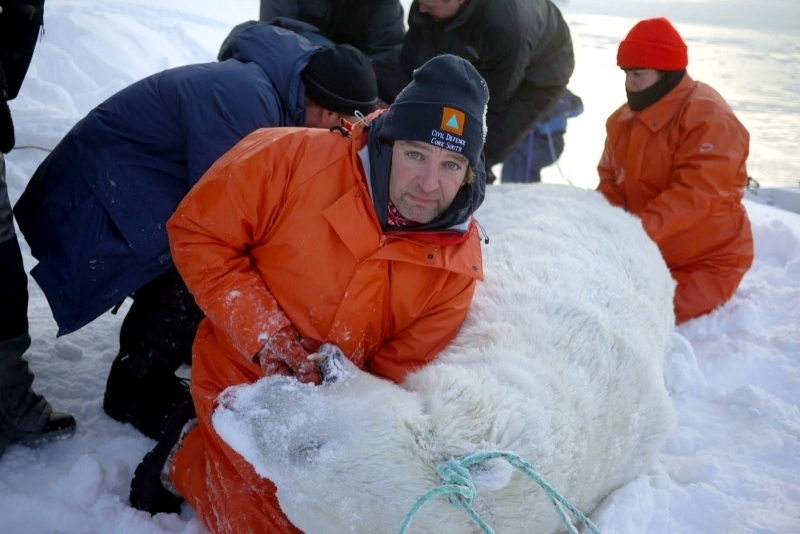 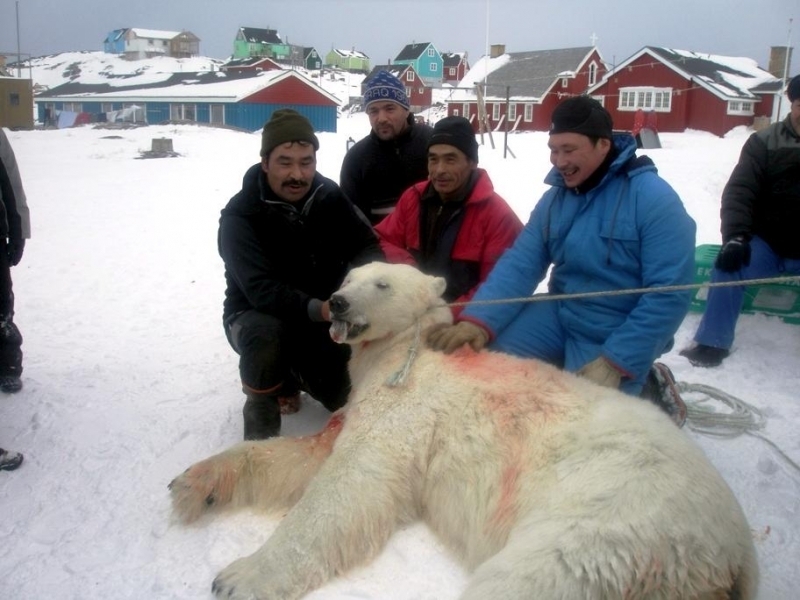 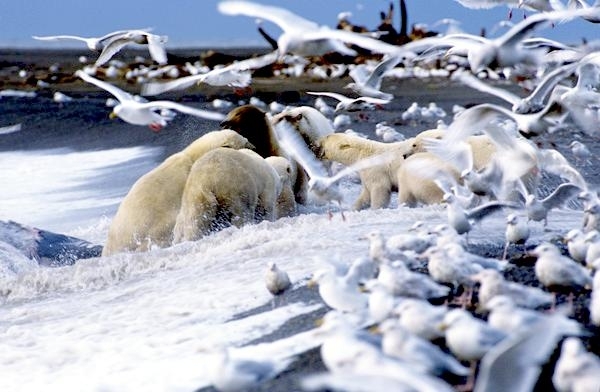 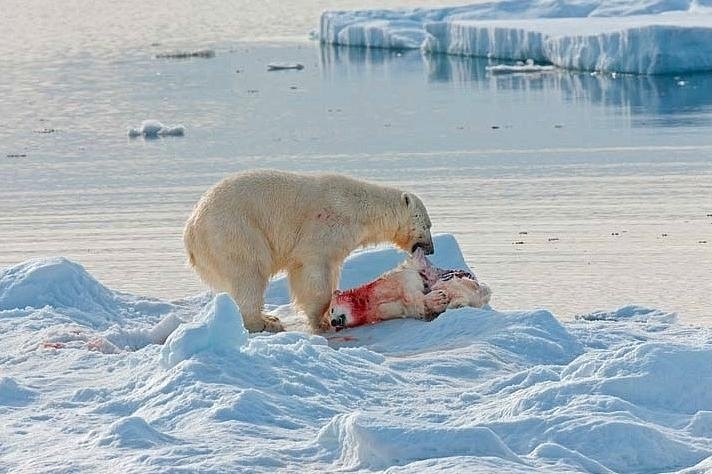 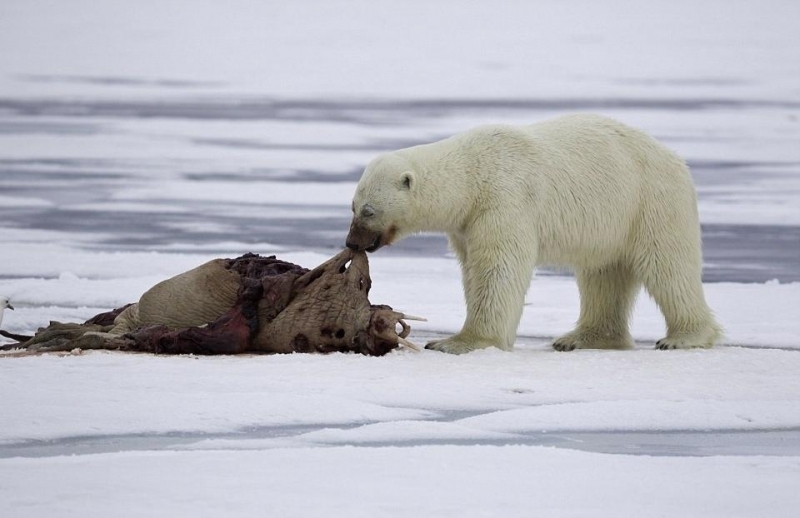 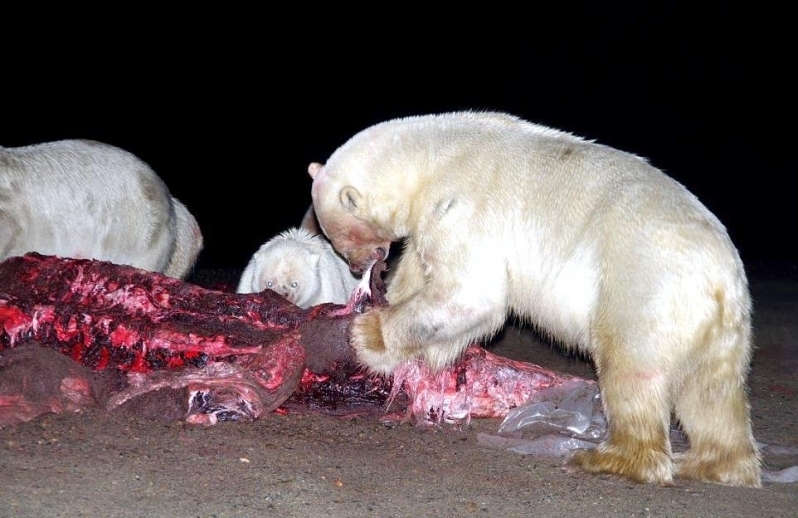 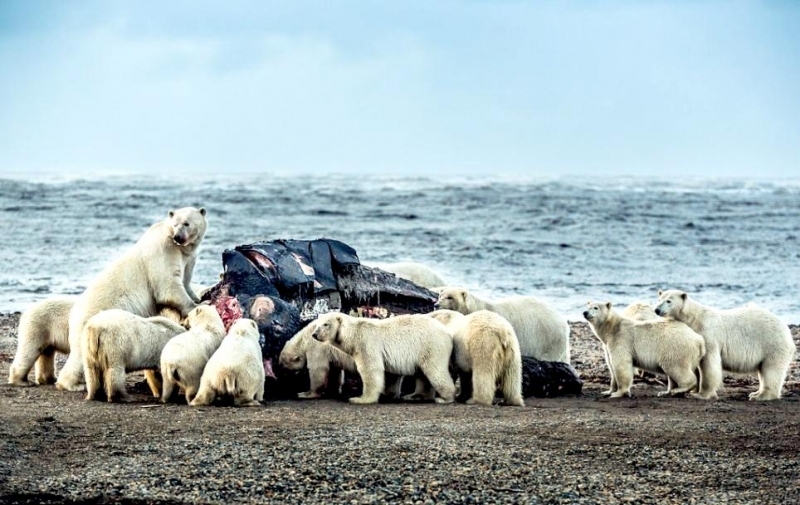 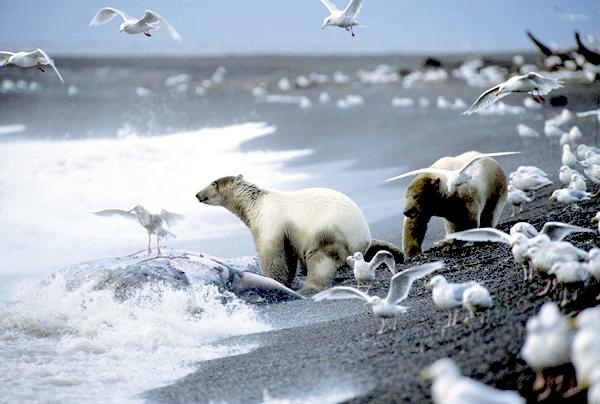 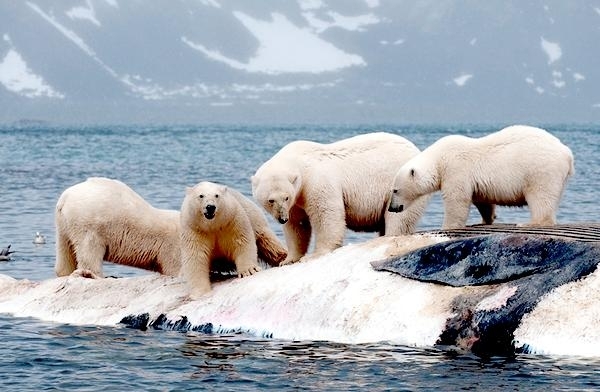 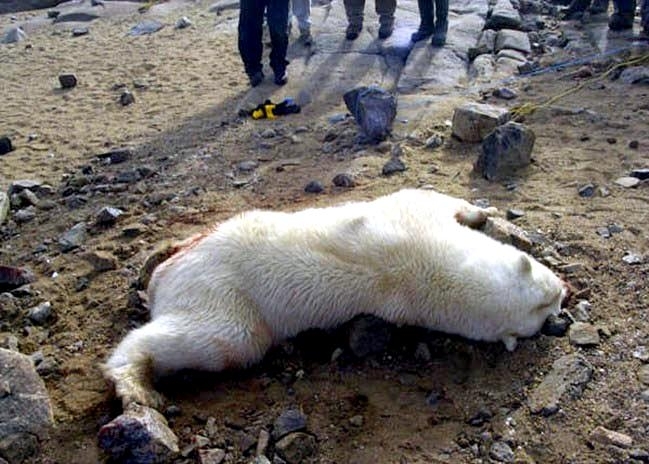 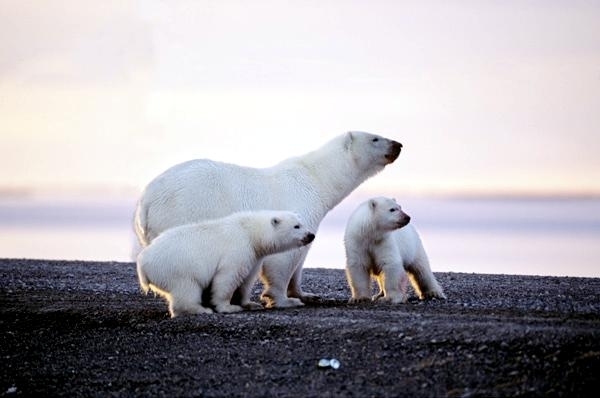 At a 2009 meeting of the Polar Bear Specialist Group part of the IUCN, experts concluded that of the 19 sub-populations of Polar Bears, 8 were declining, 3 were stable and 1 was increasing. 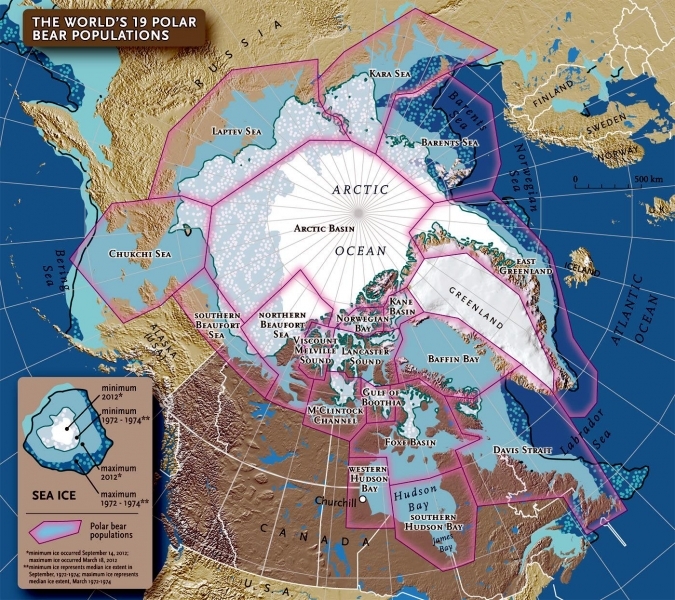 The data on the other 7 was insufficient to determine any population trends. 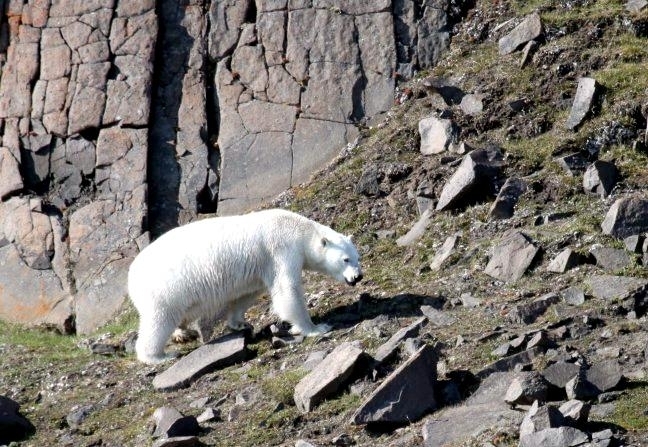 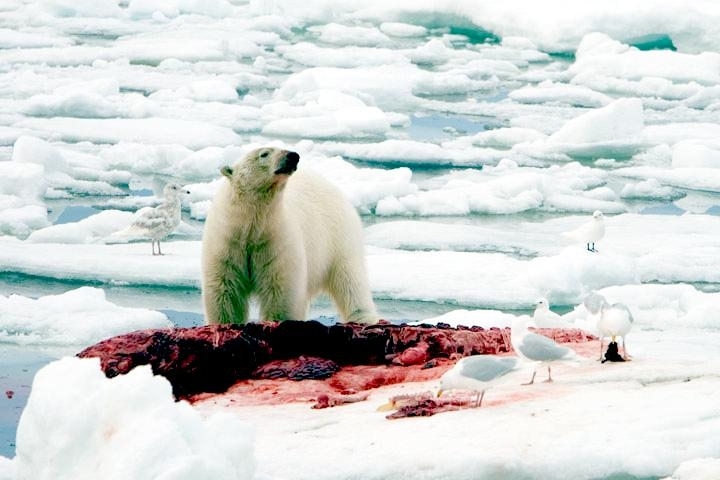 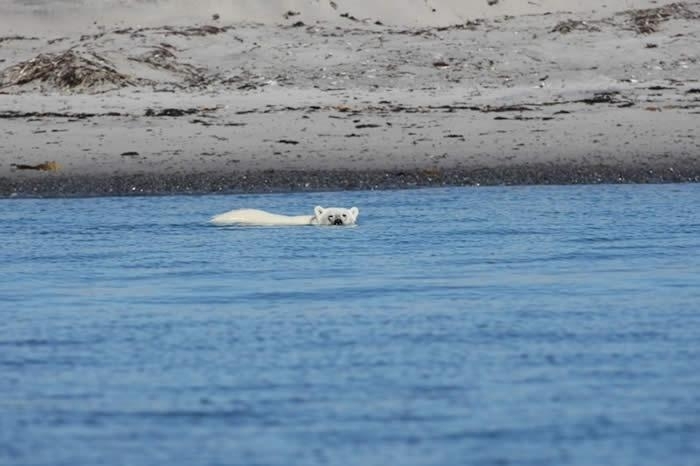 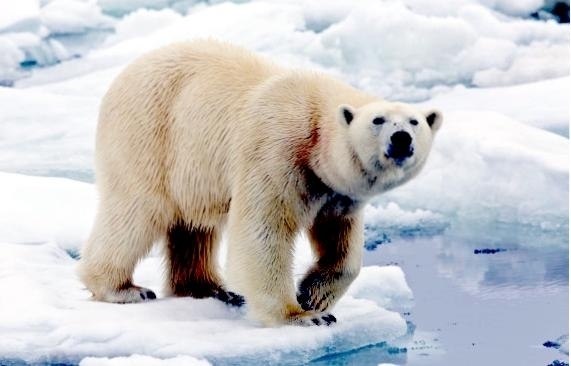 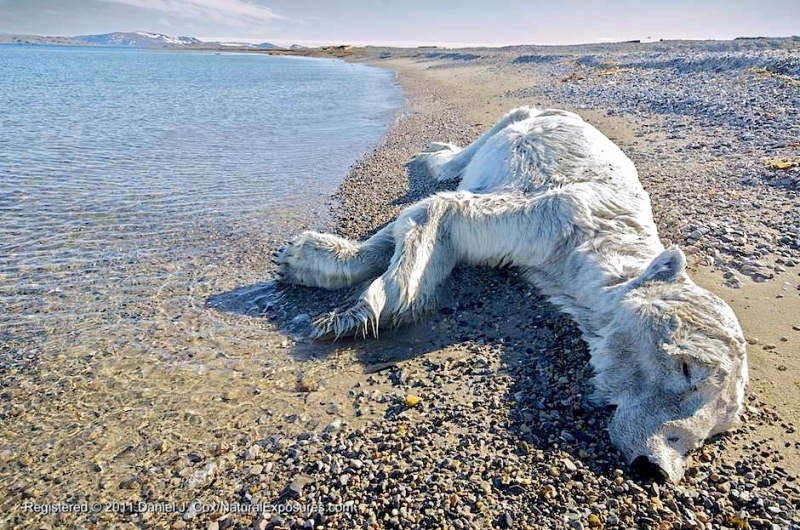 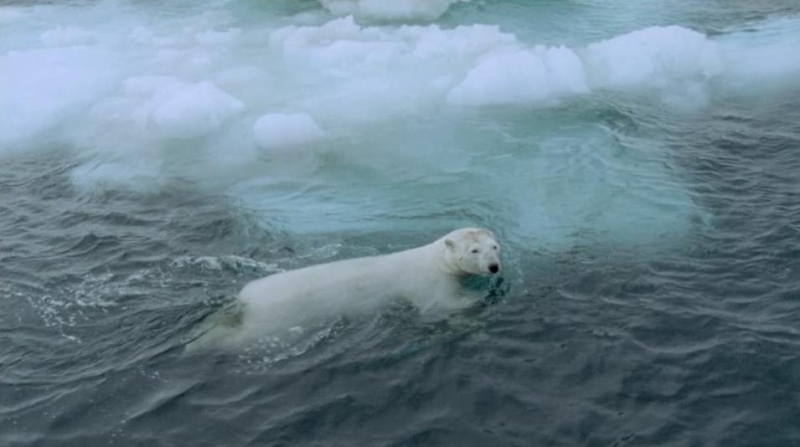 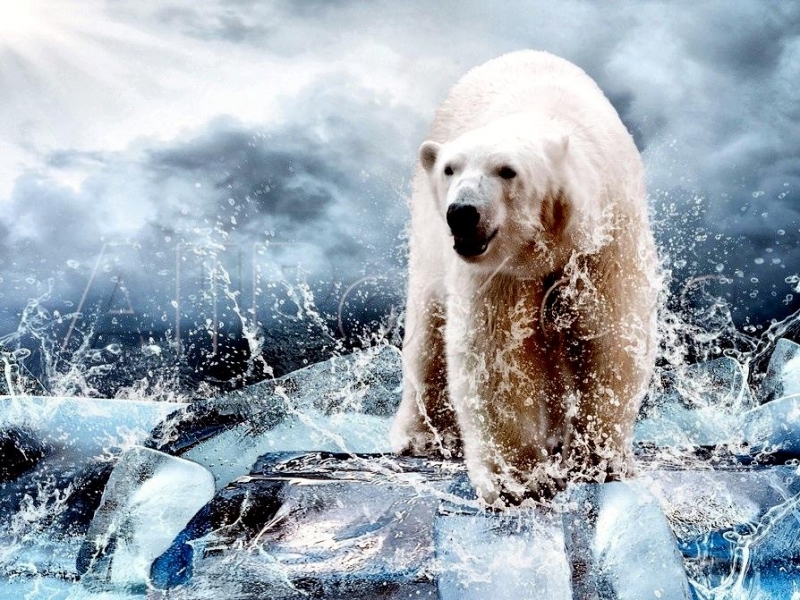 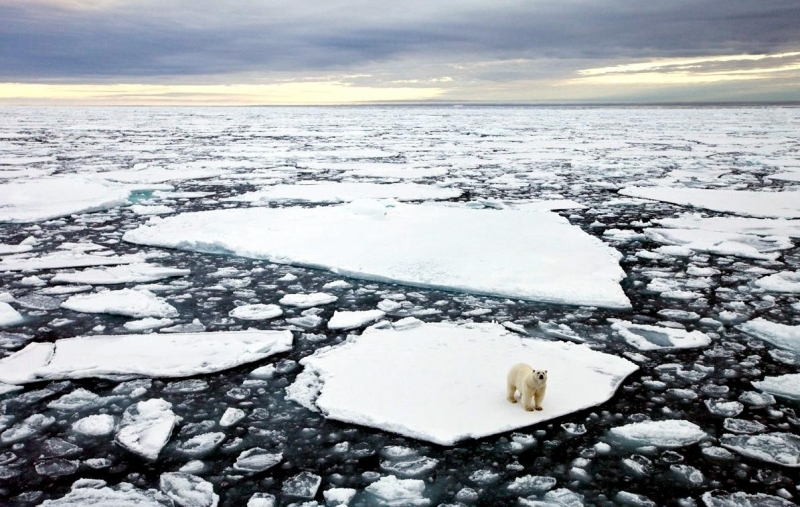 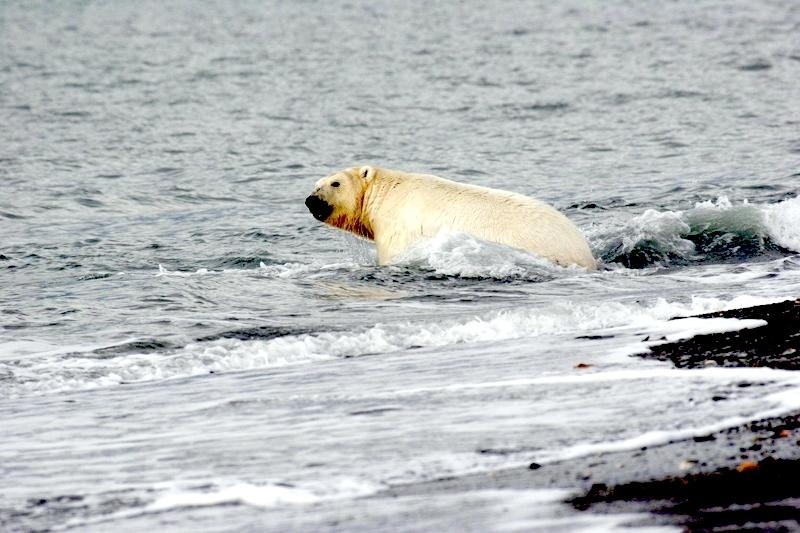 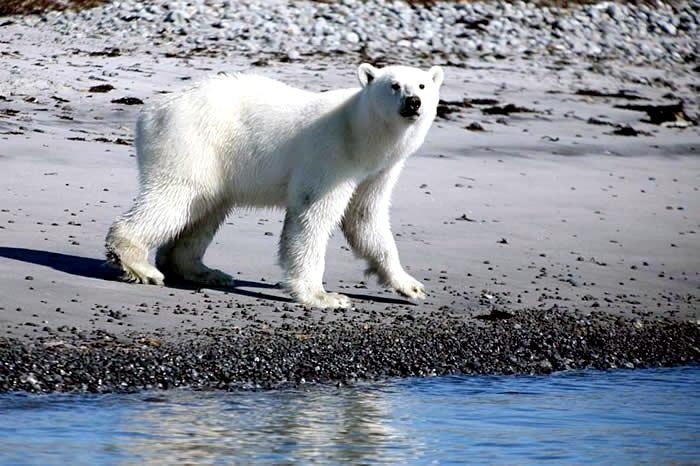 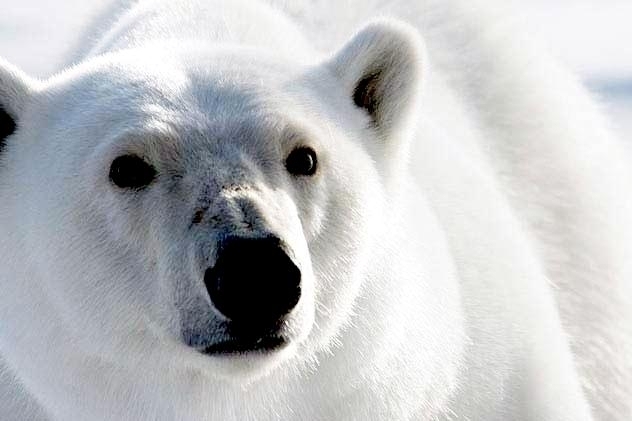 Studies have predicted that melting of sea ice in the Arctic due to global warming could cause two-thirds of the Polar Bear population to disappear by 2050. 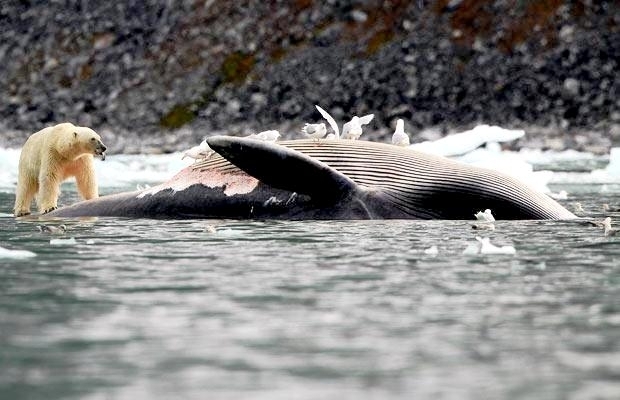 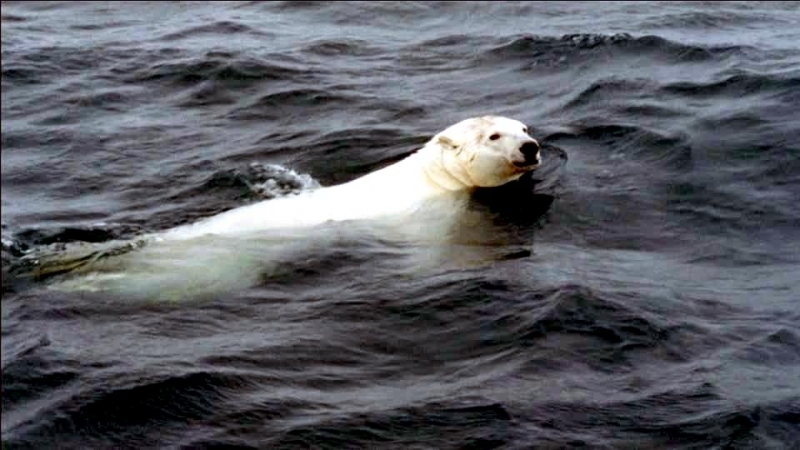 In May 2008, United States listed the specie as a threatened species under the Endangered Species Act, while in Canada & Russia they are listed as a species of special concern. 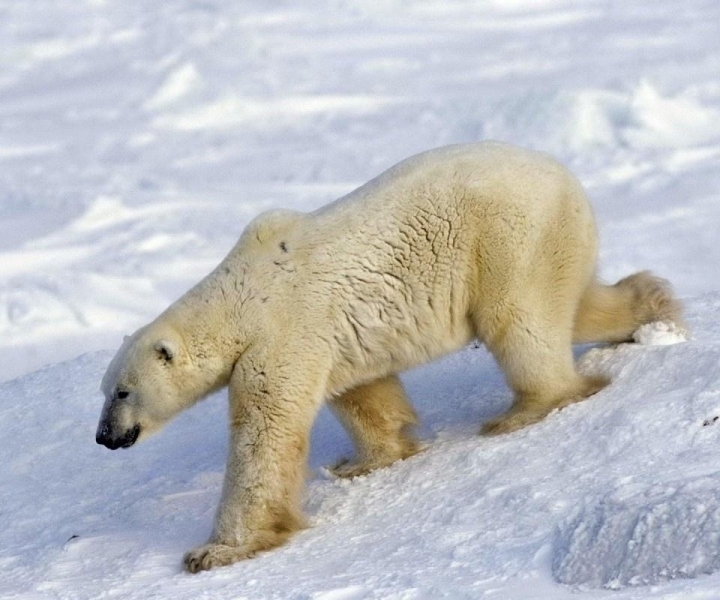 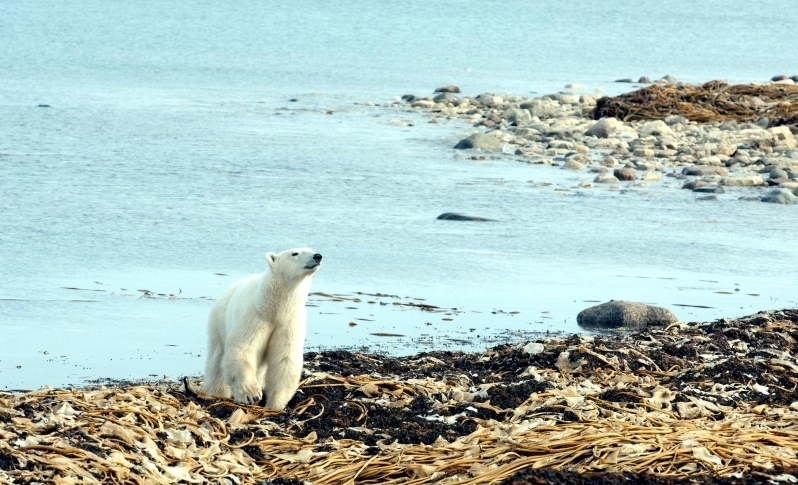 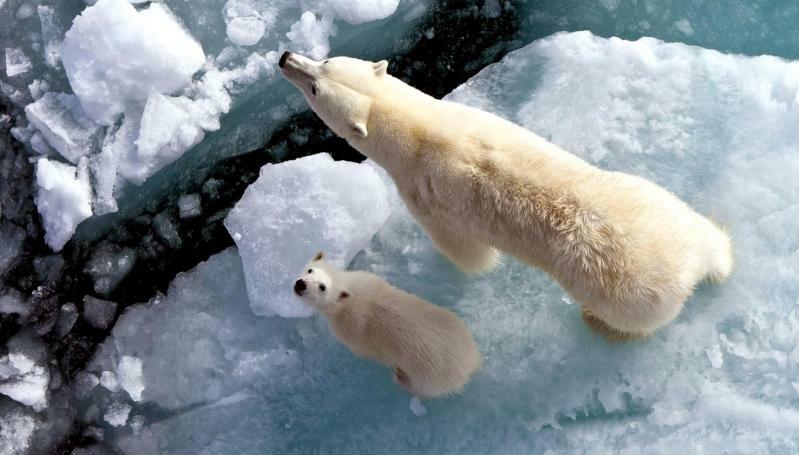 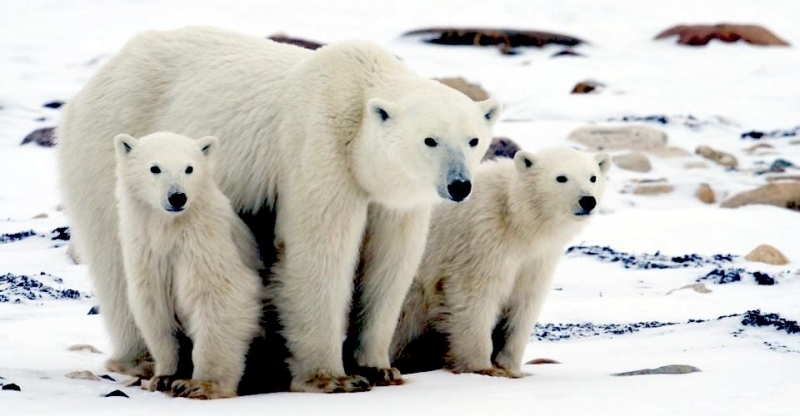 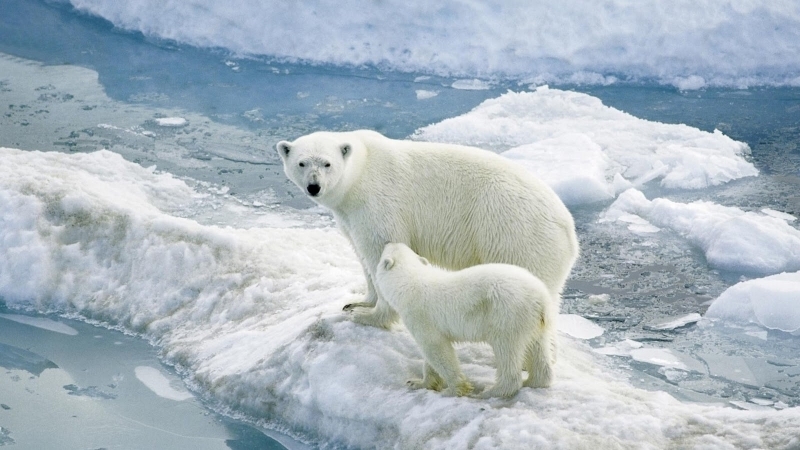 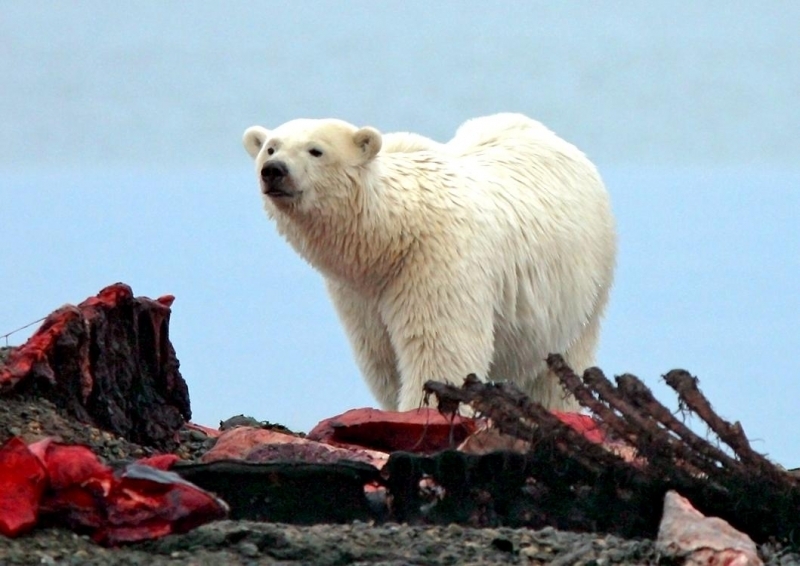 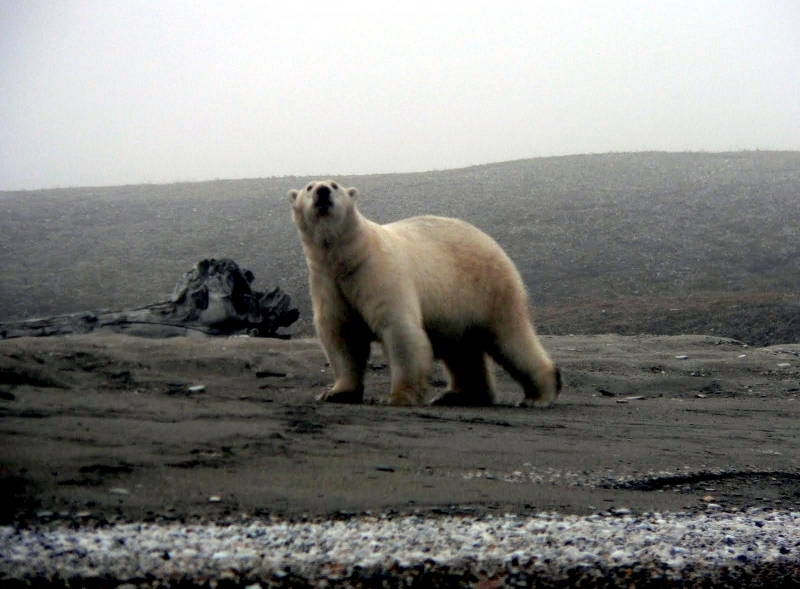 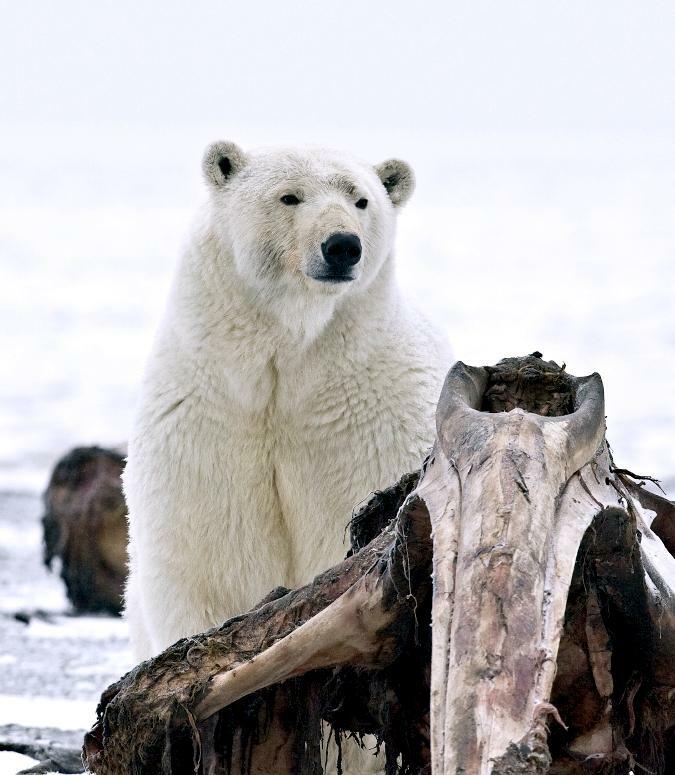 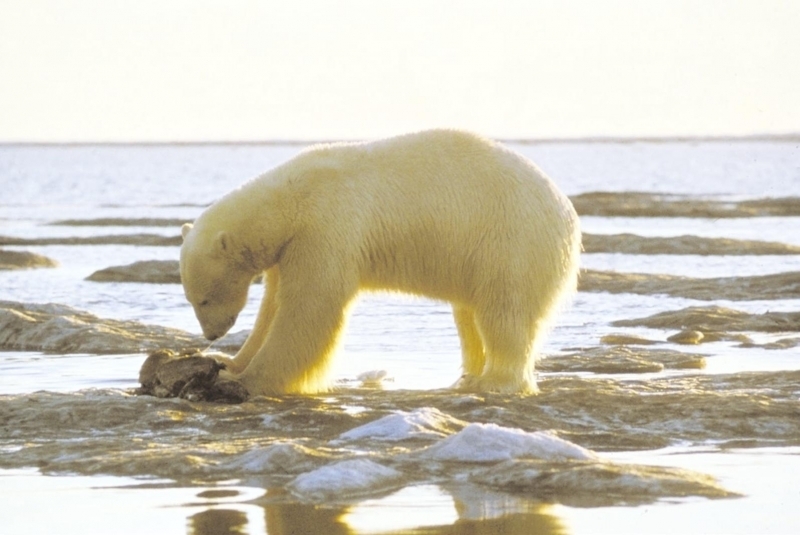 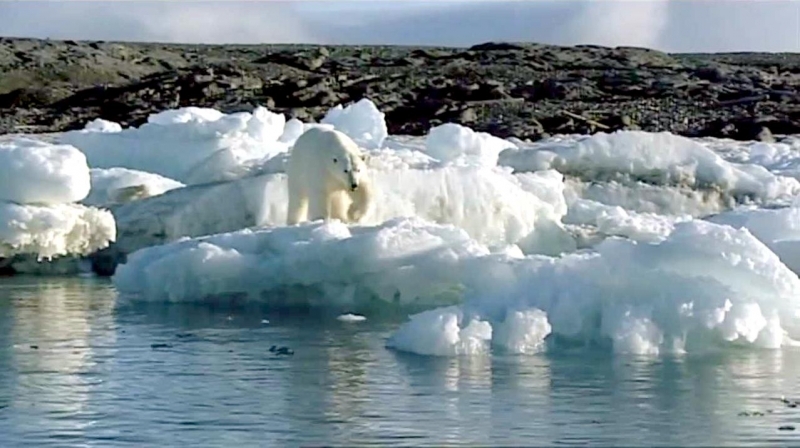 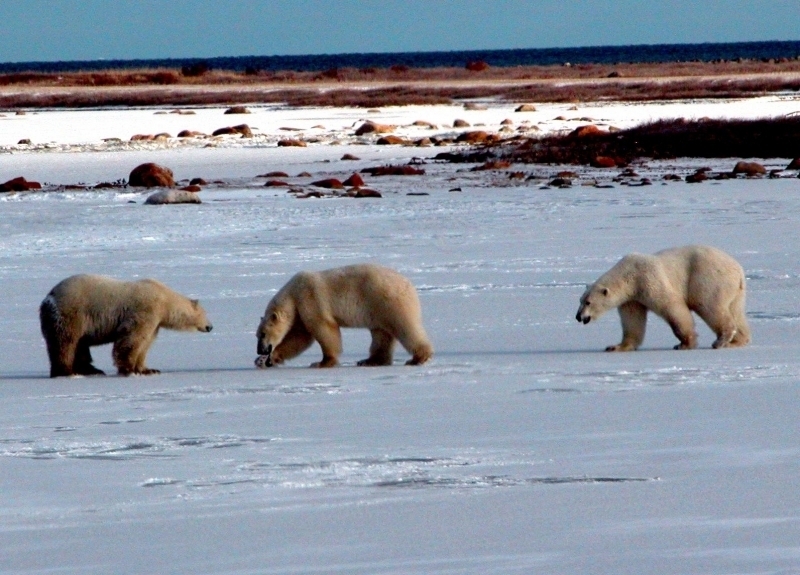 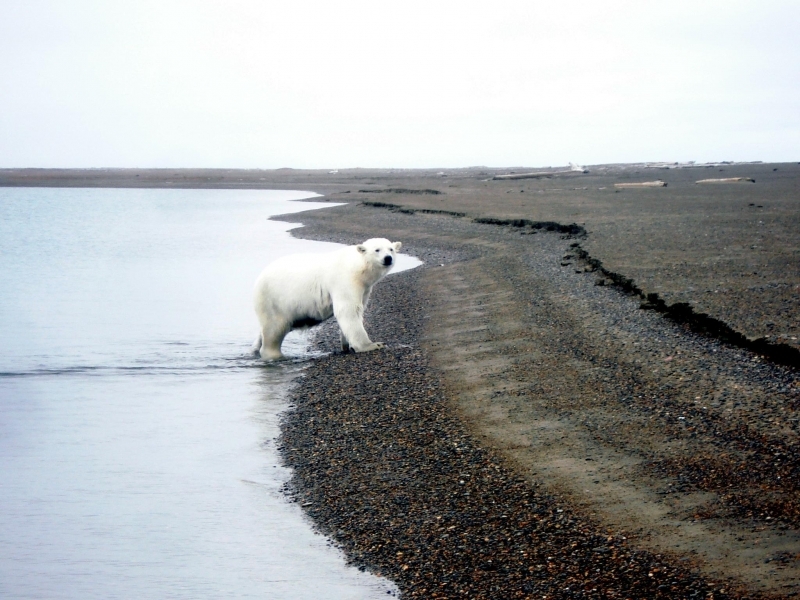 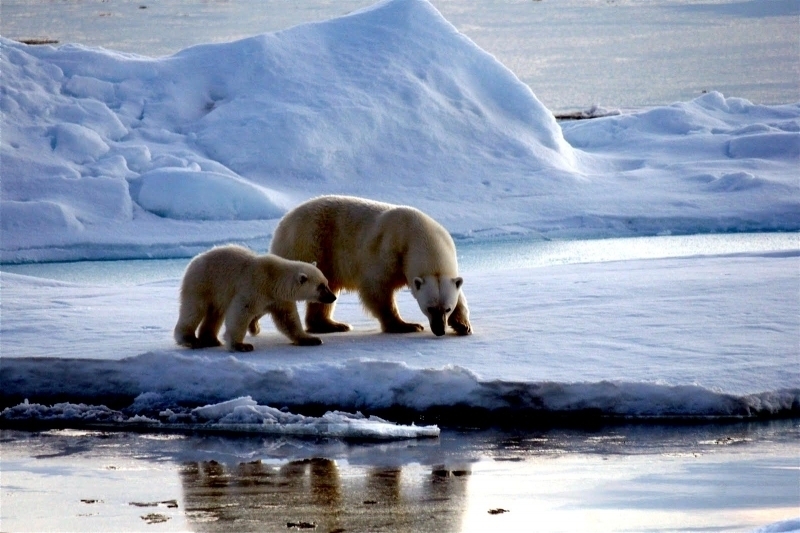 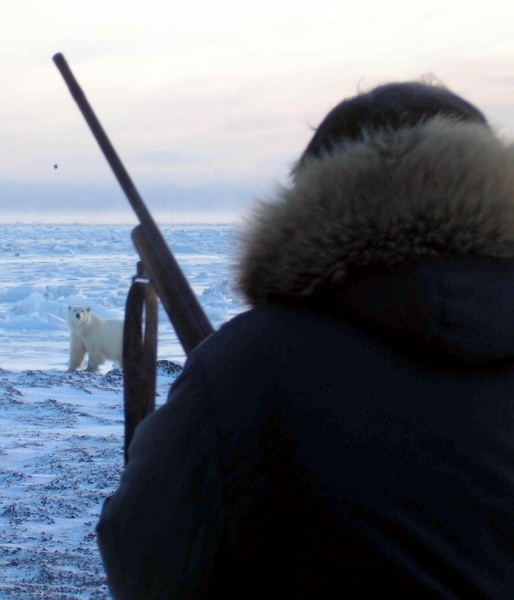 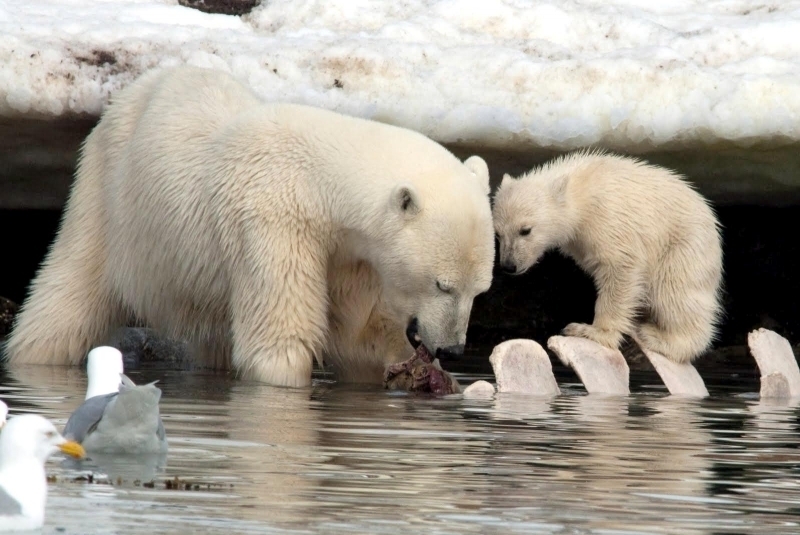 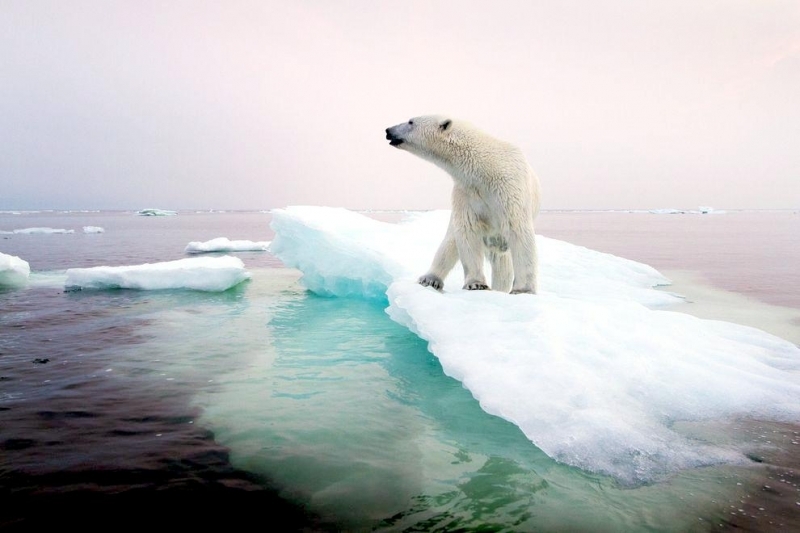 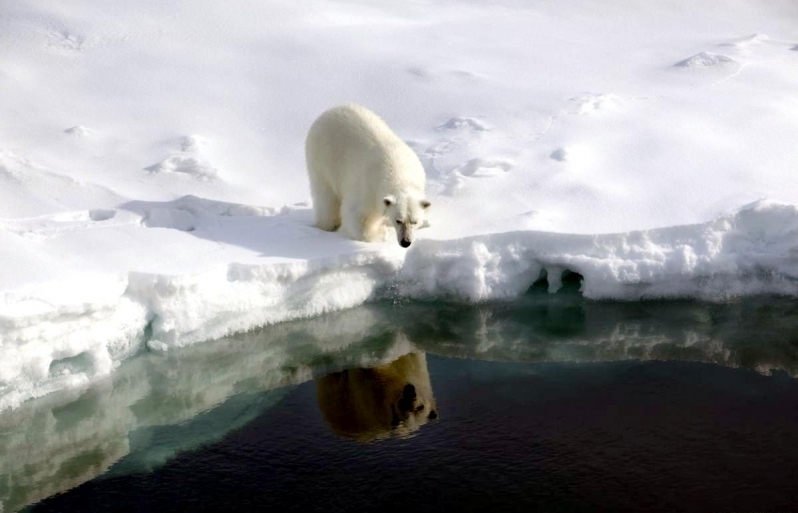 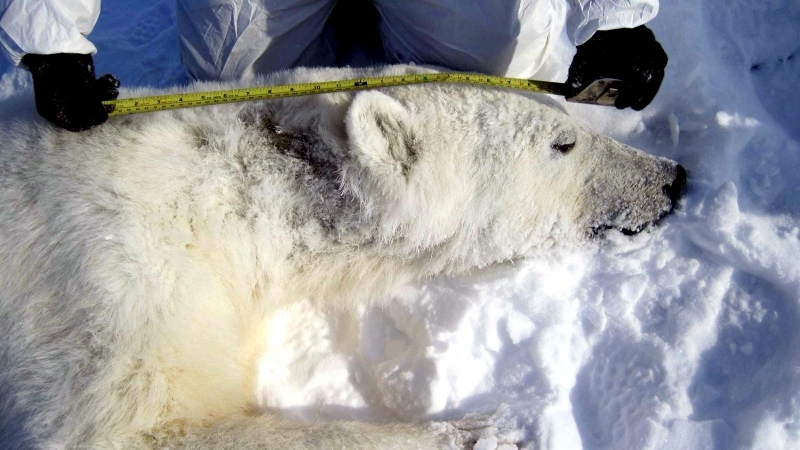 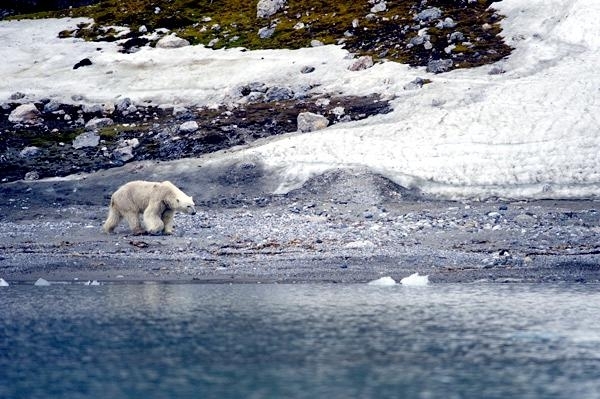 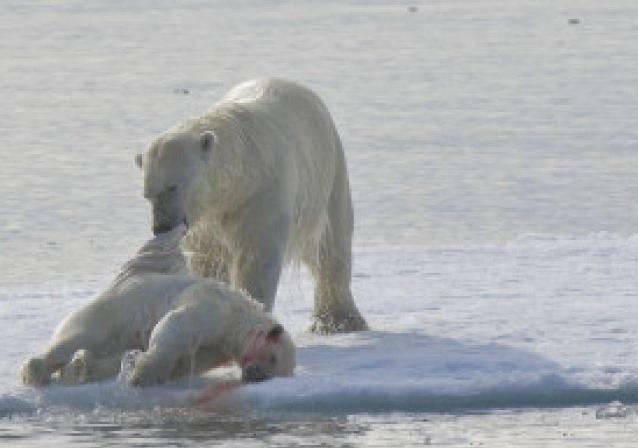 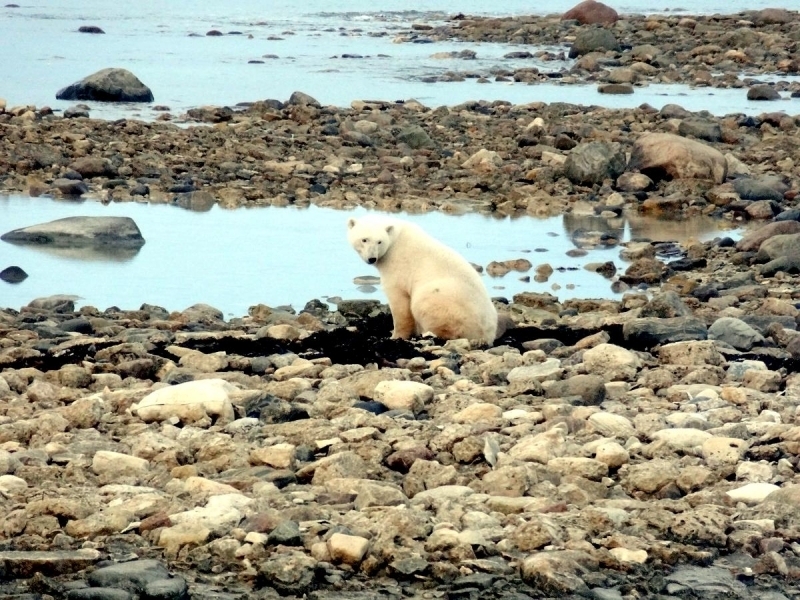 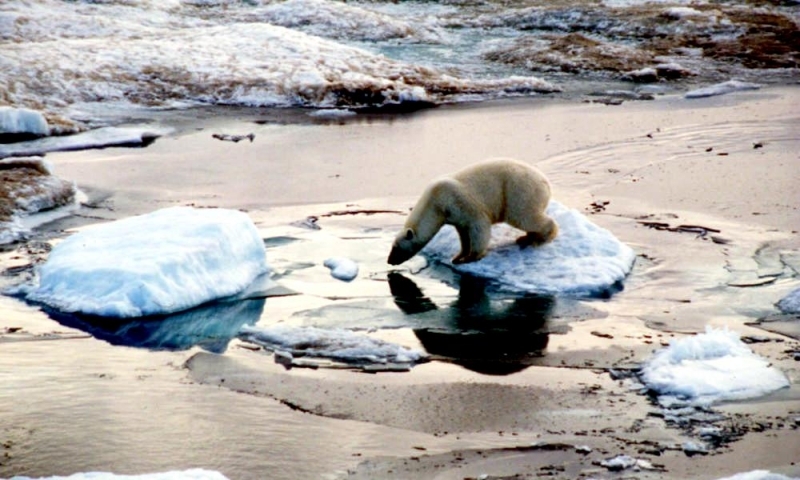 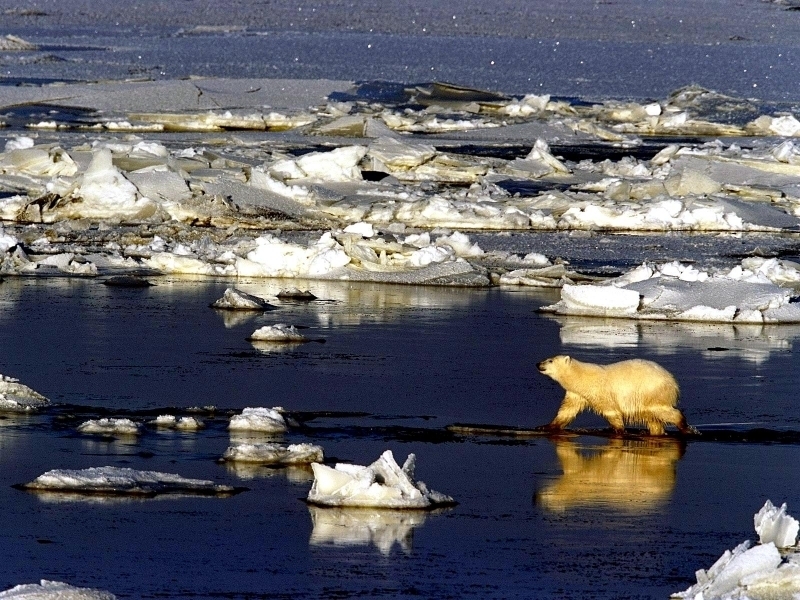 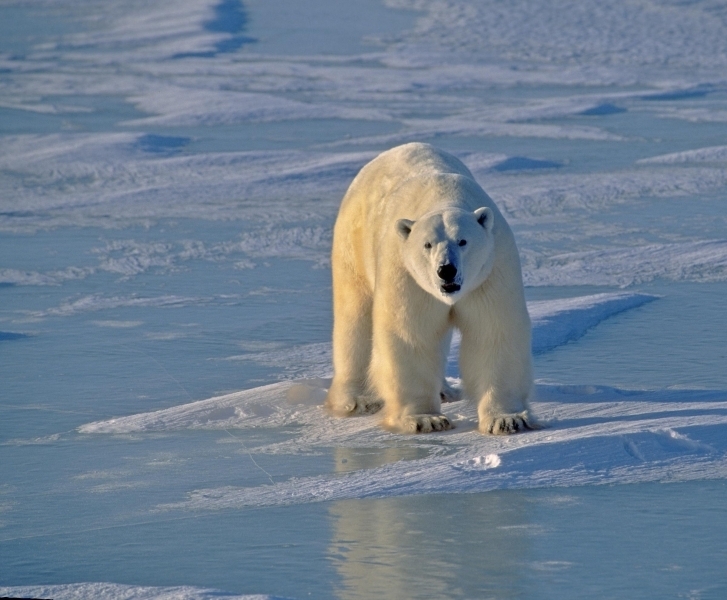 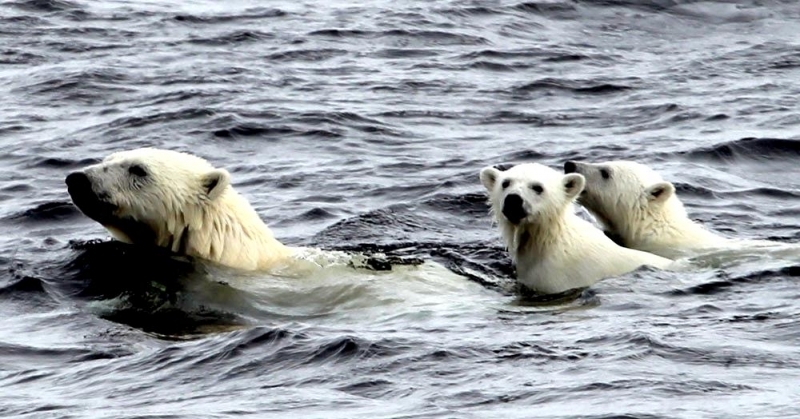 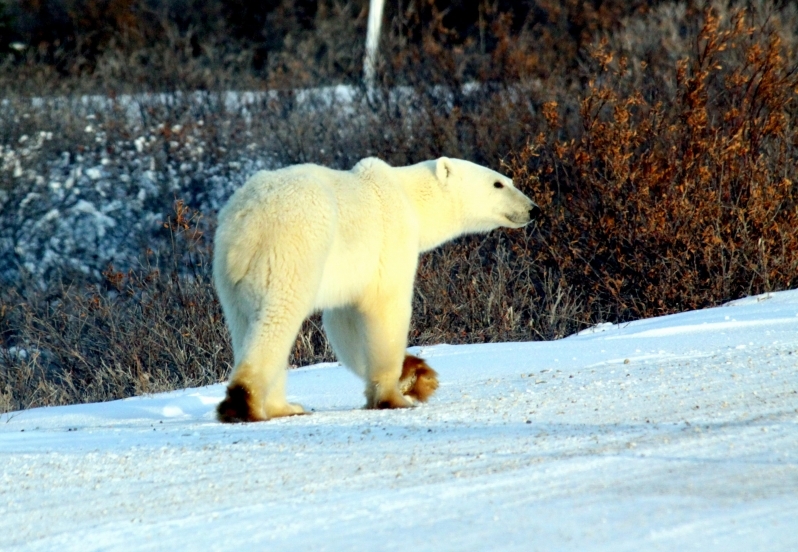 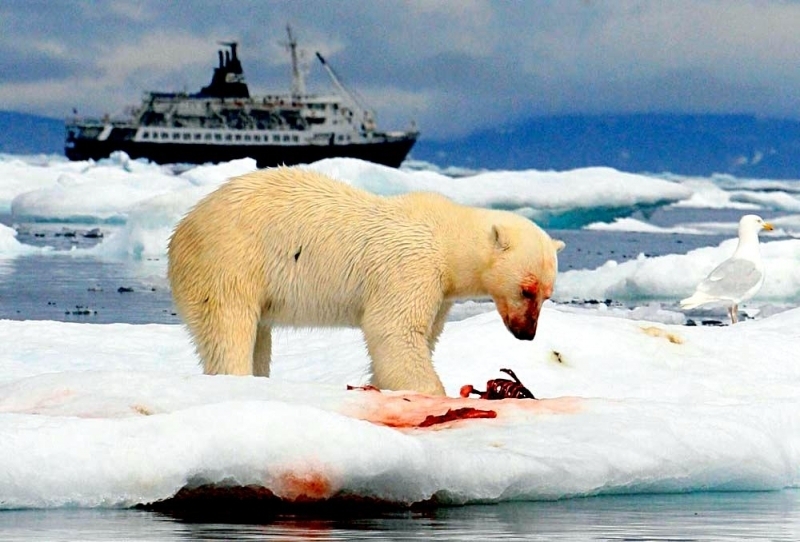 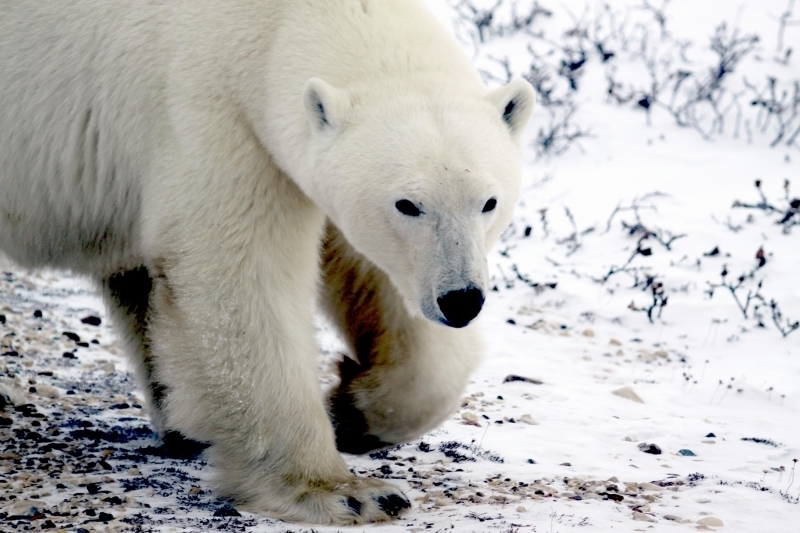 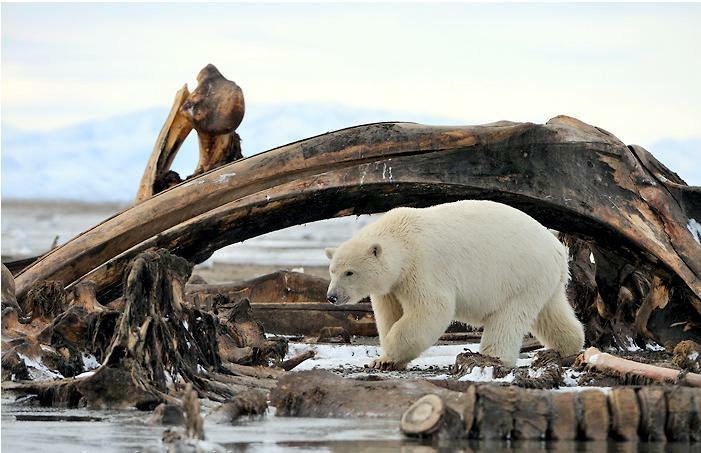 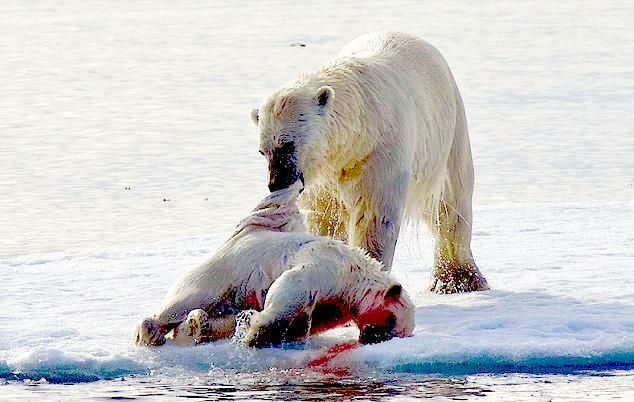 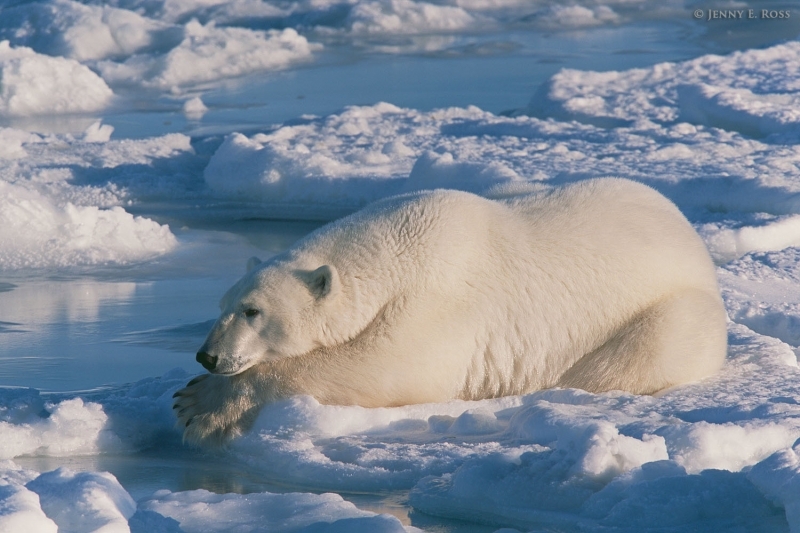 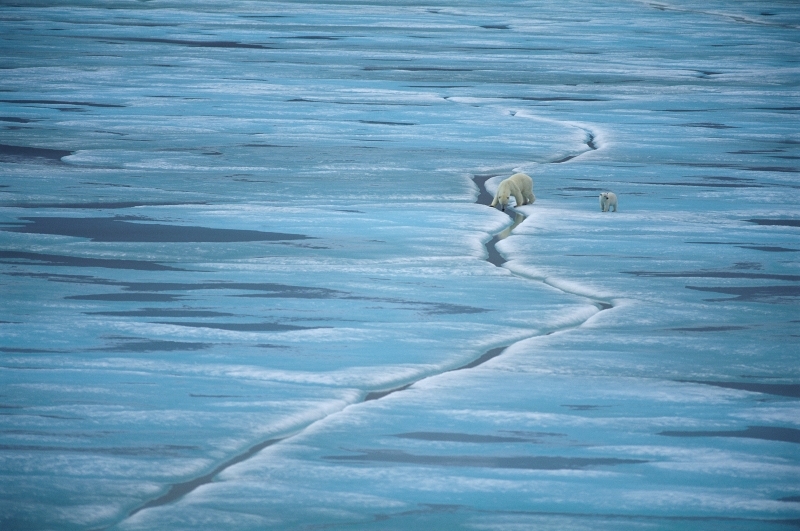 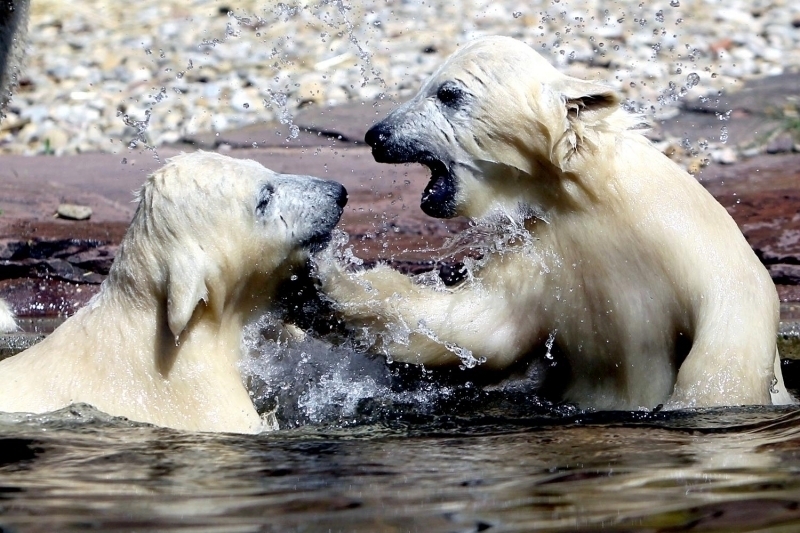 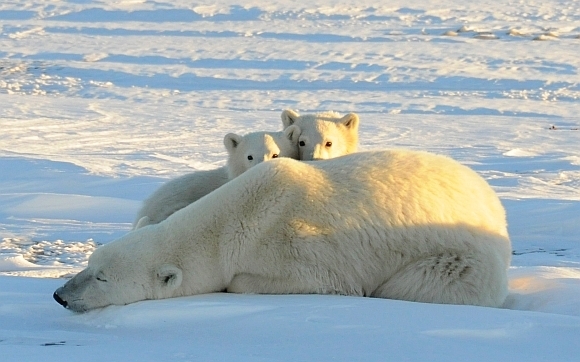 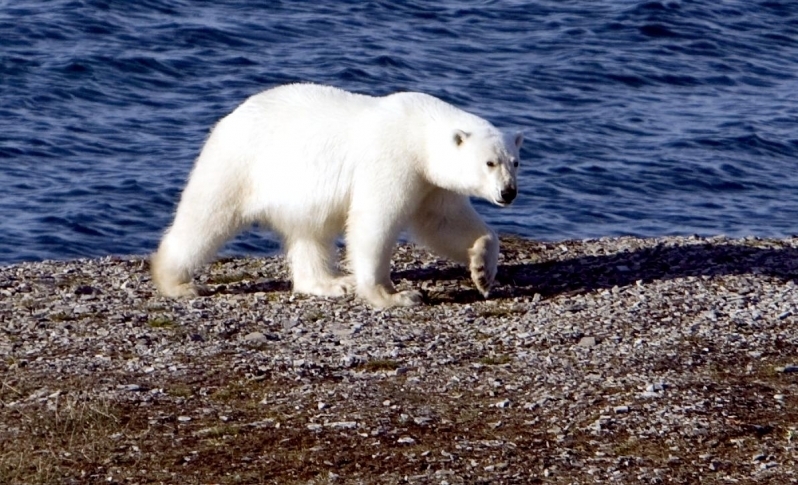 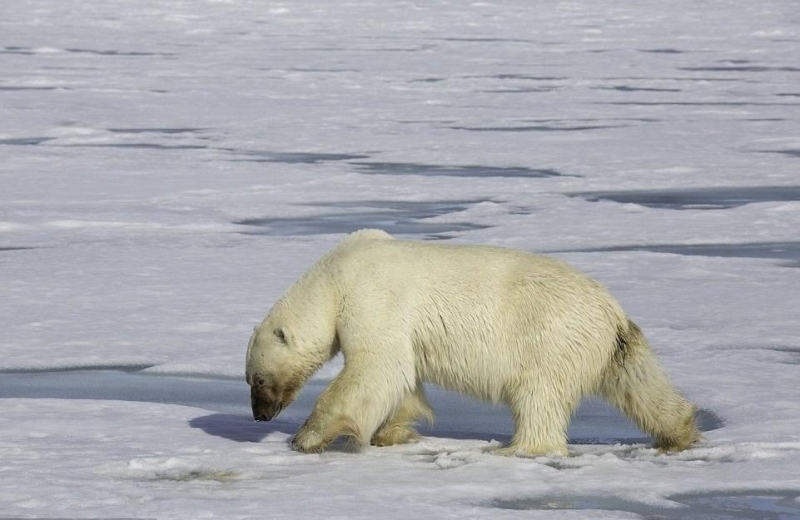 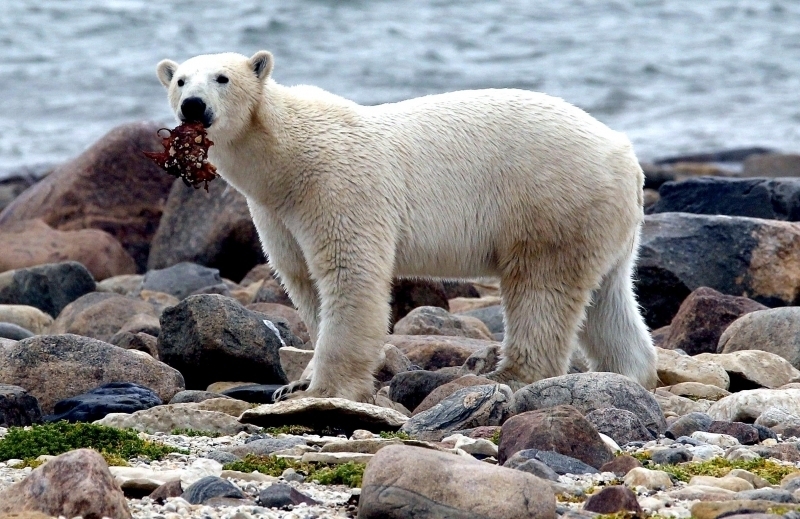 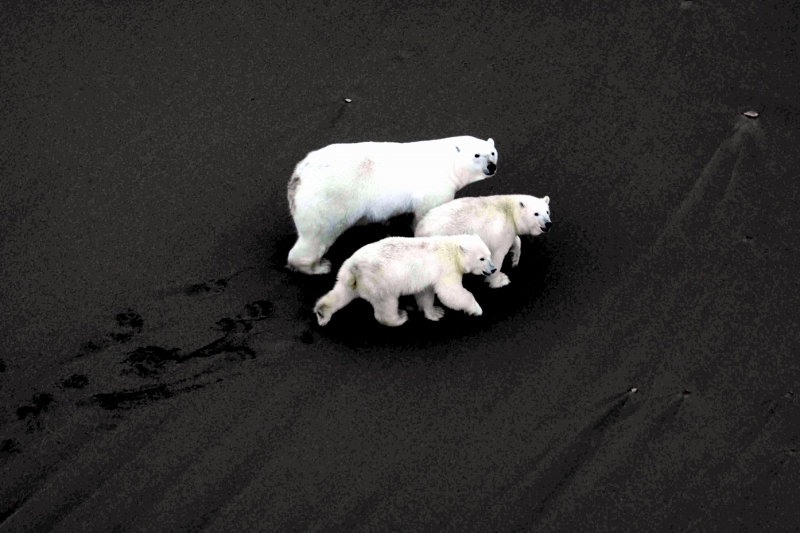 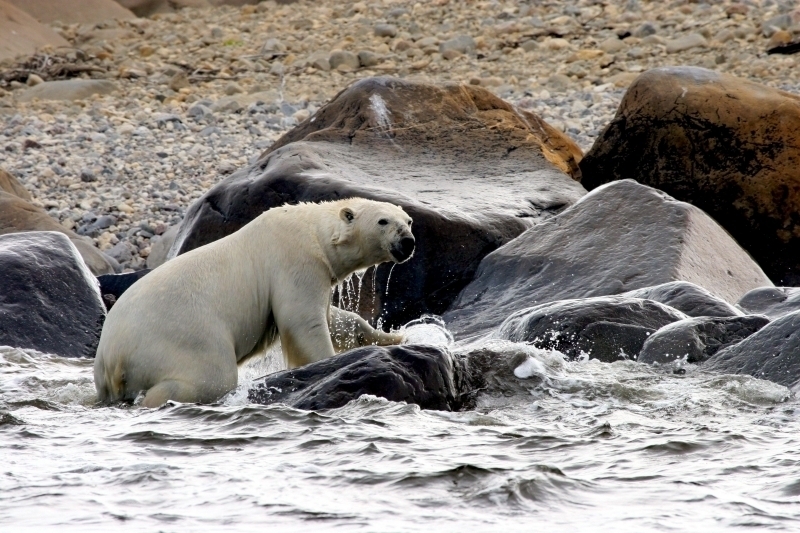 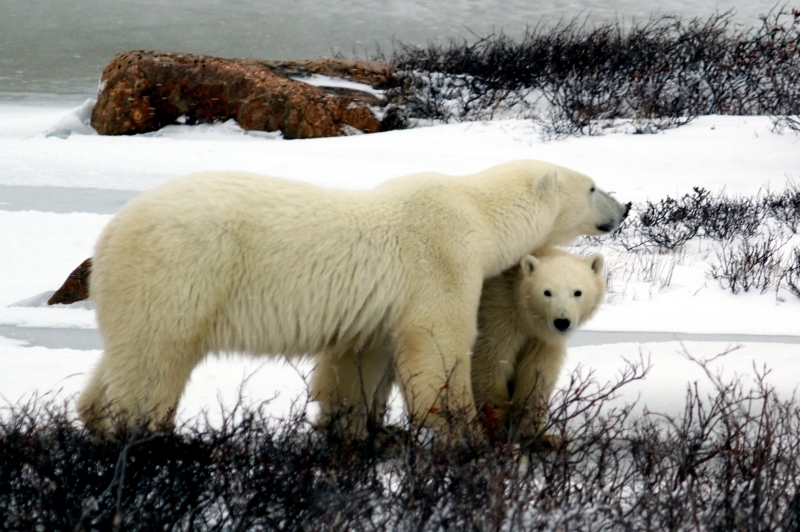 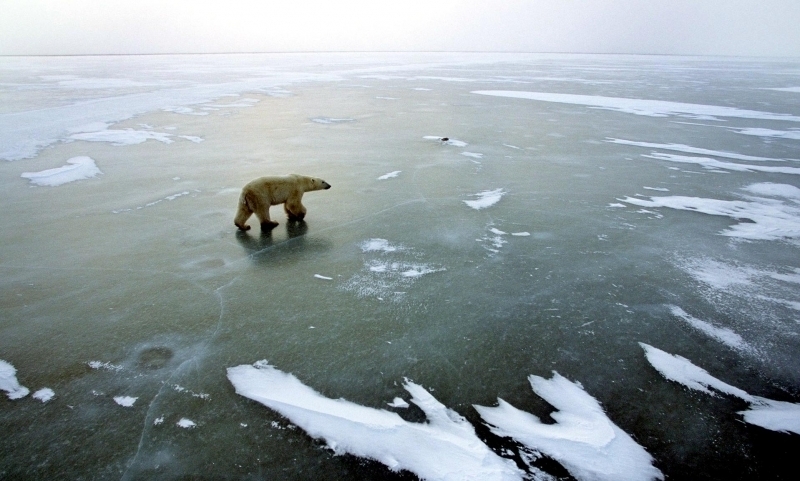 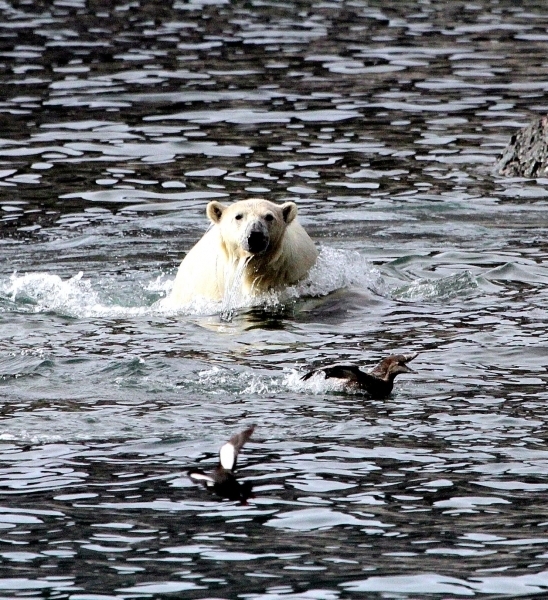 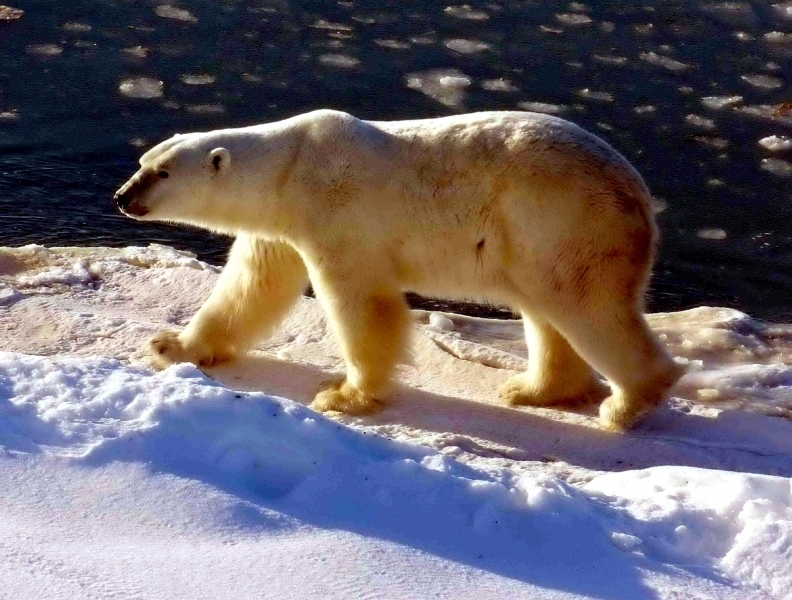 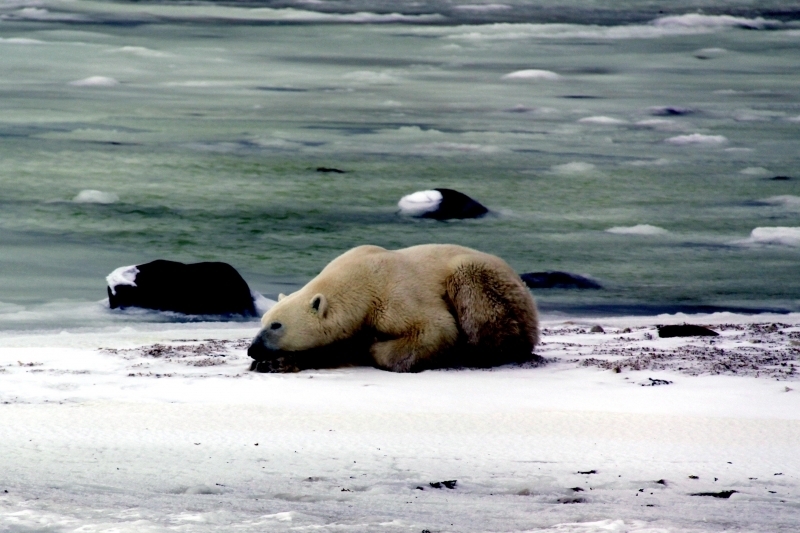 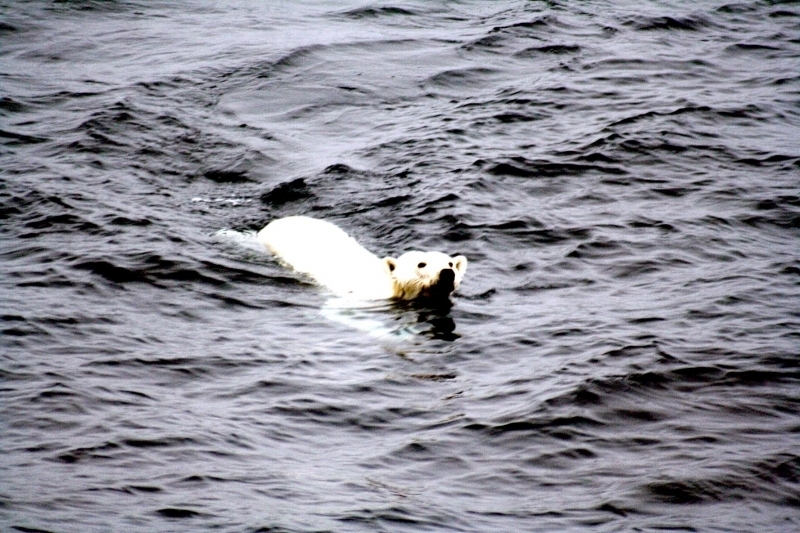 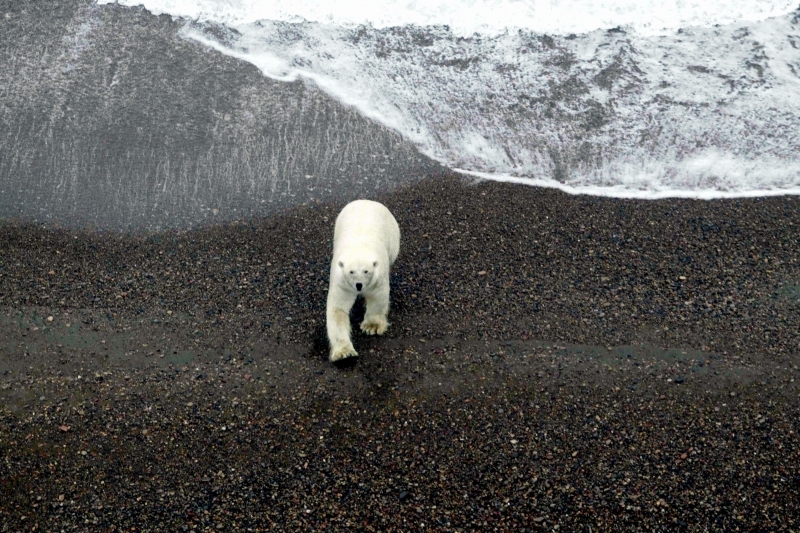 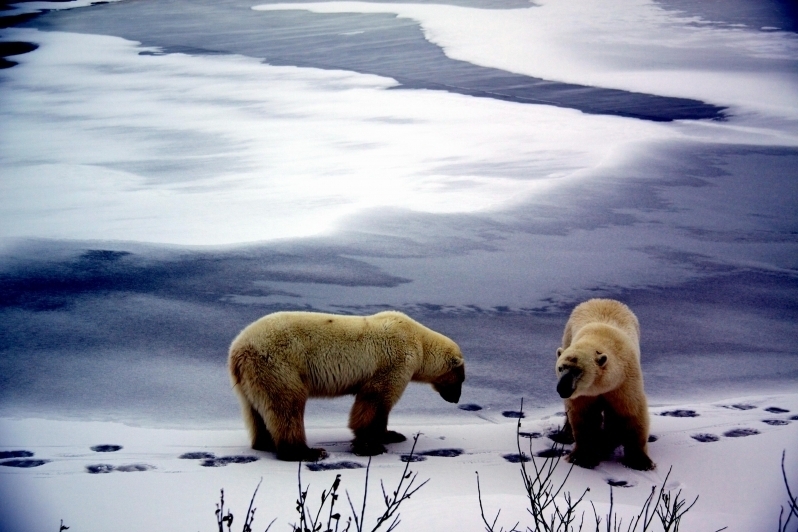 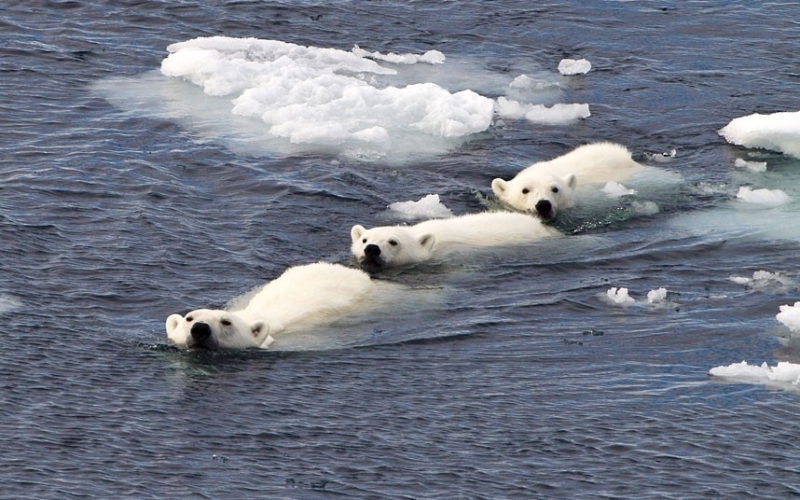 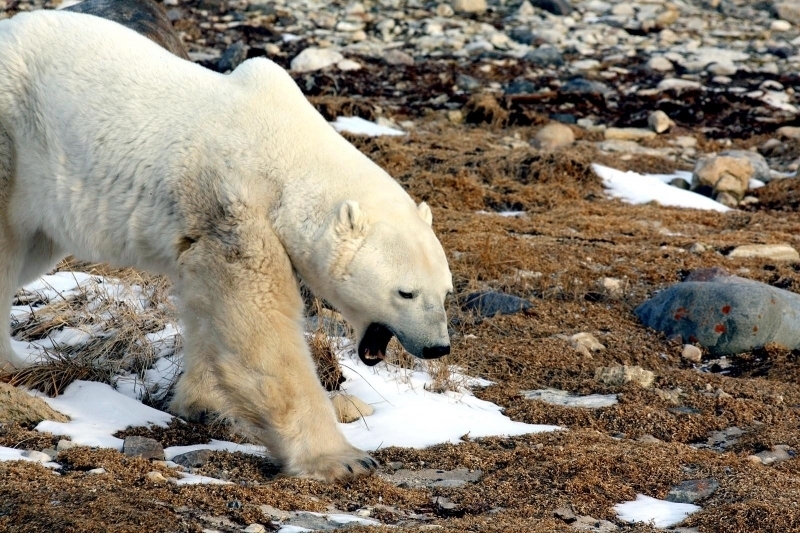 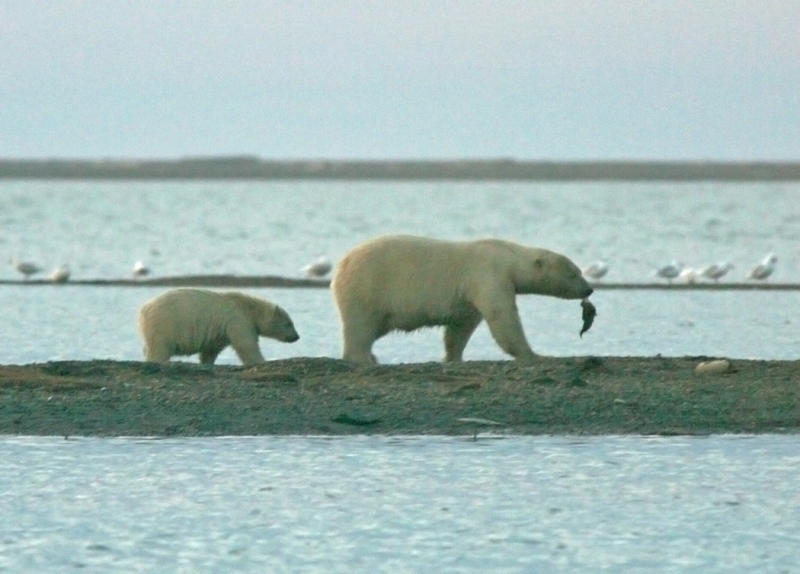 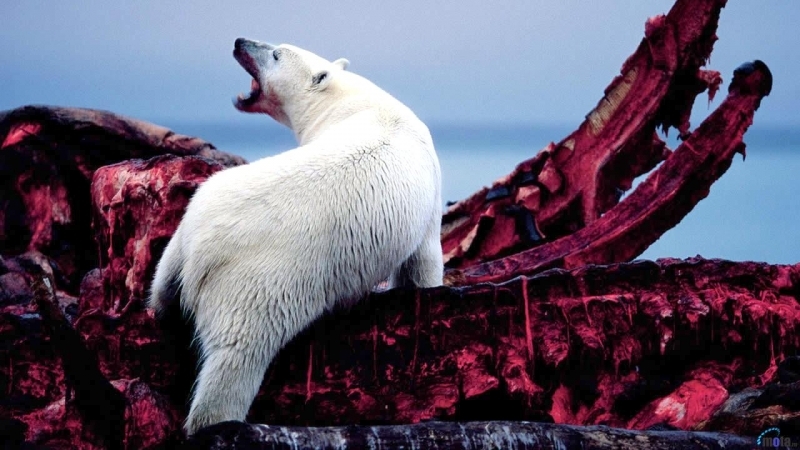 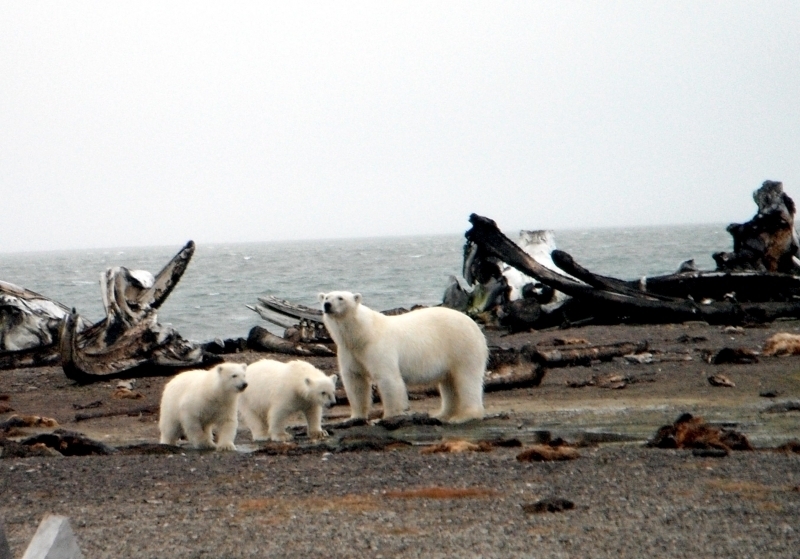 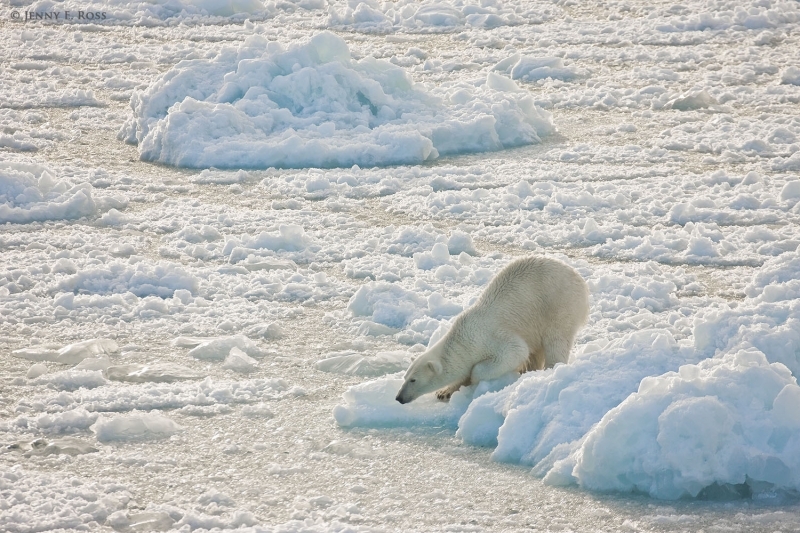 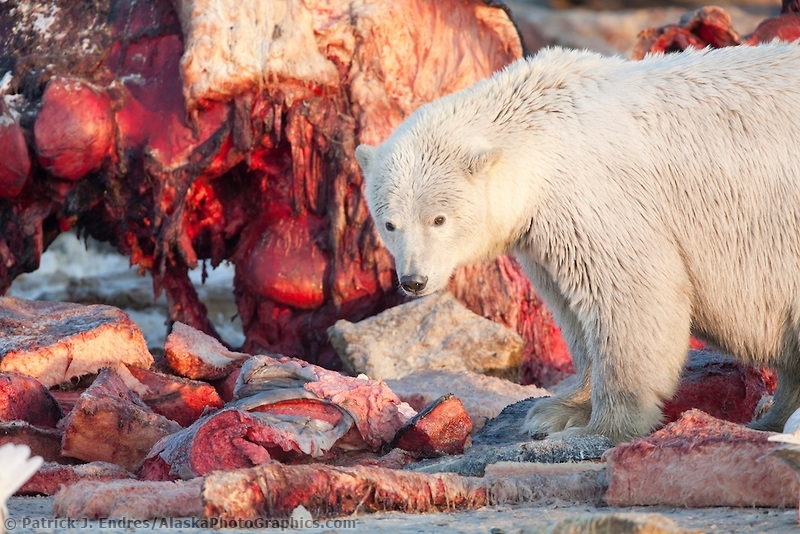 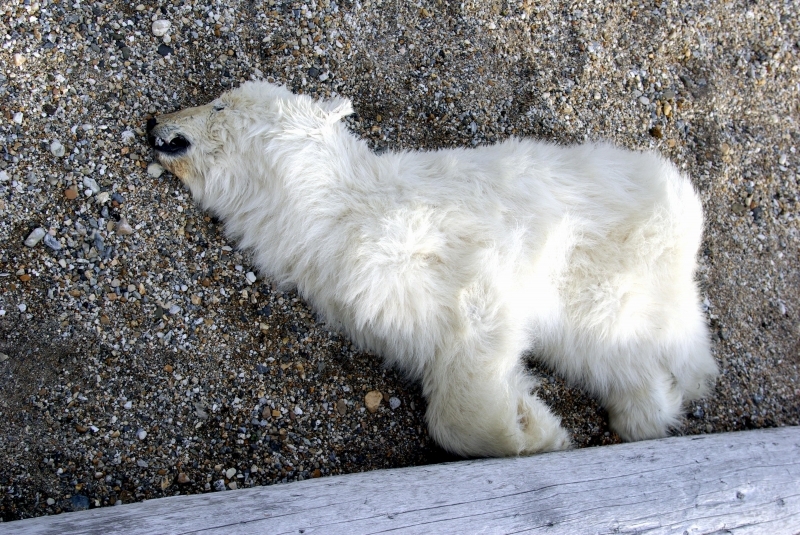 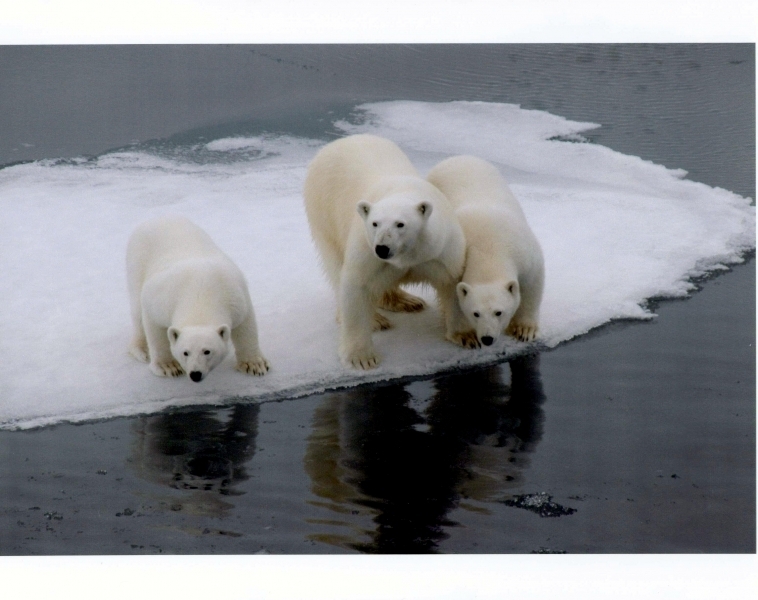 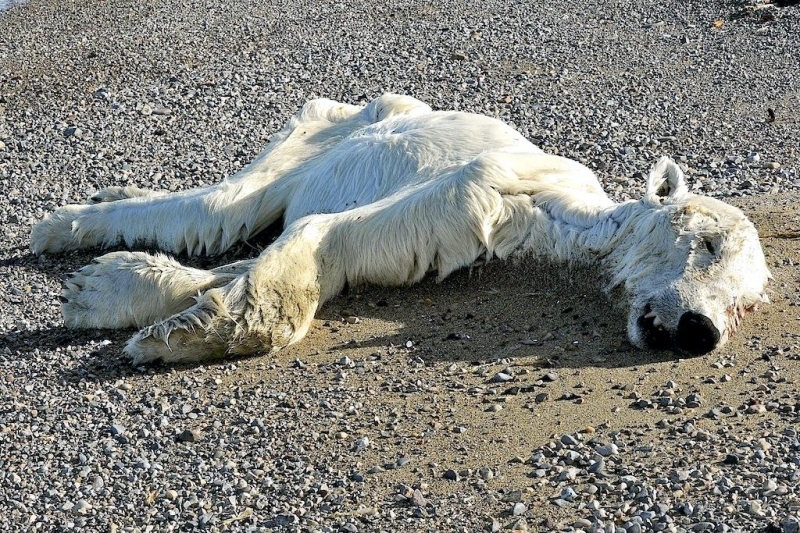 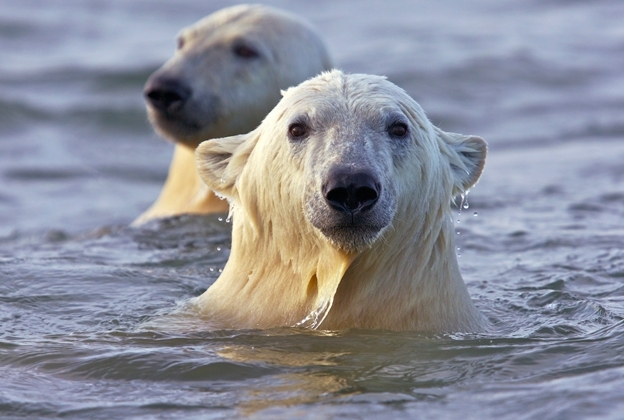 Polar Bears are threatened by declining Arctic sea ice, oil development & pollutants. 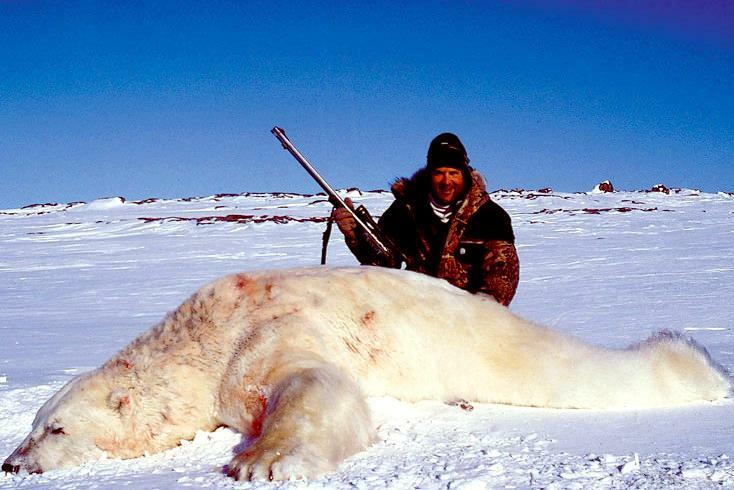 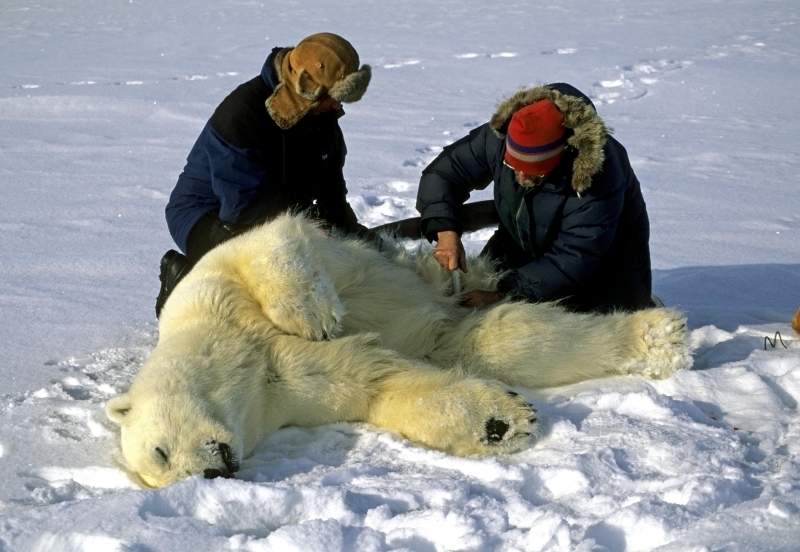 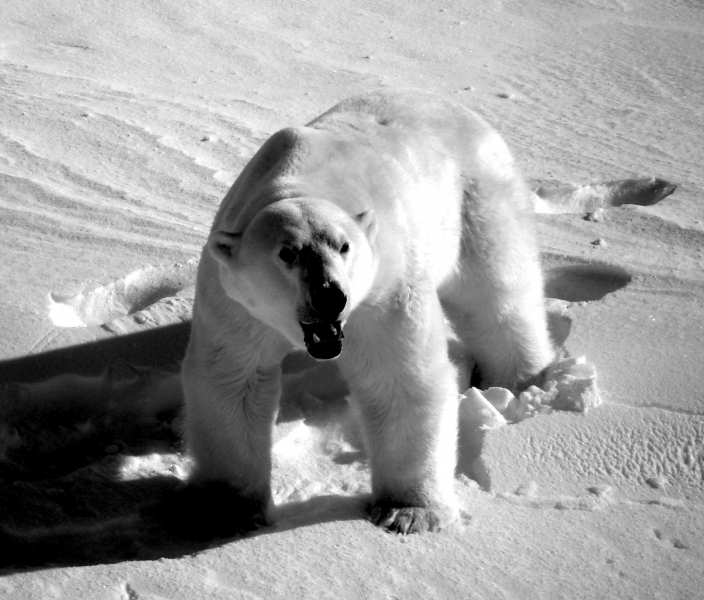 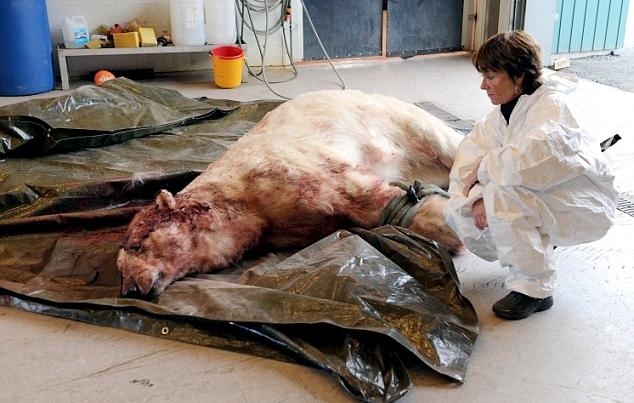 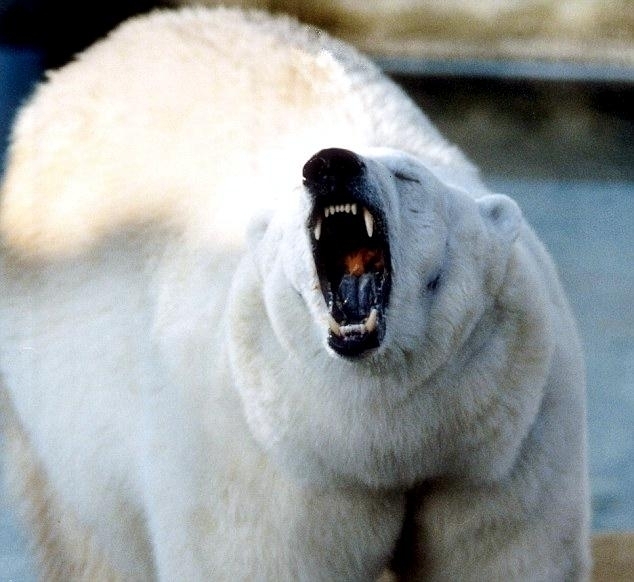 The largest Polar Bear ever recorded was a male that weighed 2,209 pounds according to Polar Bear International. 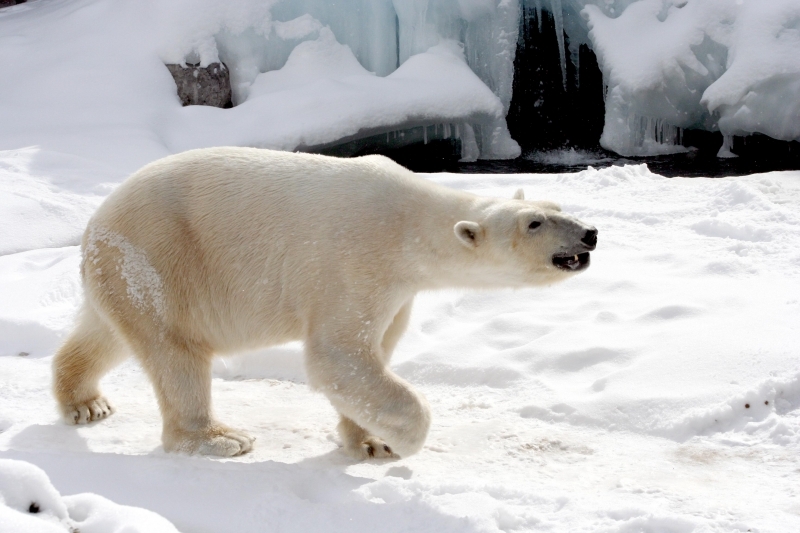 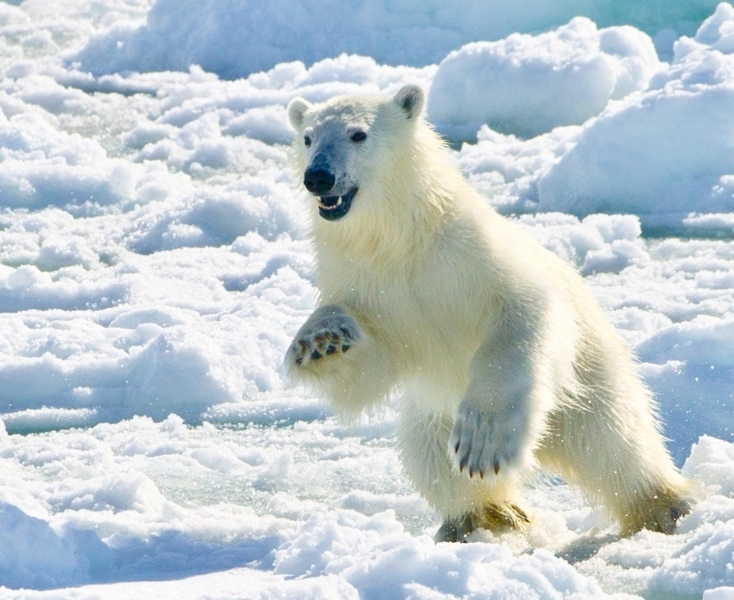 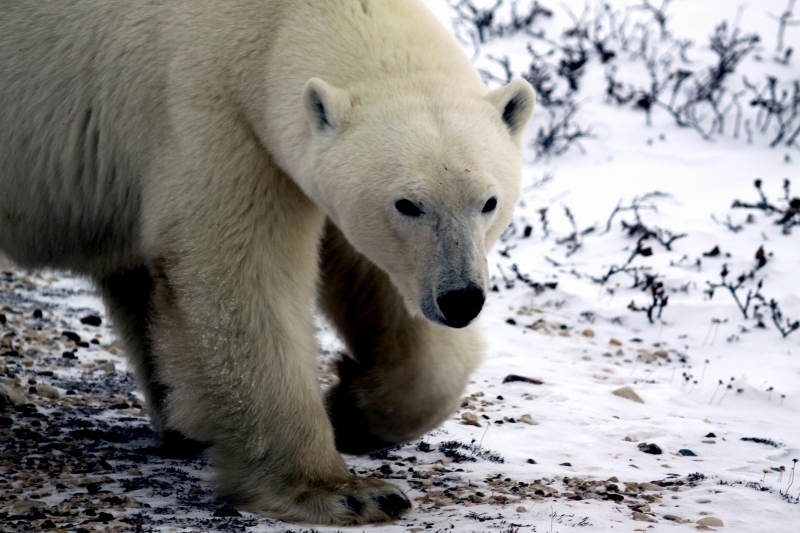 Though temperatures in the Arctic can plunge to minus 50 °F, Polar Bears actually have more problems with overheating than with being cold especially when they run, because of all their heat-trapping evolutionary traits. 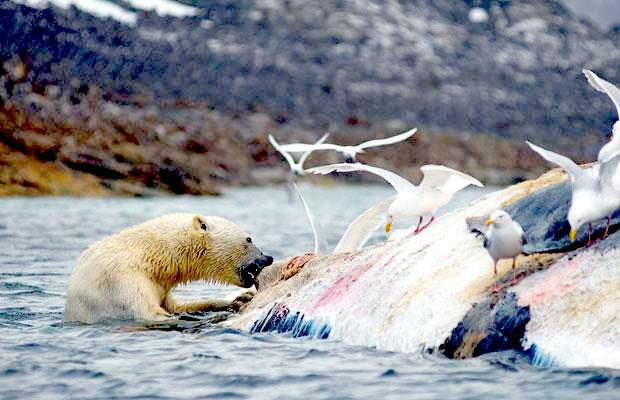 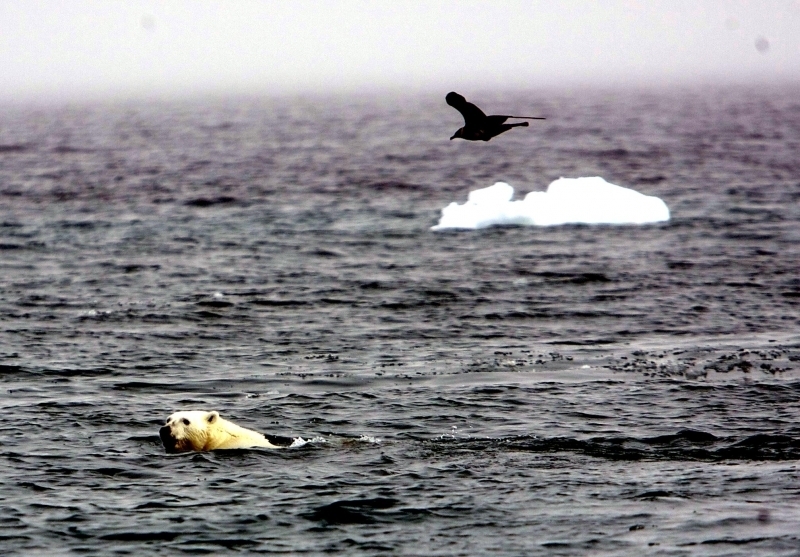 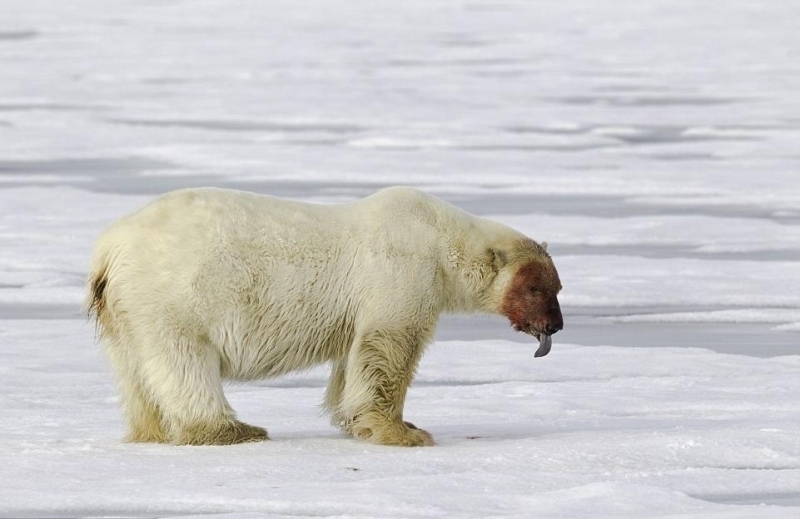 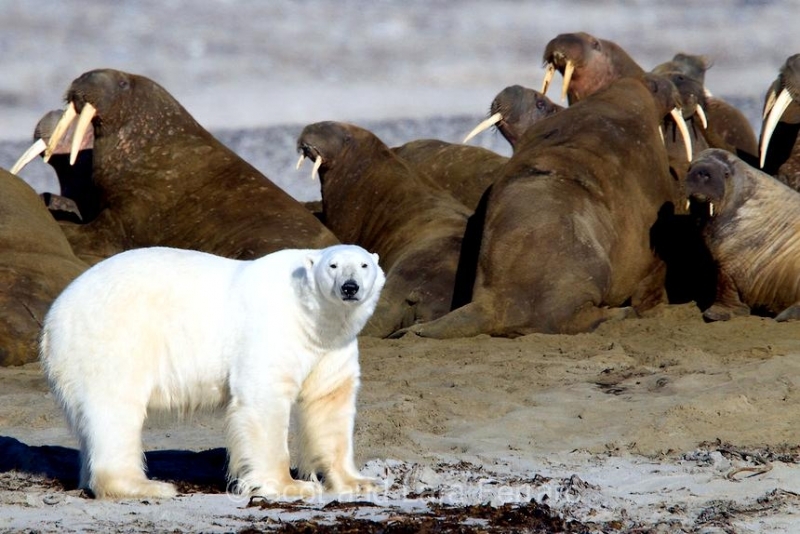 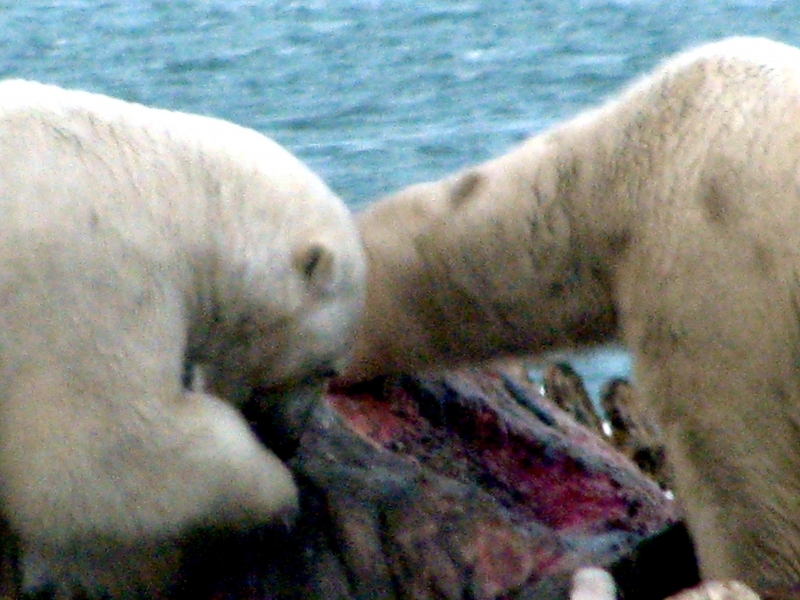 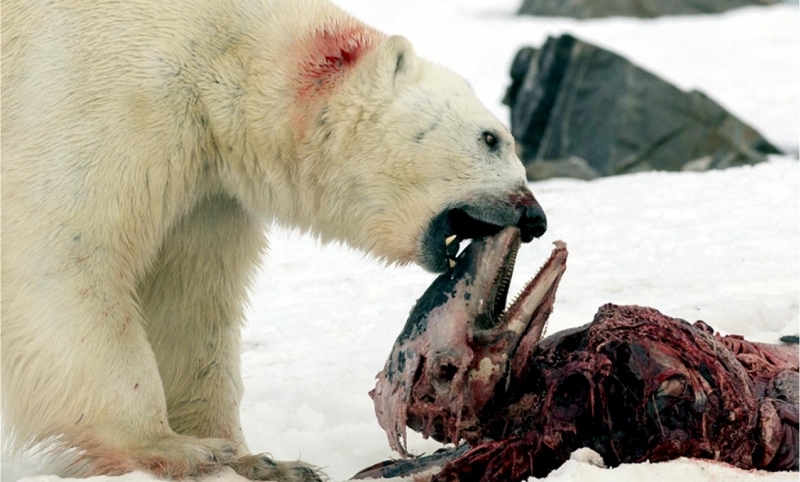 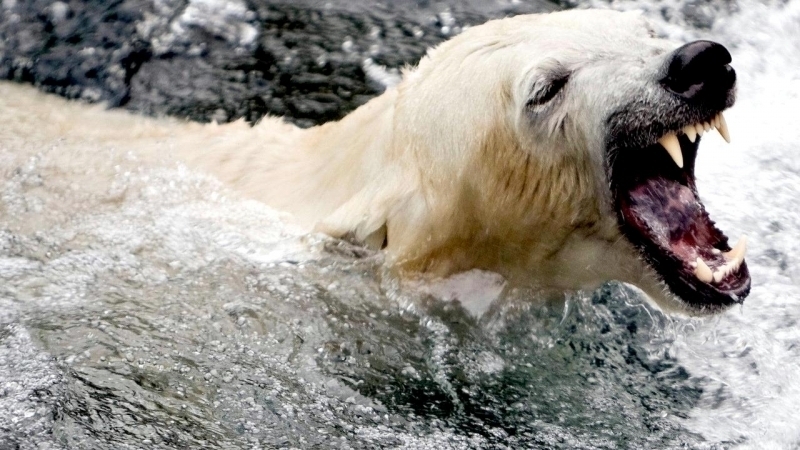 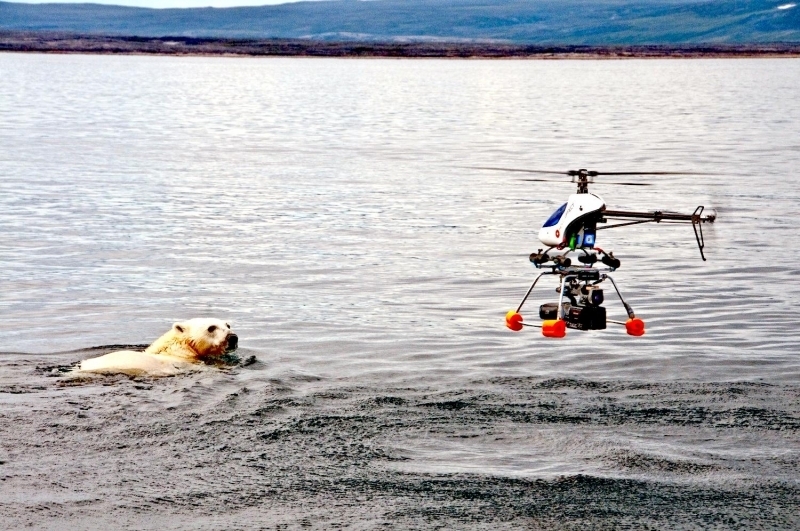 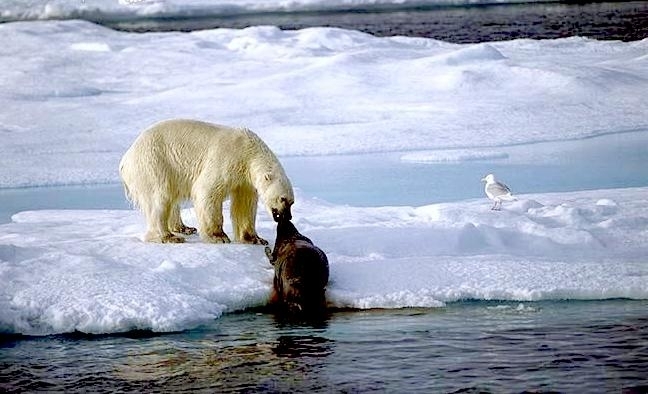 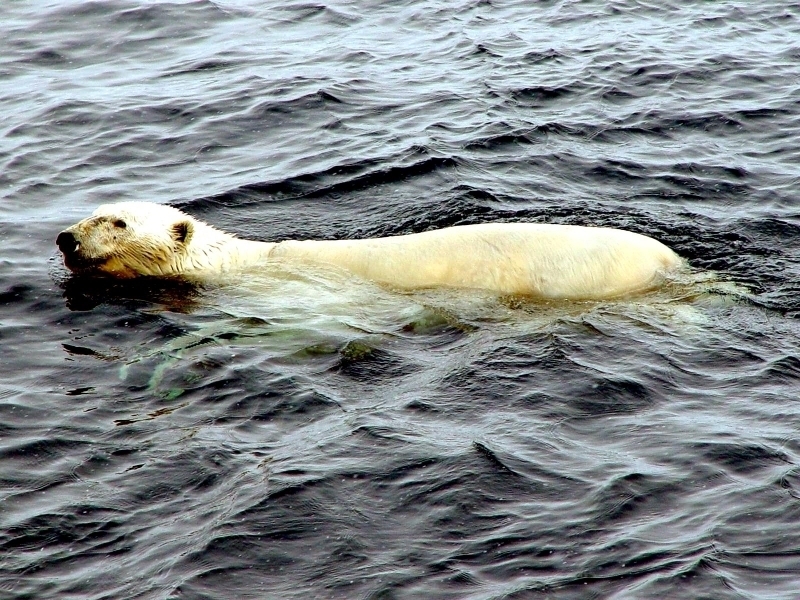 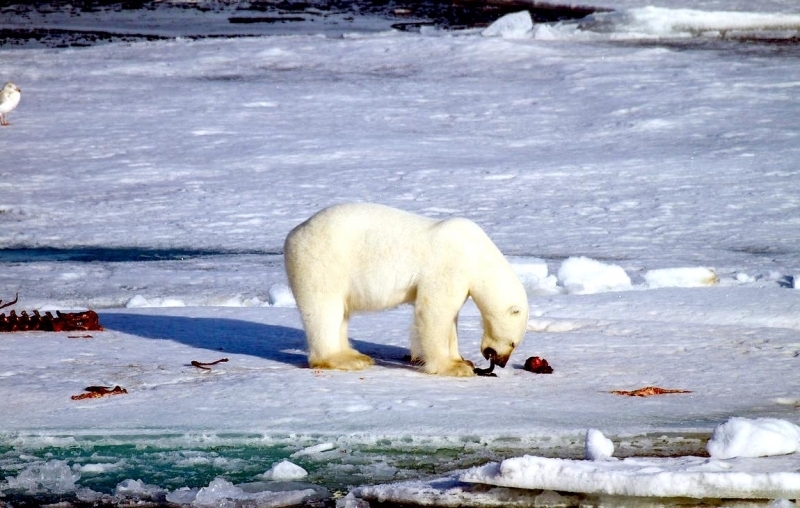 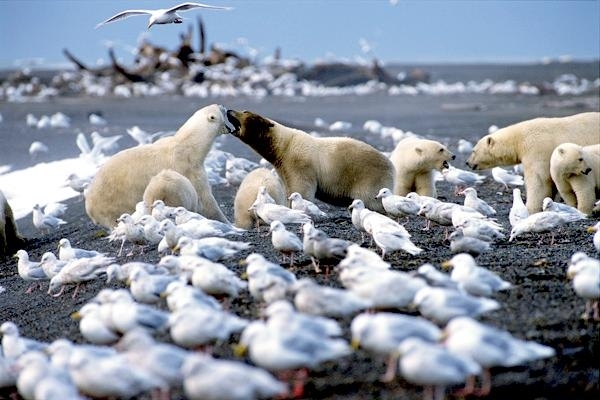 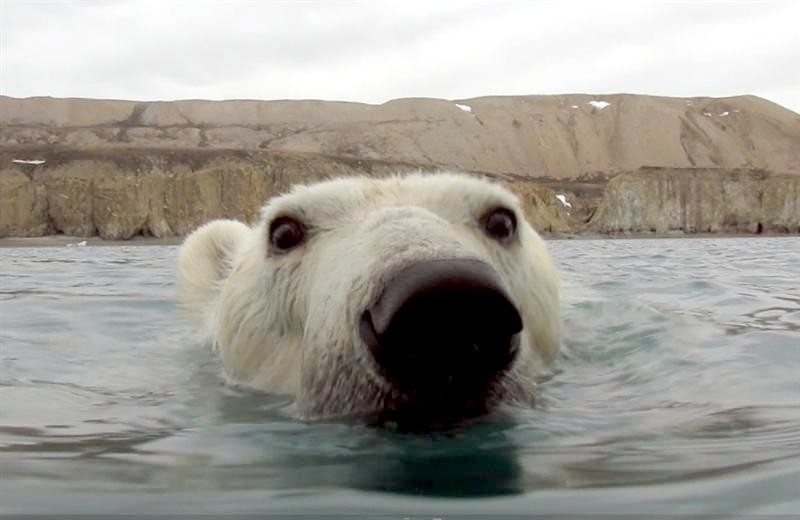 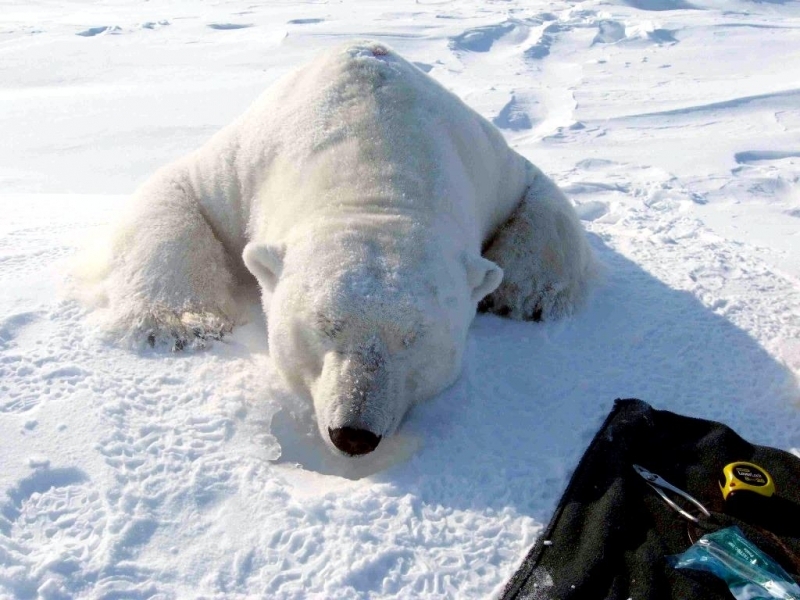 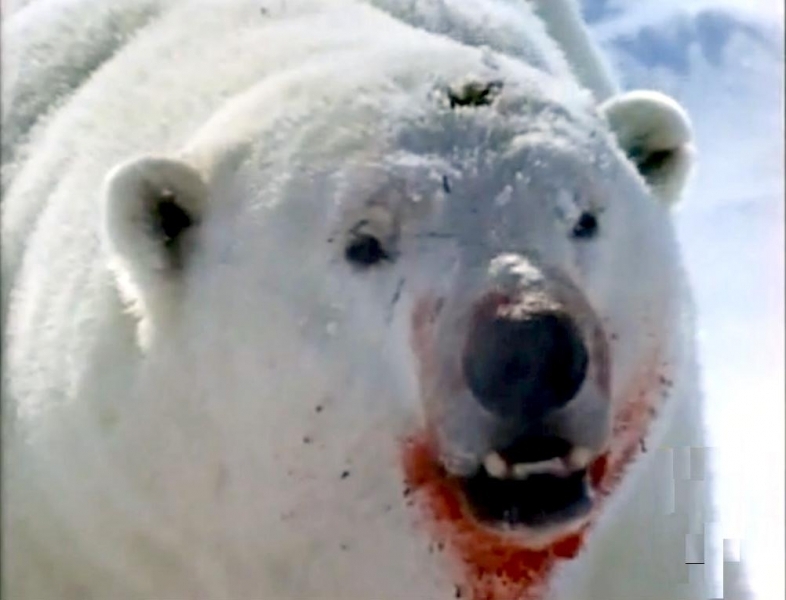 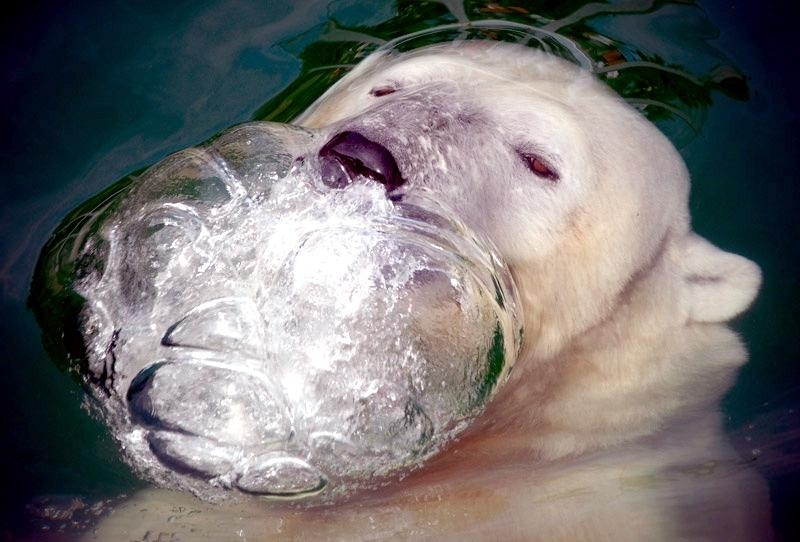 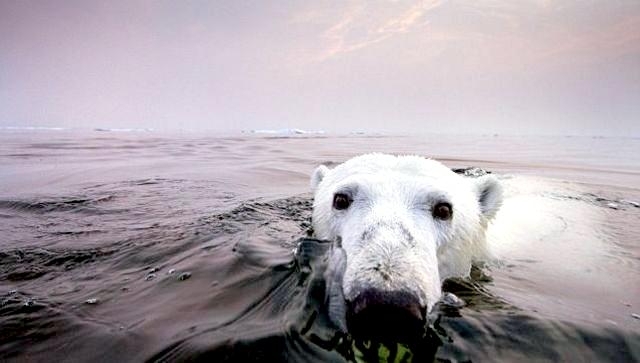 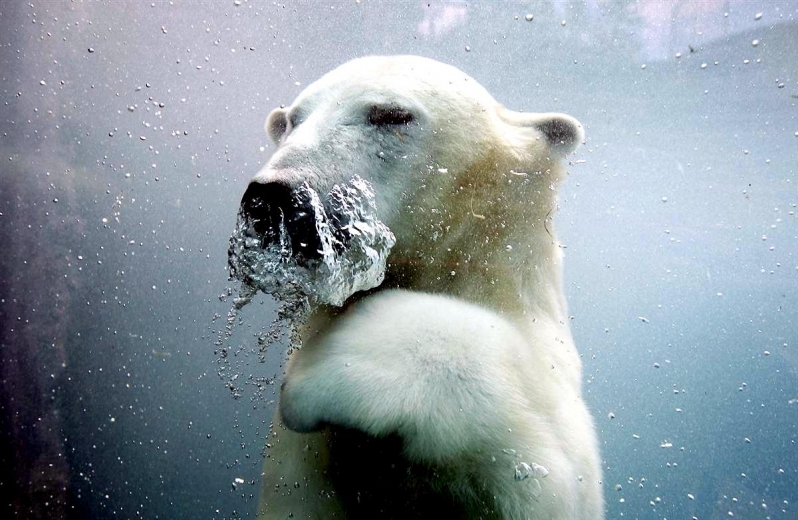 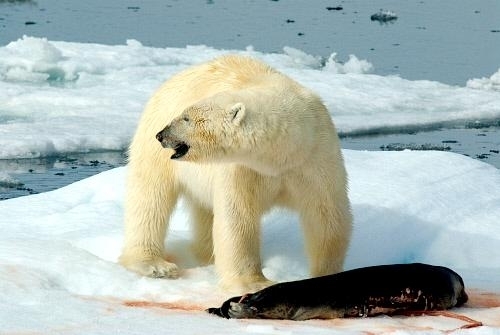 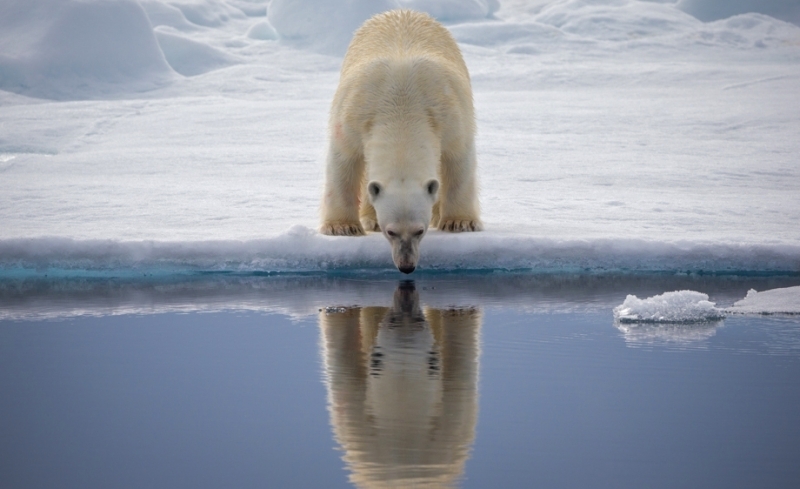 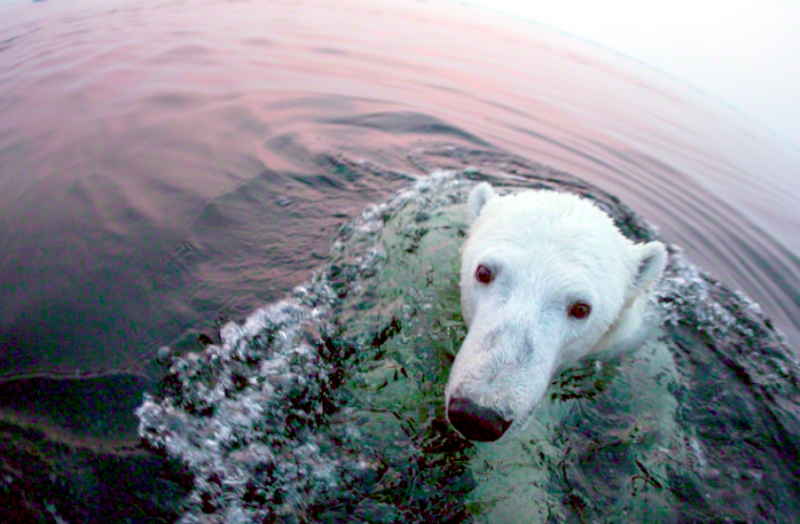 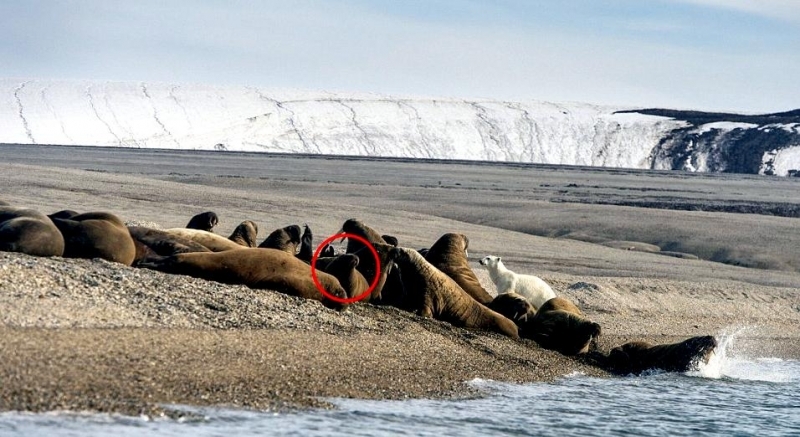 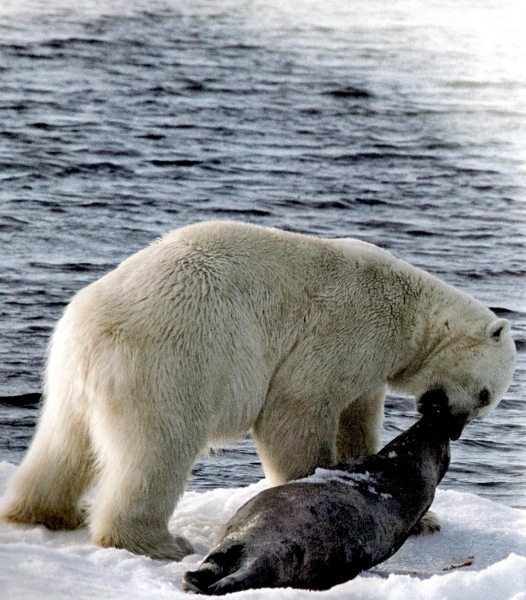 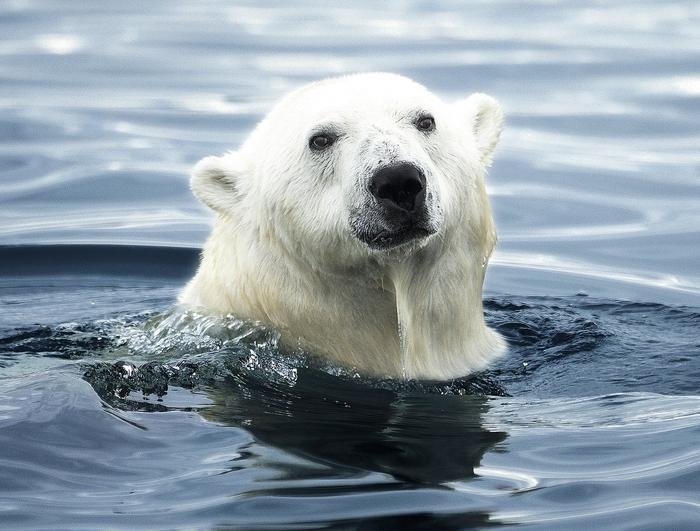 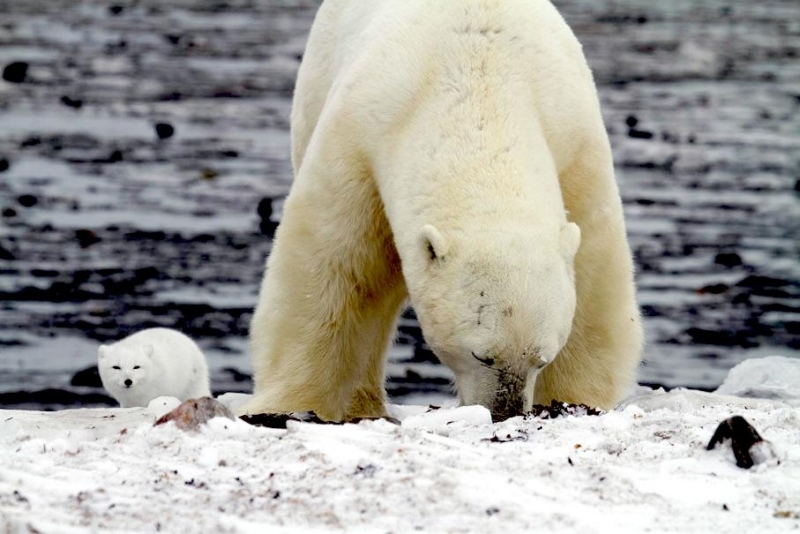 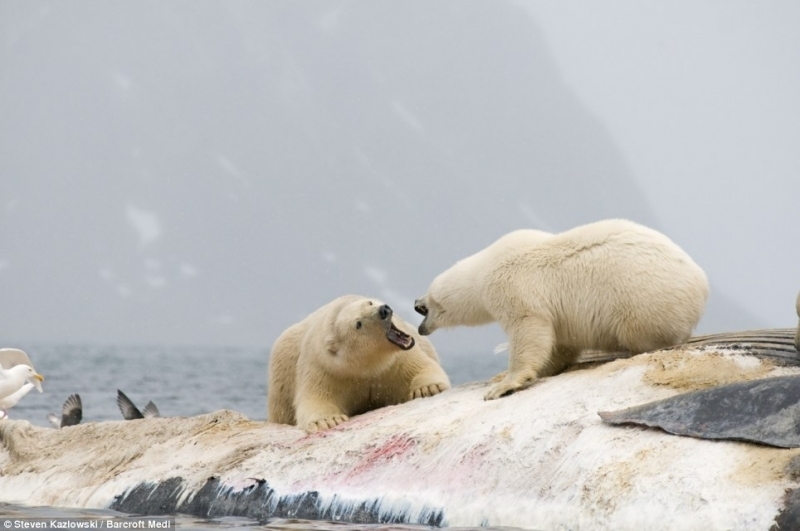 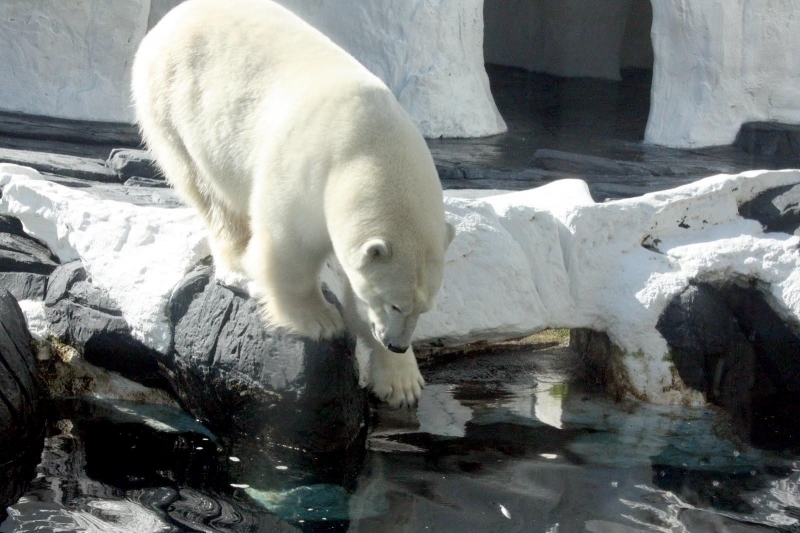 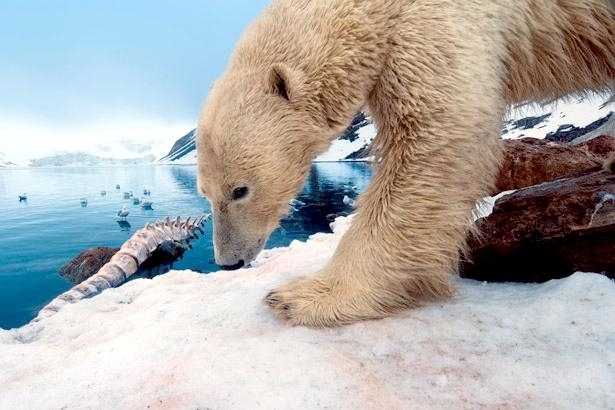 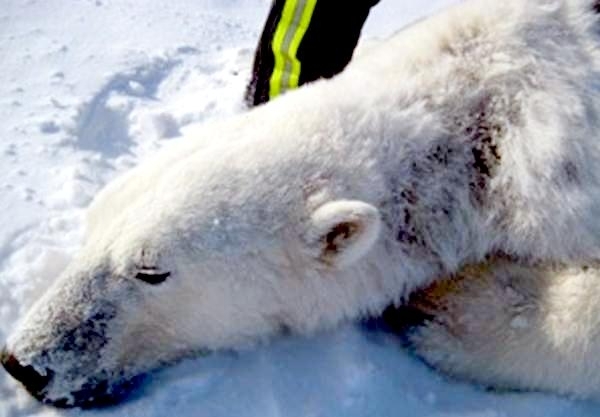 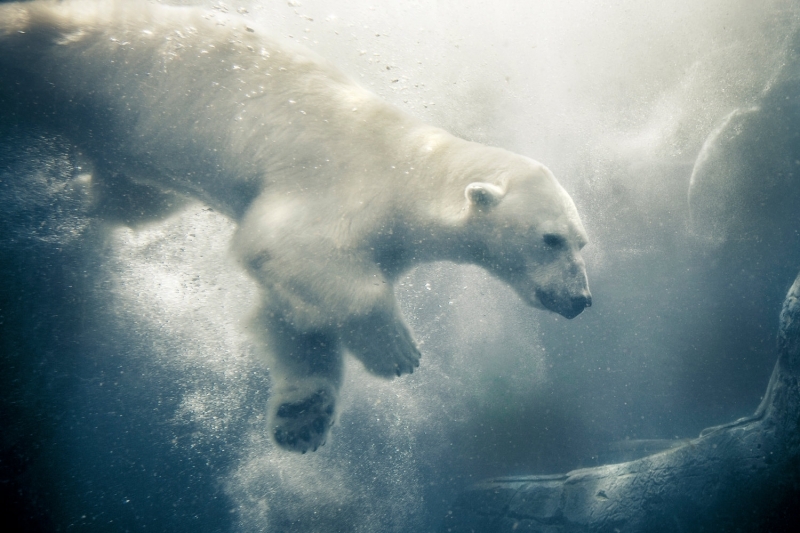 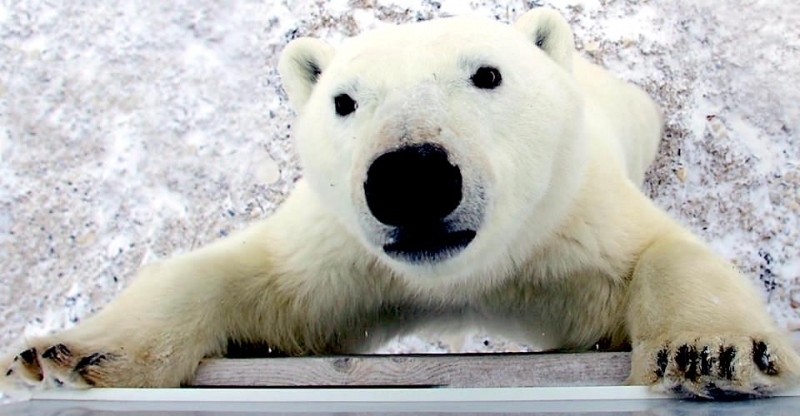 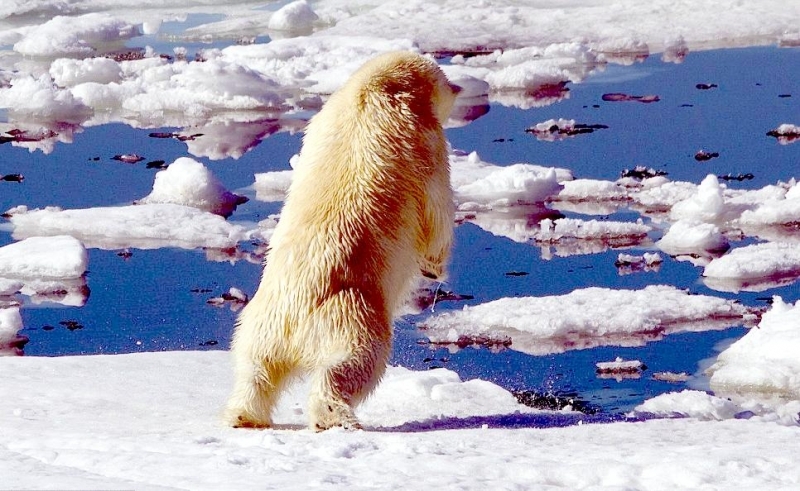 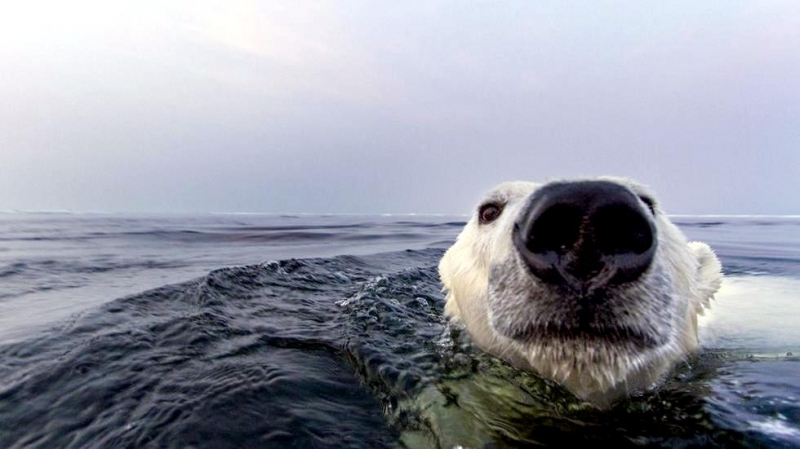 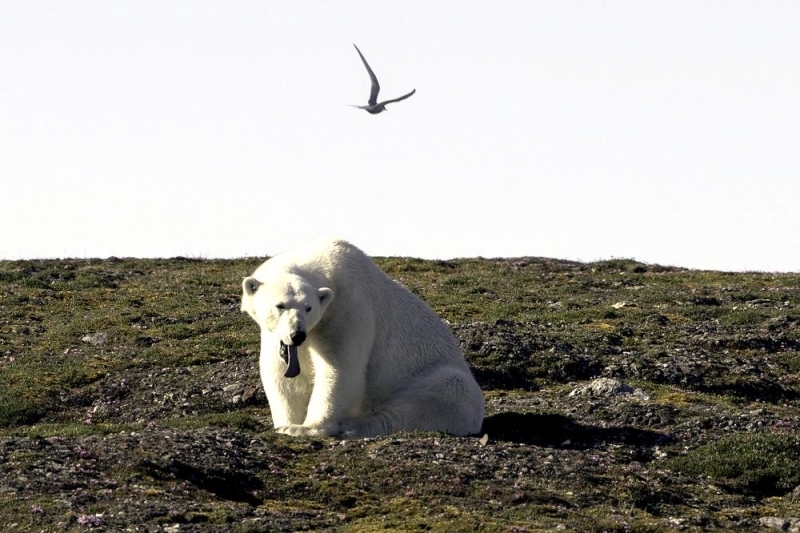 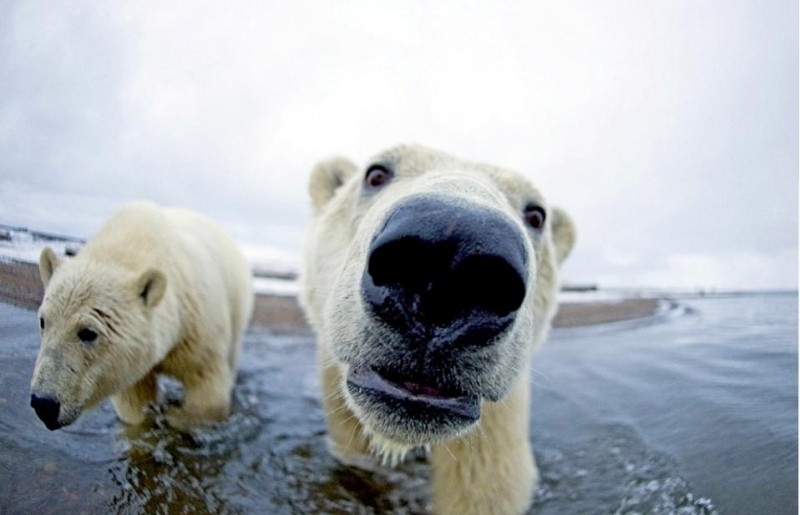 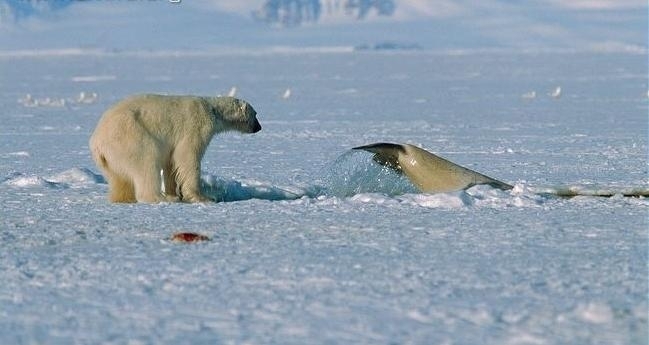 A Polar Bear can sniff out a seal’s breathing hole more than half a mile away. 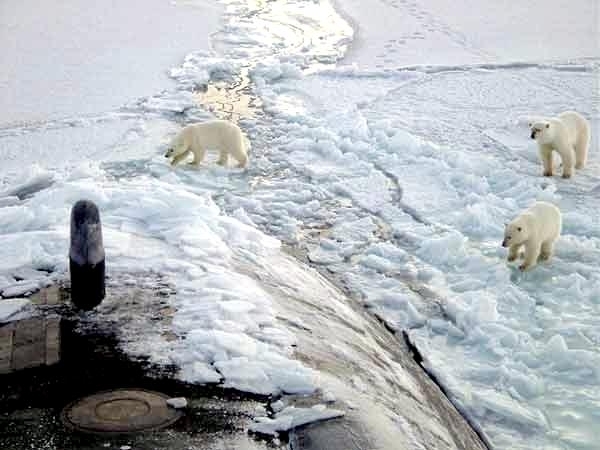 They can smell a seal on the ice 20 miles away. 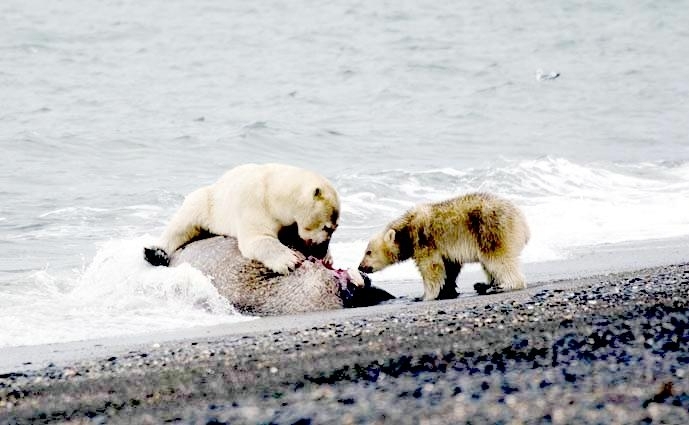 They succeed in catching their prey in only 2% of attempts. 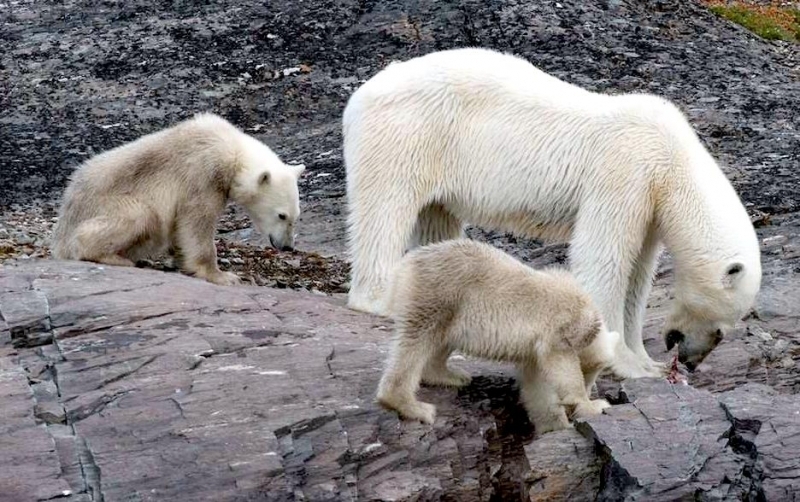 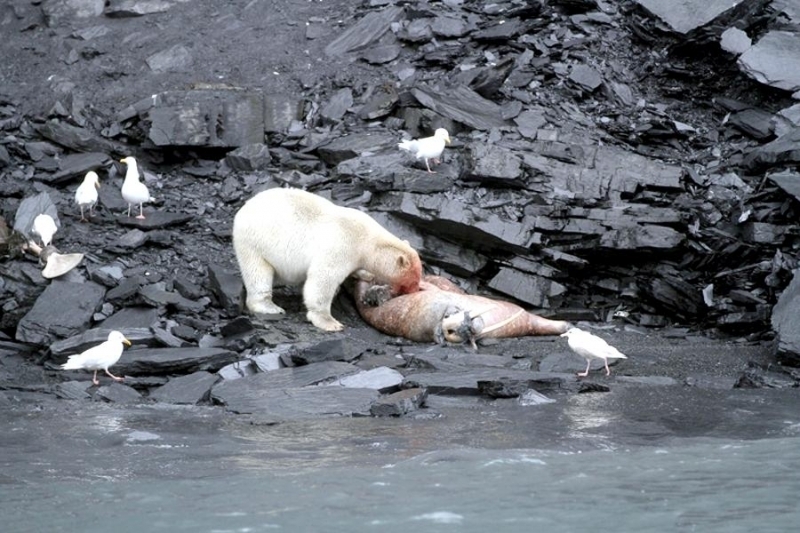 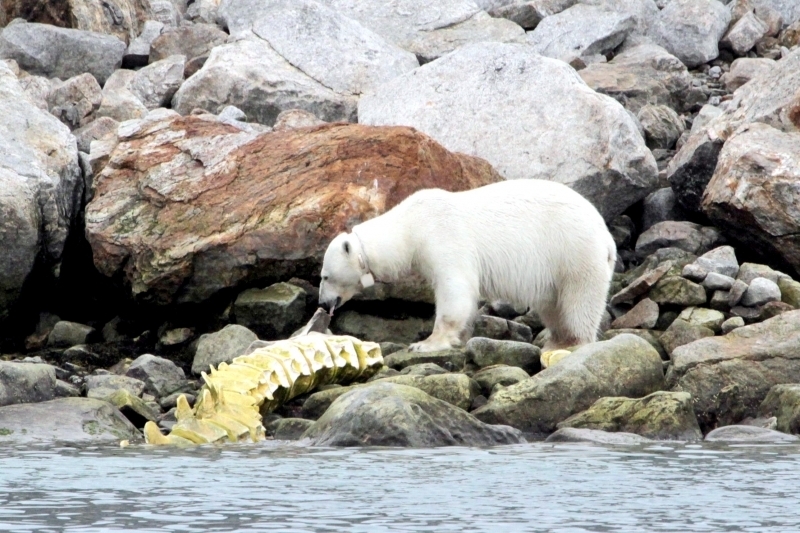 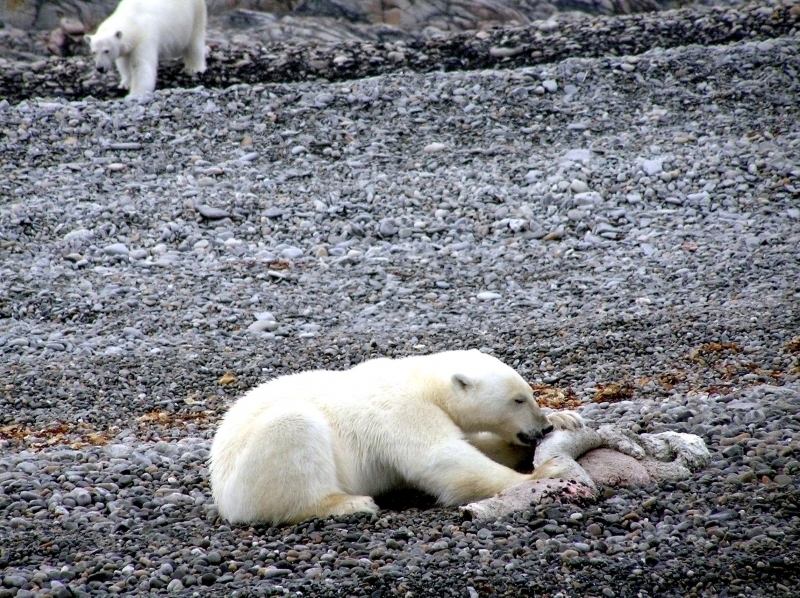 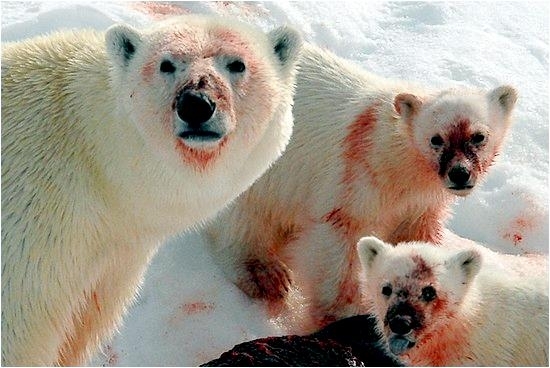 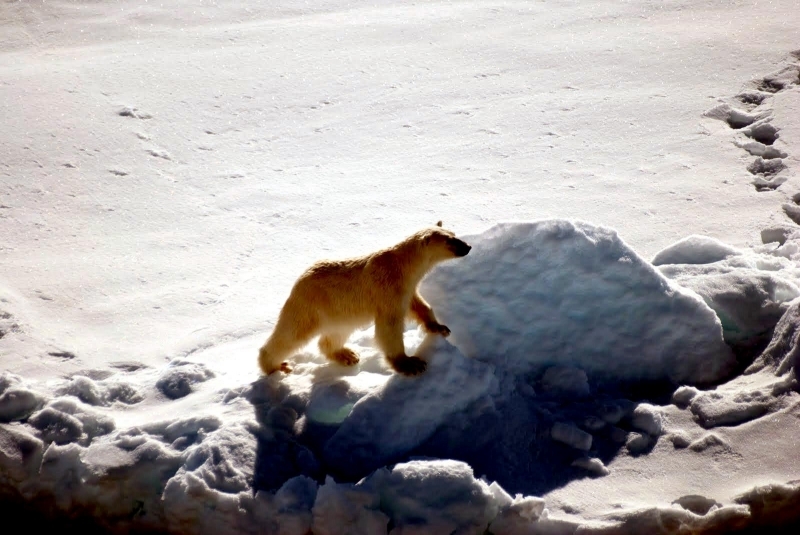 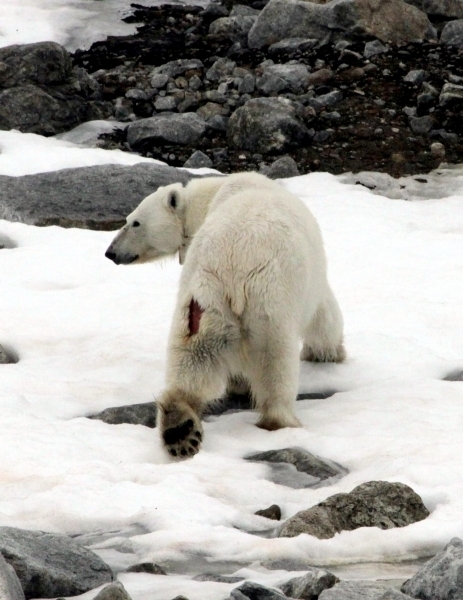 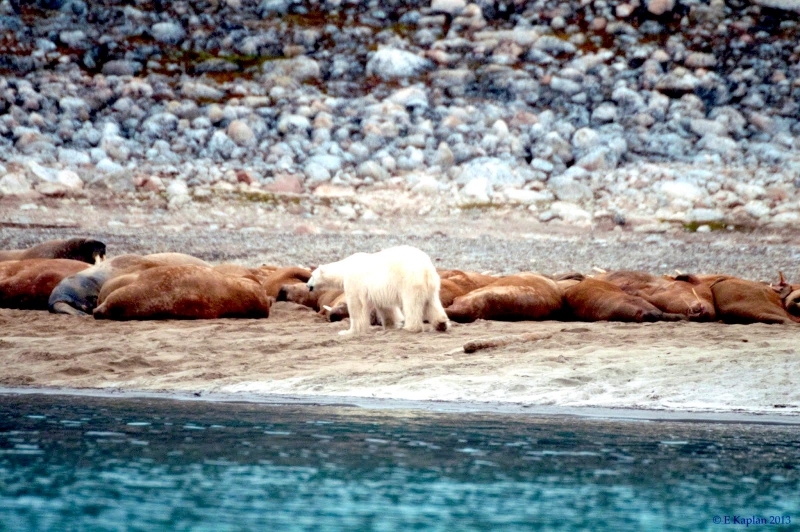 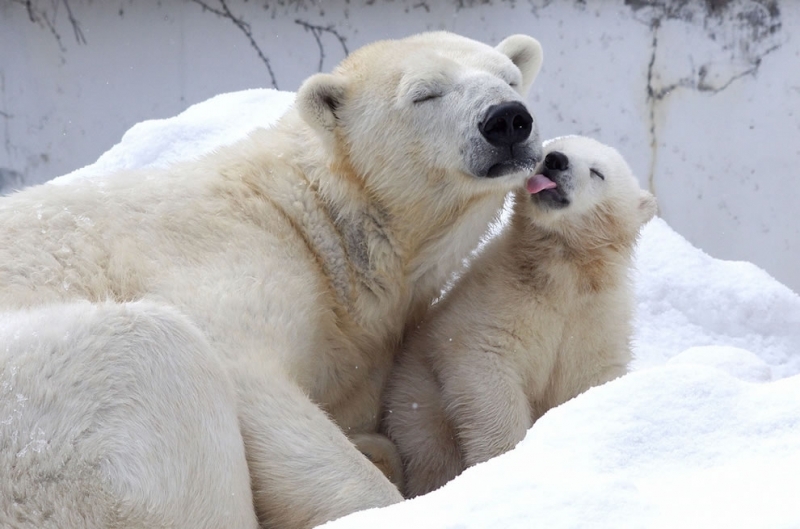 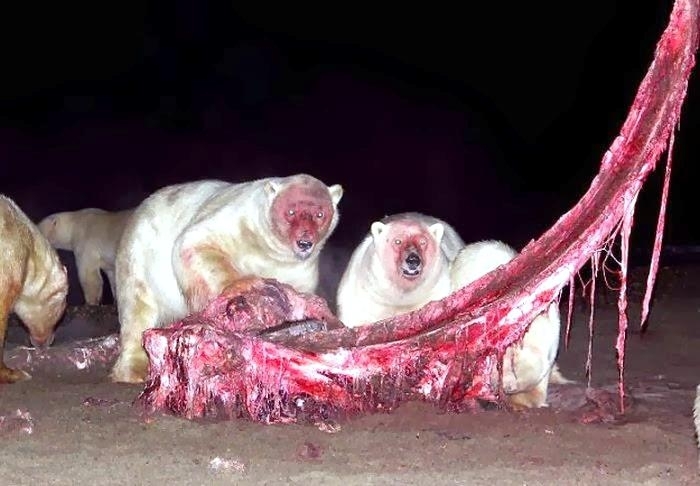 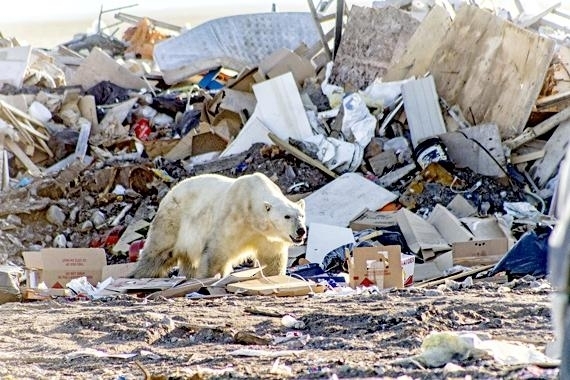 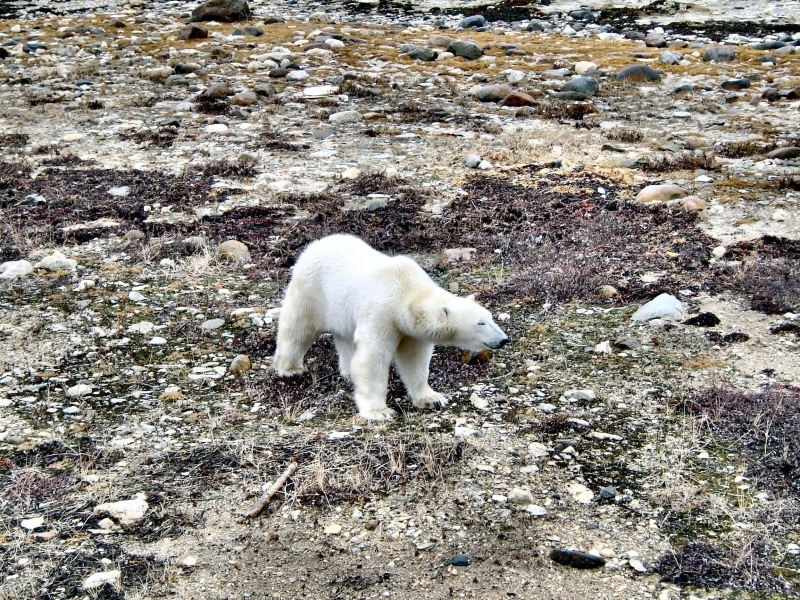 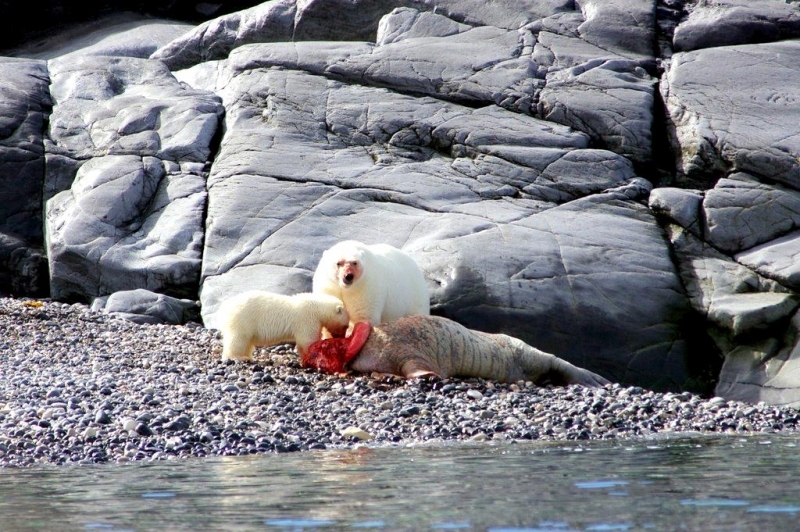 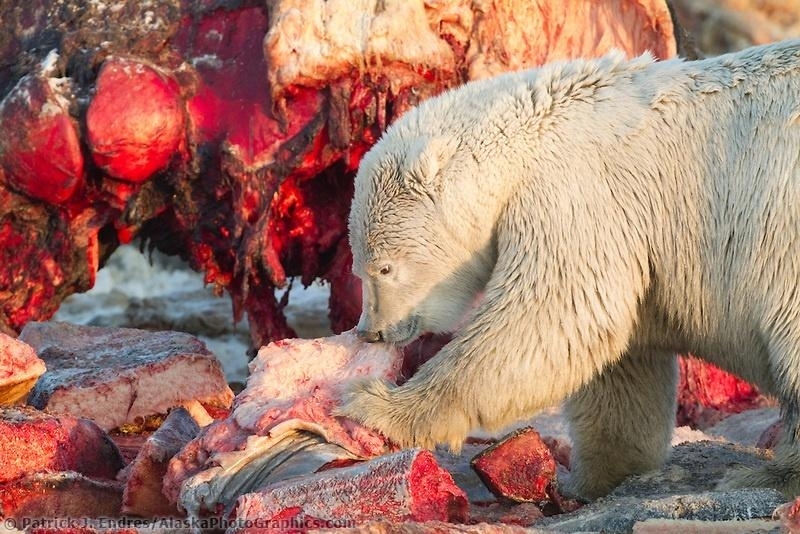 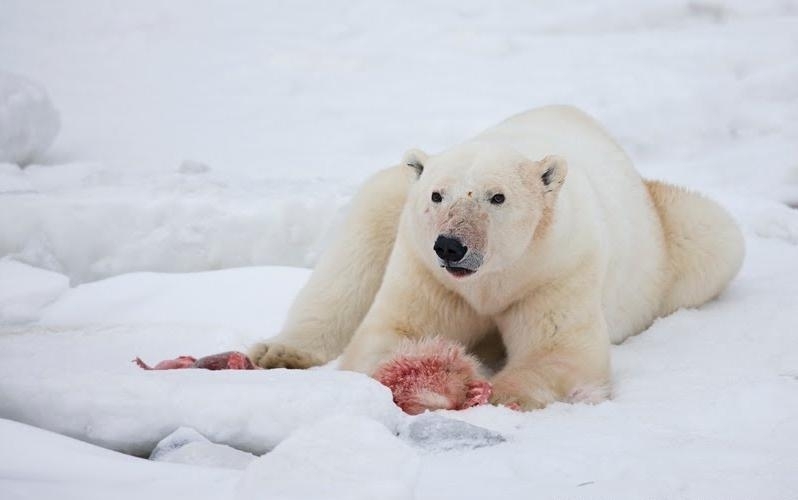 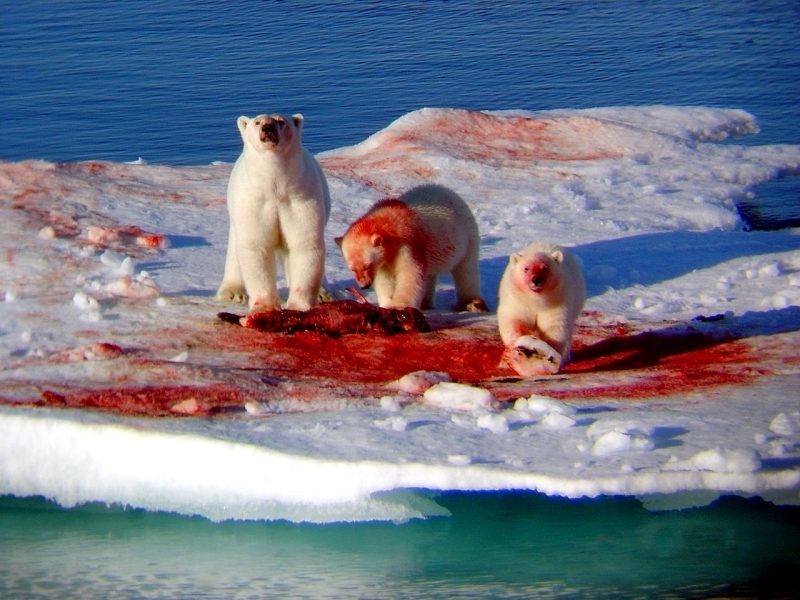 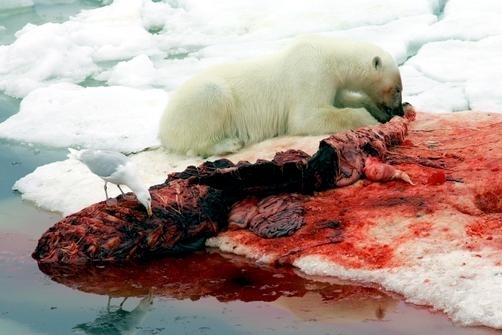 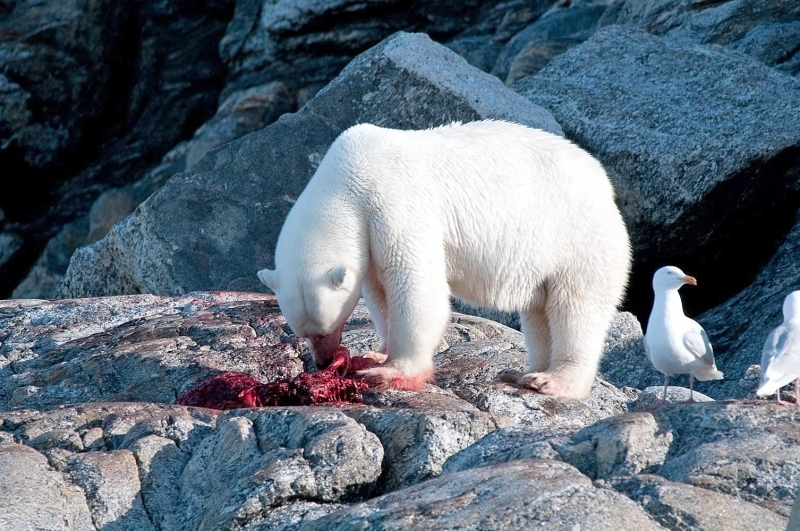 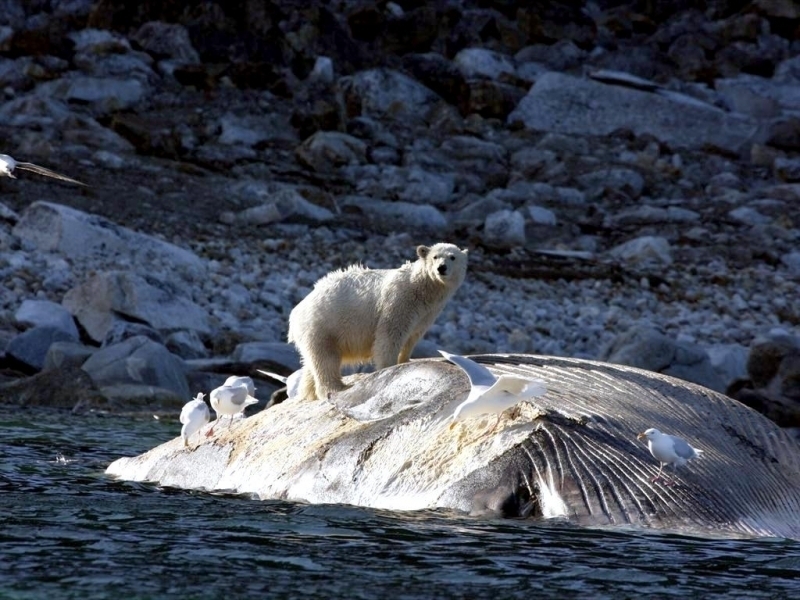 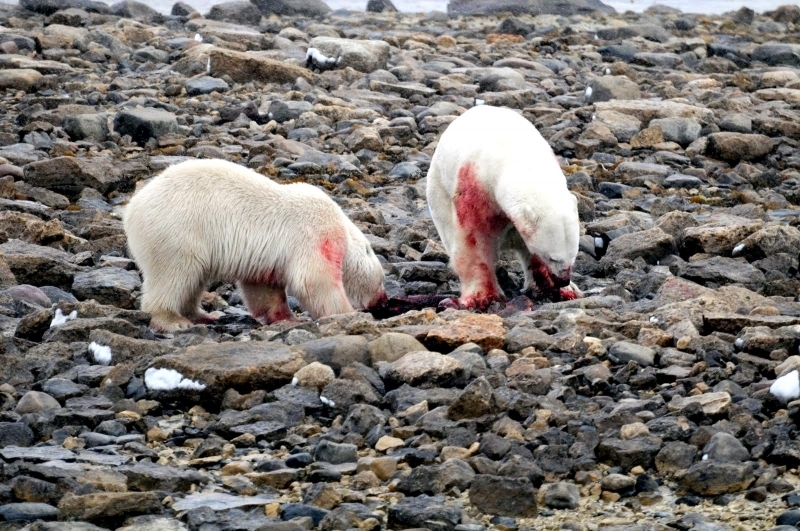 While she is in her maternity den nursing her cubs, a mother Polar Bear does not eat, drink or defecate.